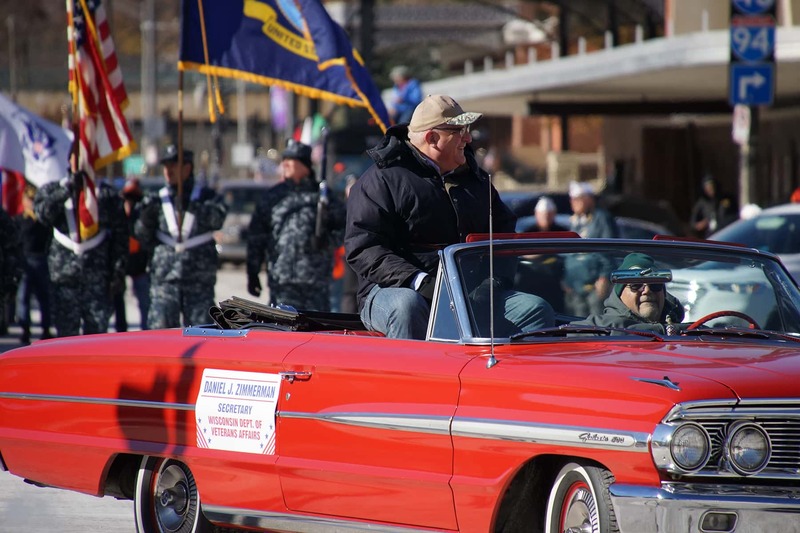 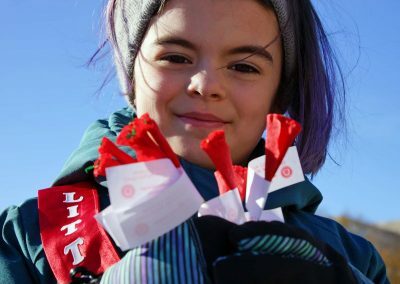 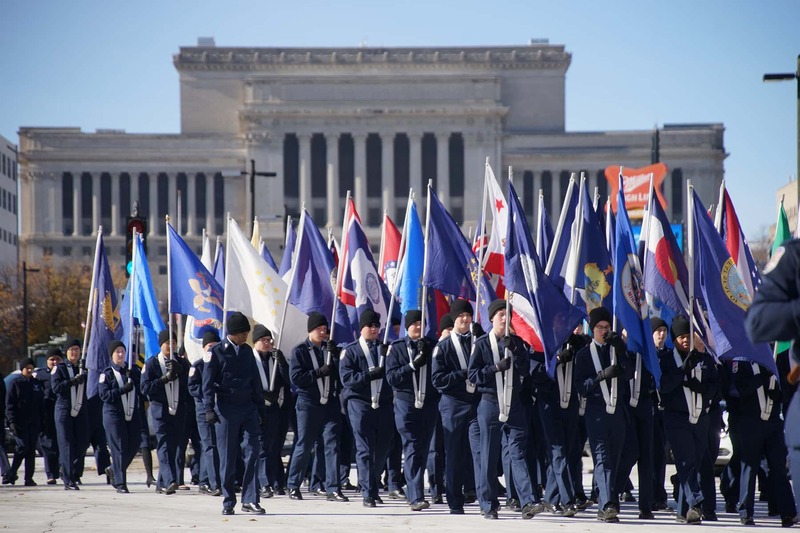 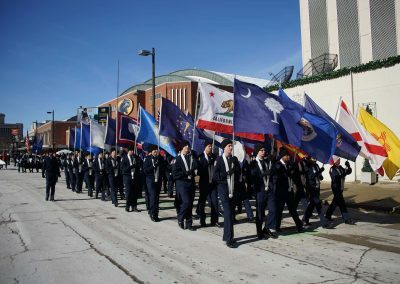 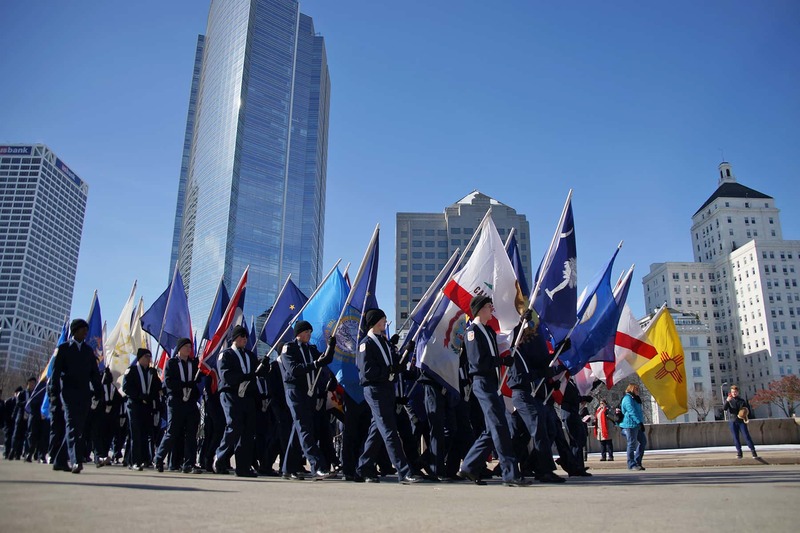 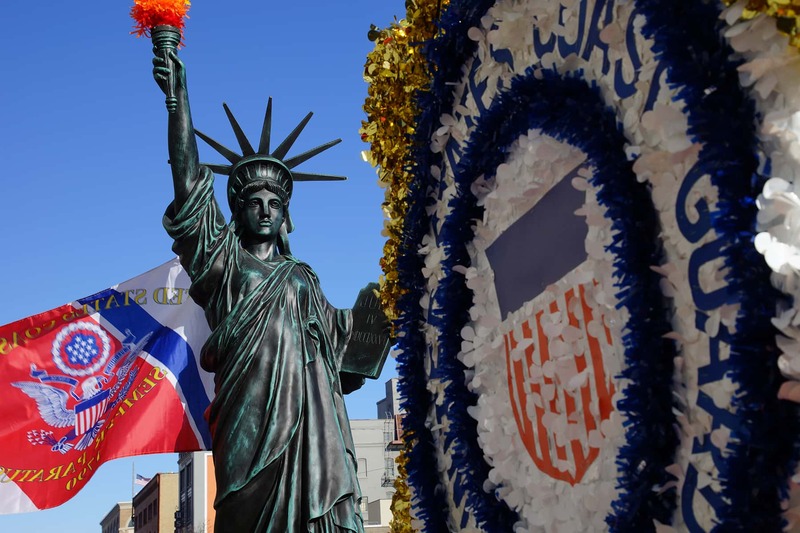 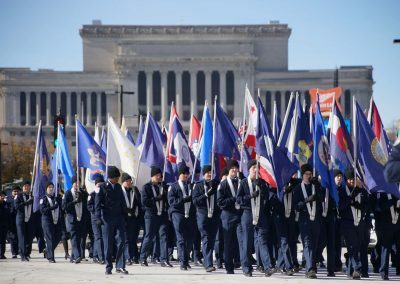 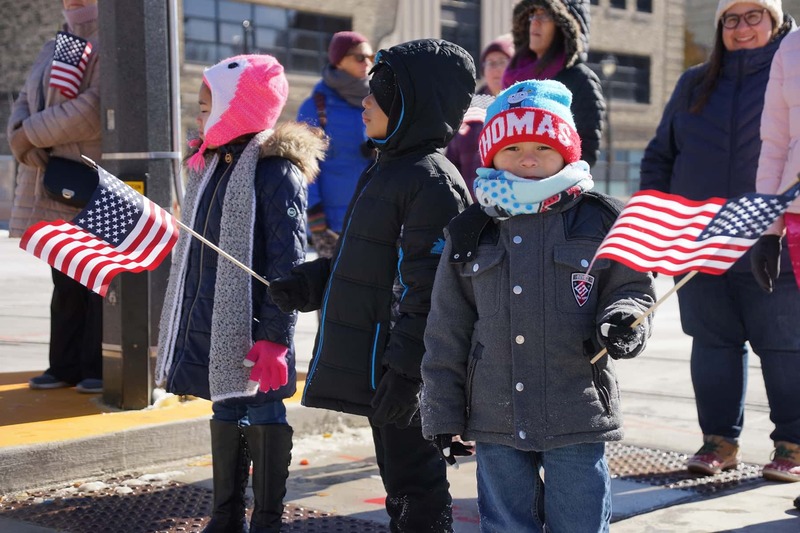 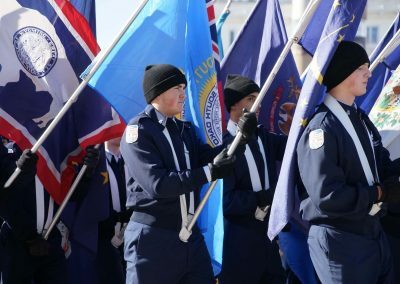 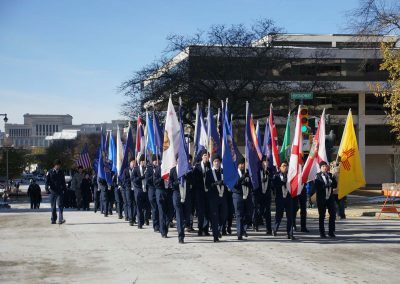 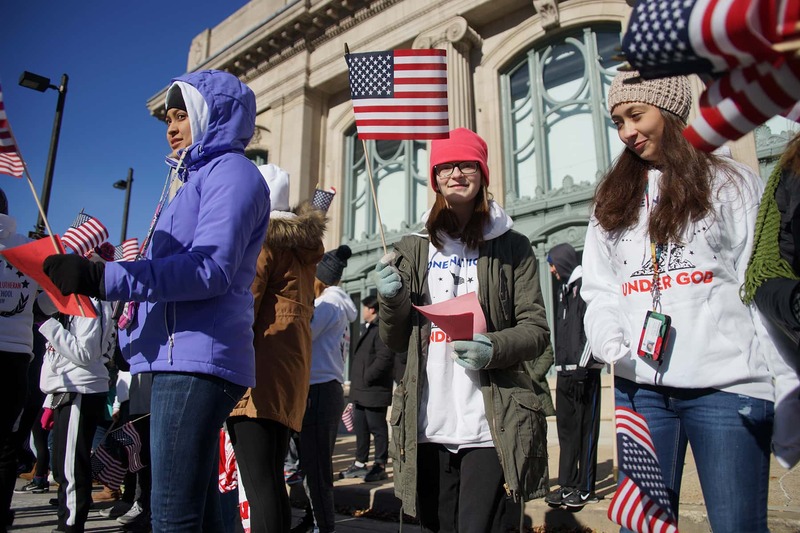 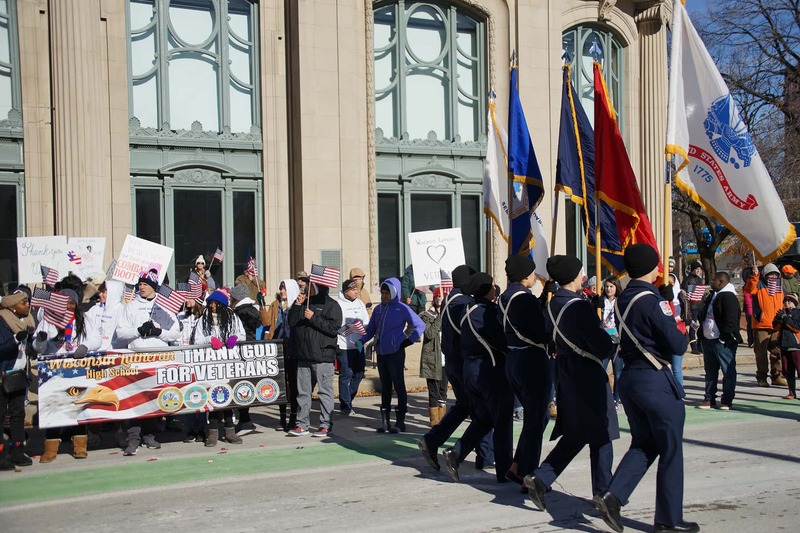 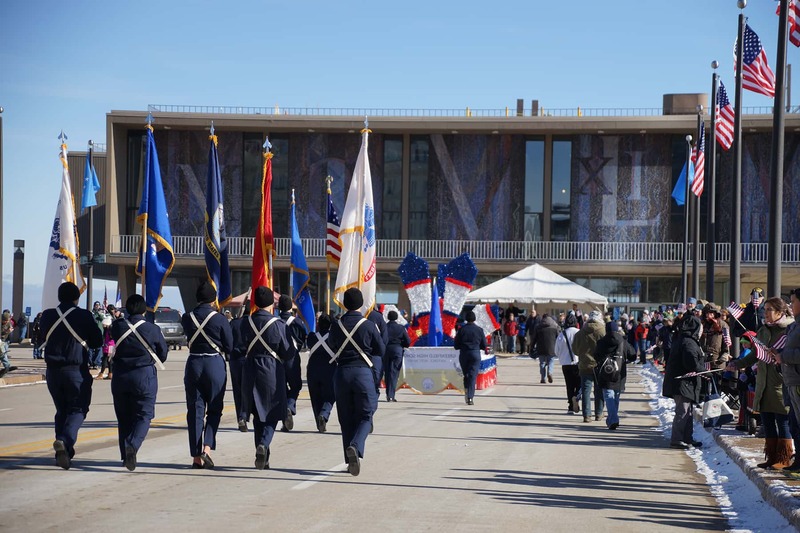 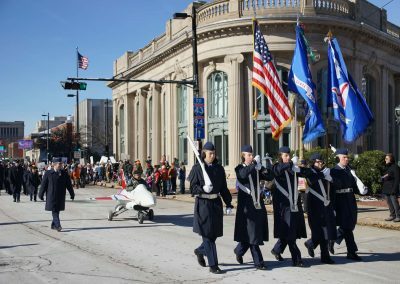 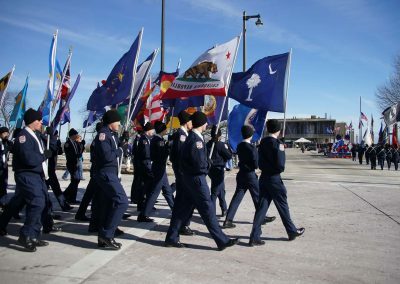 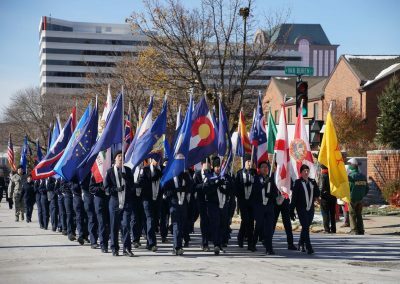 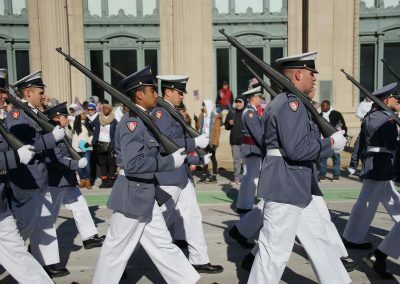 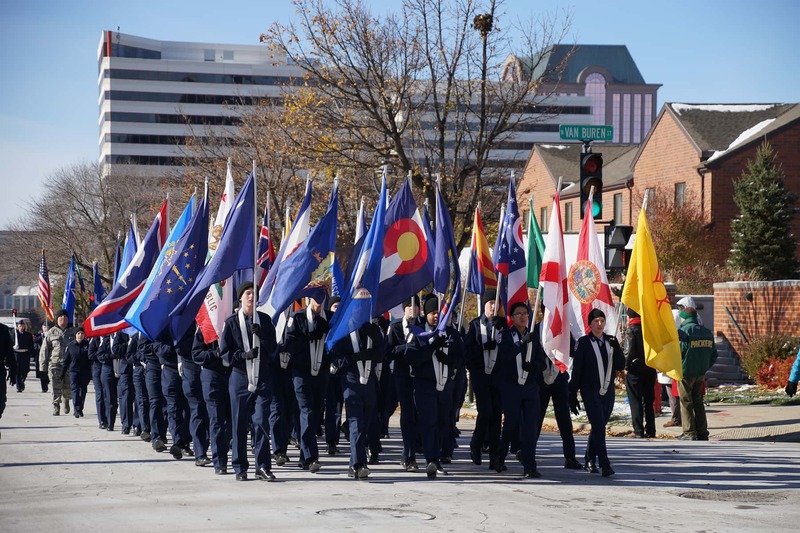 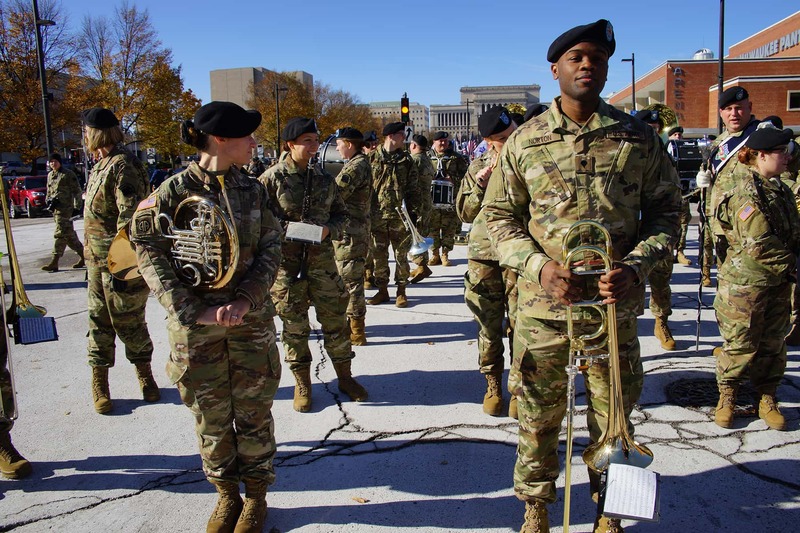 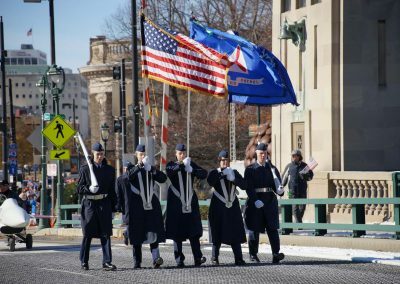 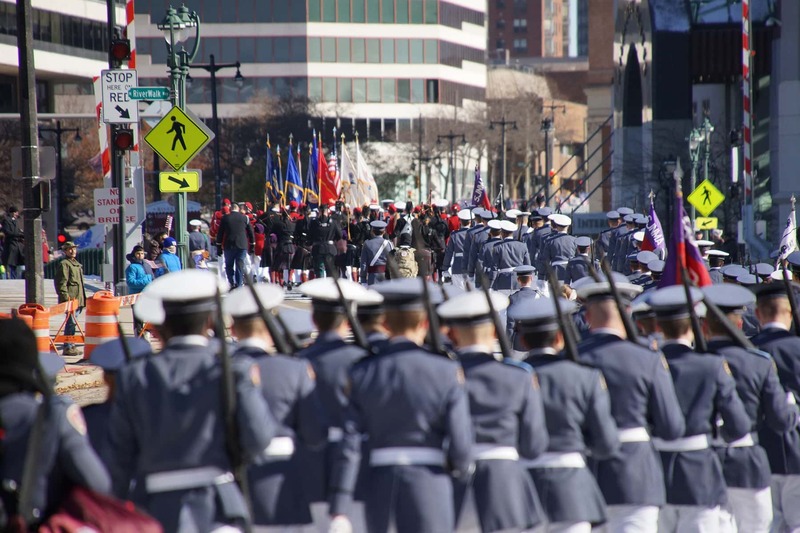 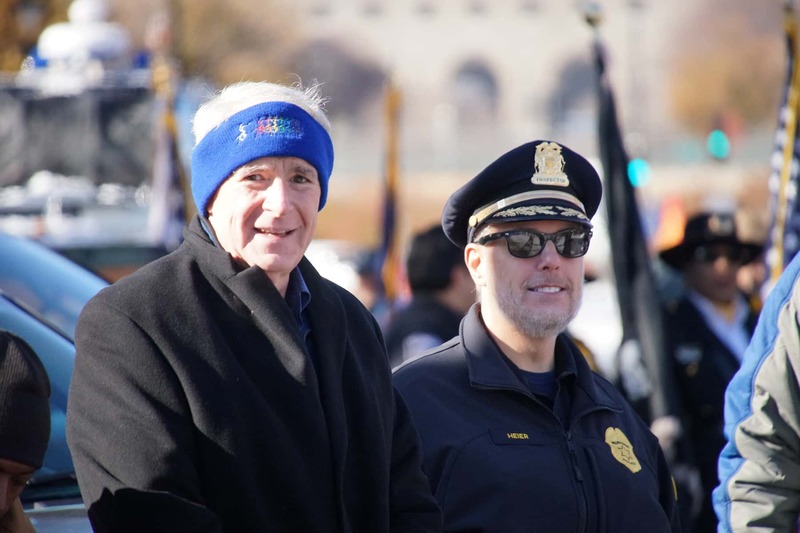 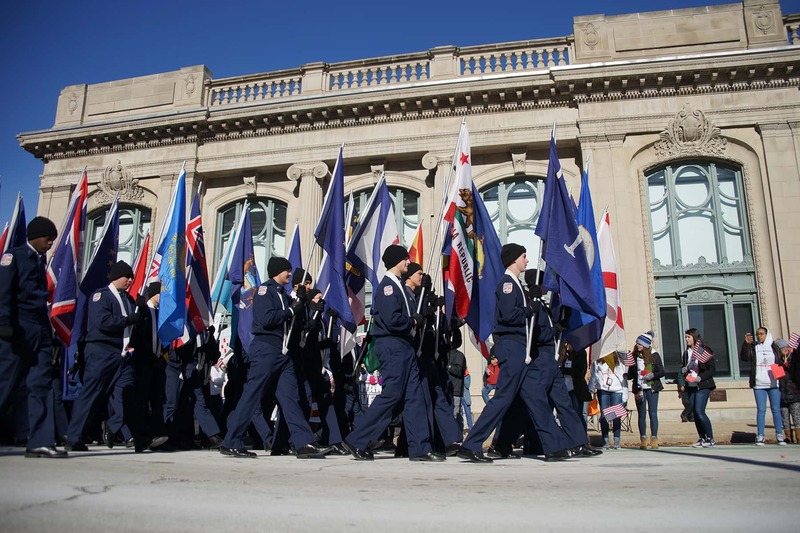 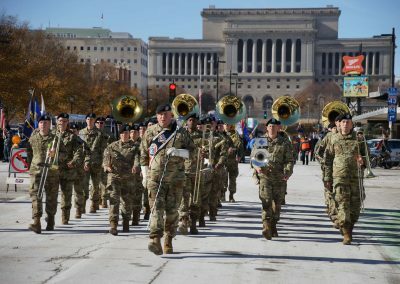 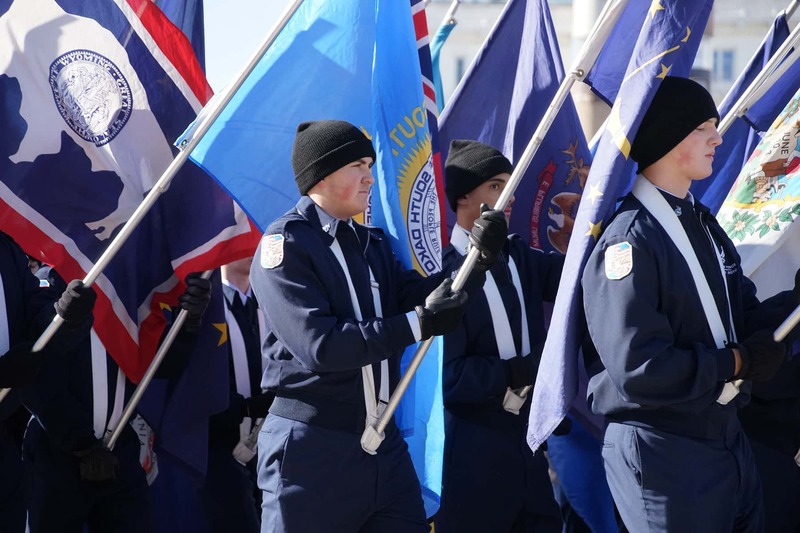 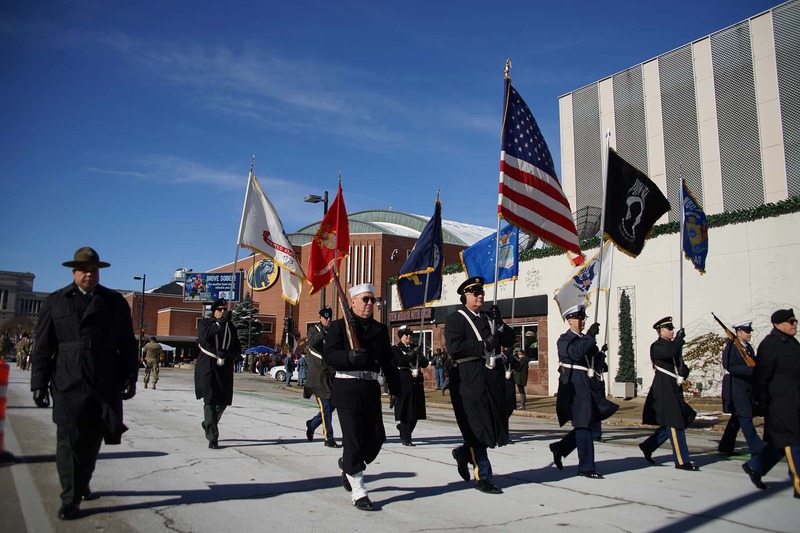 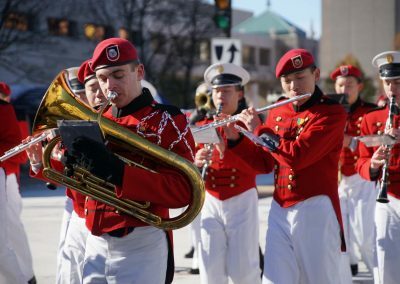 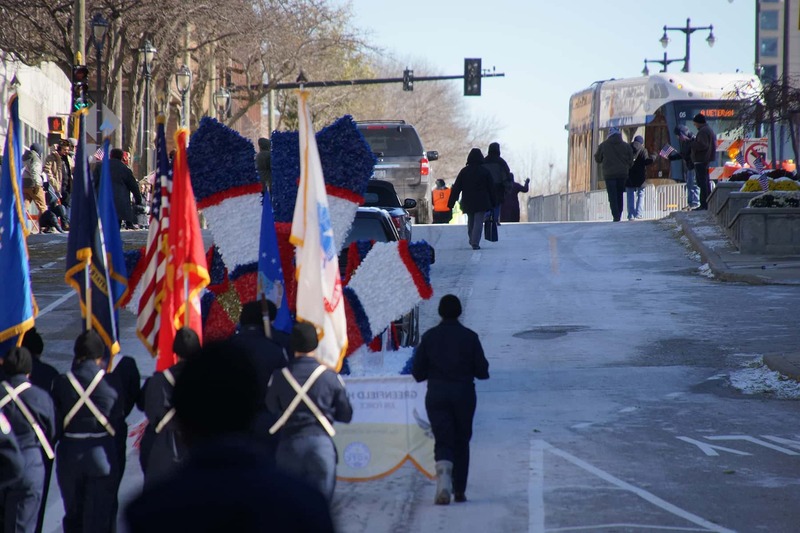 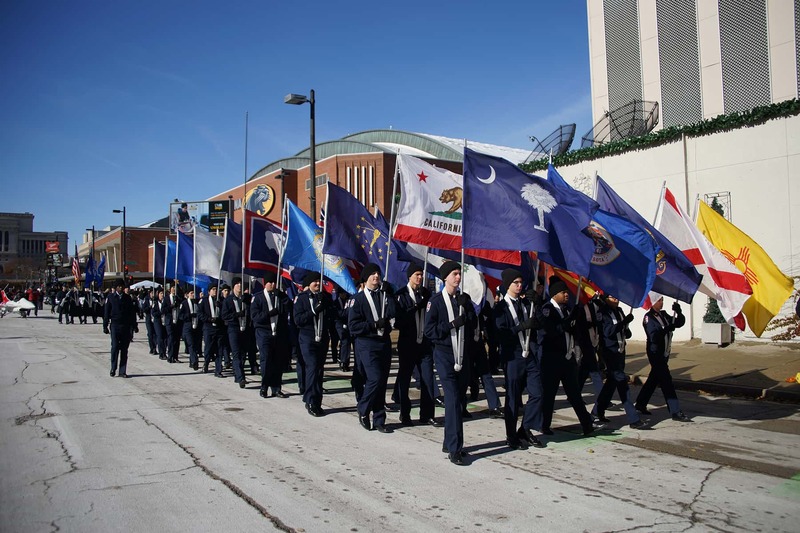 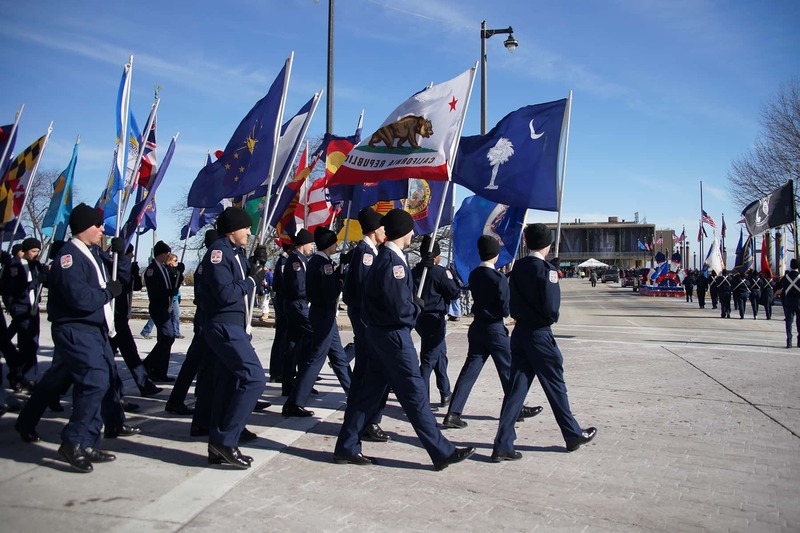 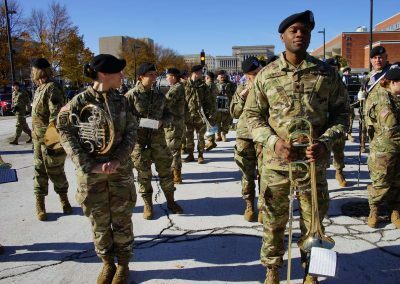 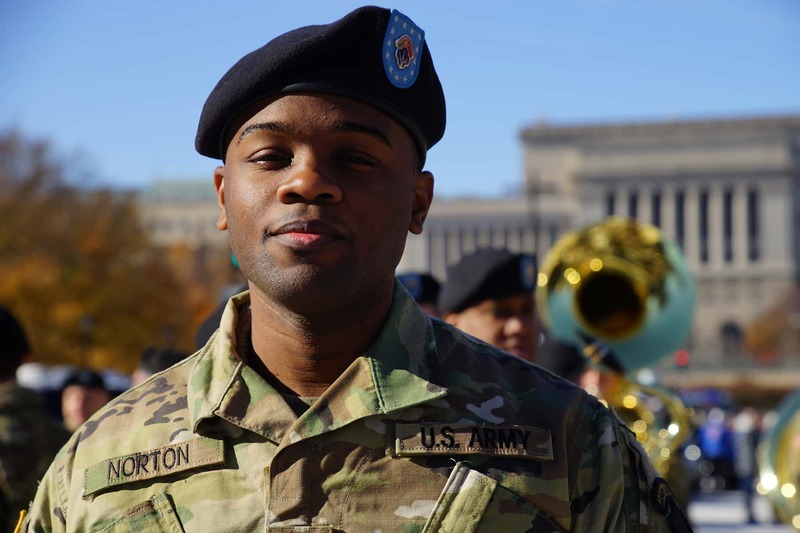 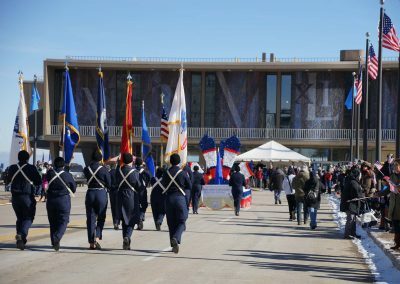 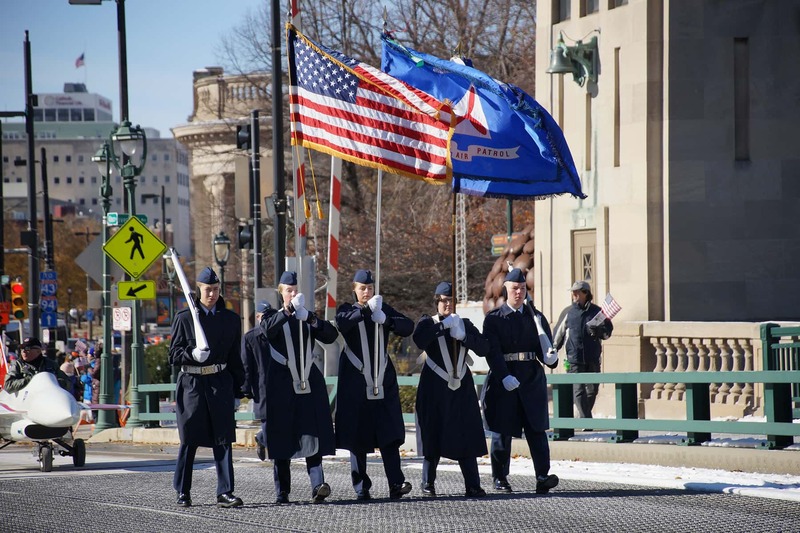 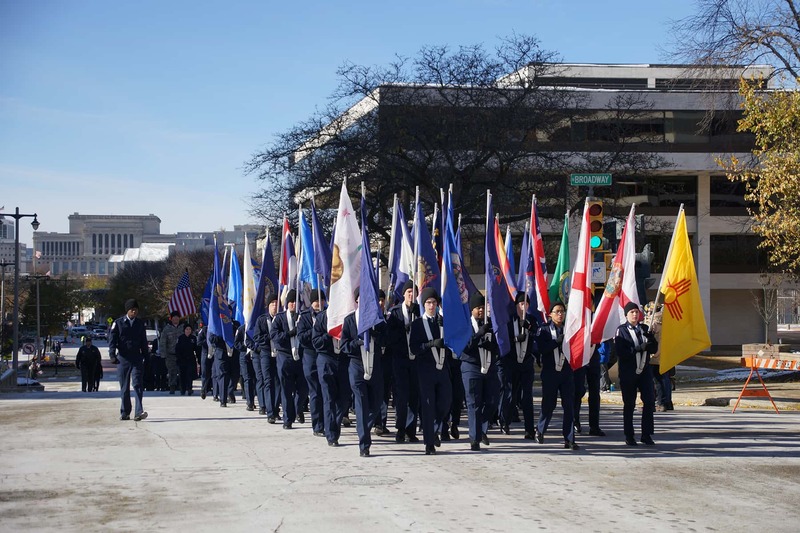 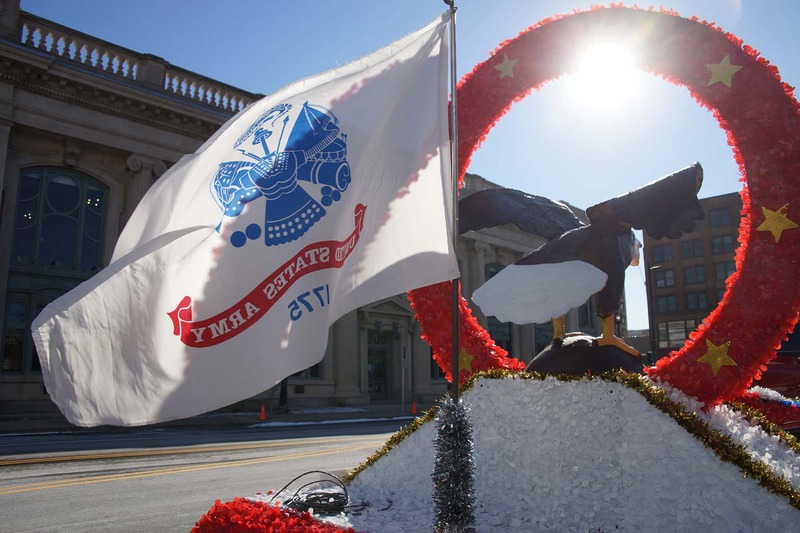 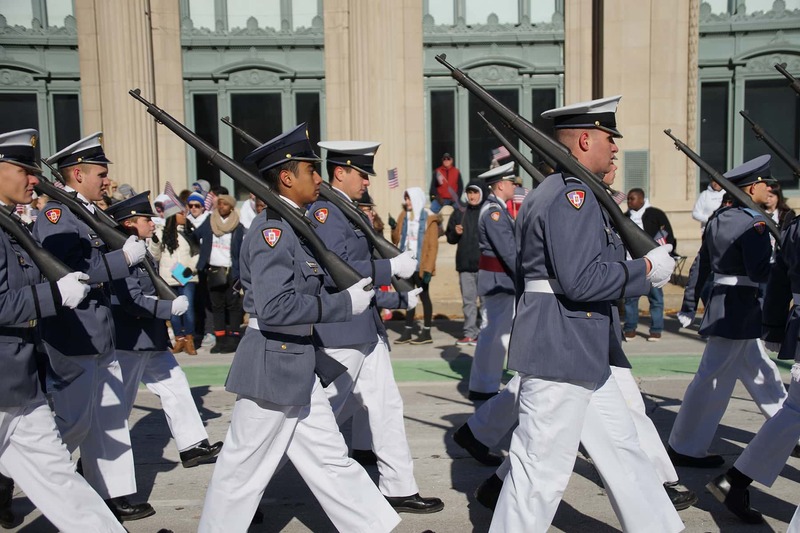 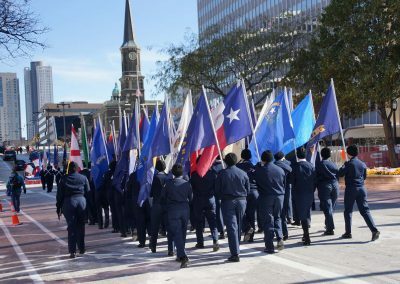 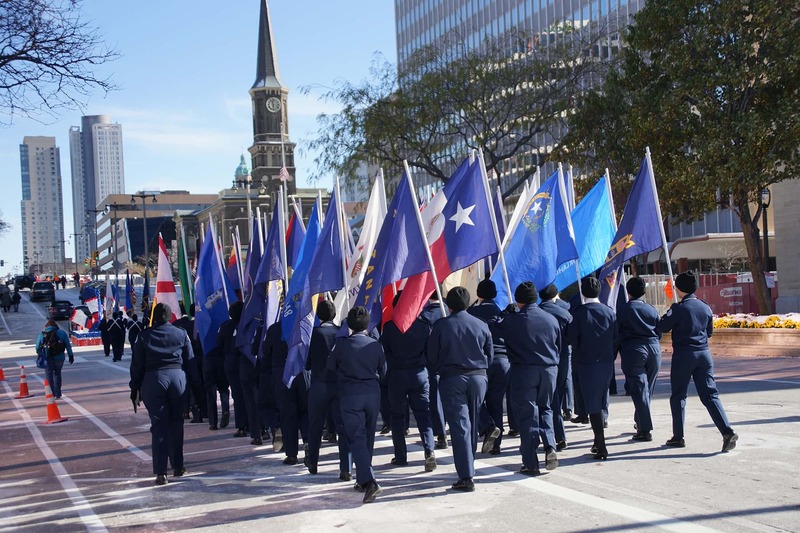 The 55th Annual Day of Honor and Parade was observed this year on November 10, and took place on the Centennial anniversary of the end of Great War that devastated the many nations from July 28, 1914 to November 11, 1918. Known and celebrated in other countries as Armistice Day, America’s Veterans Day originally marked the end of World War I, and was formally enacted in 1954 to remember all those who served in the nation’s military. 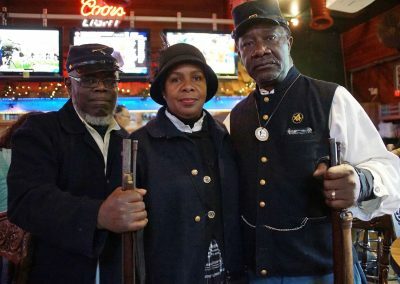 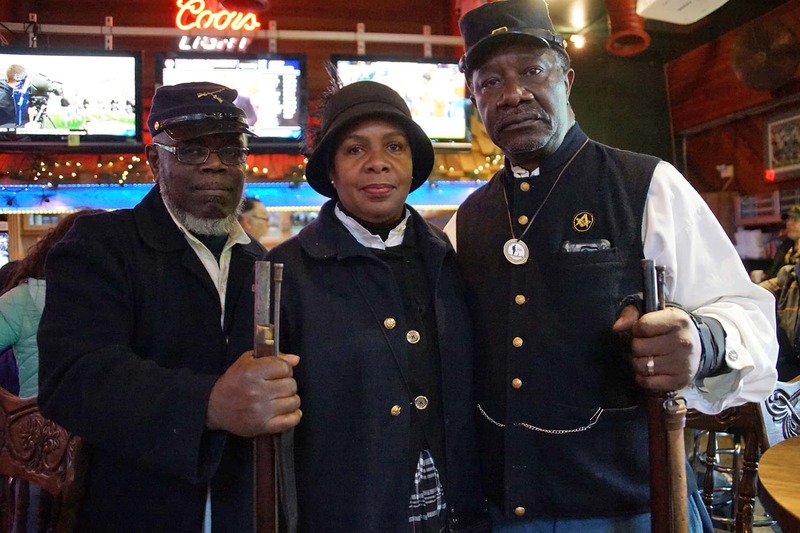 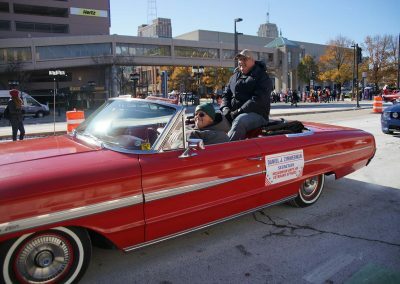 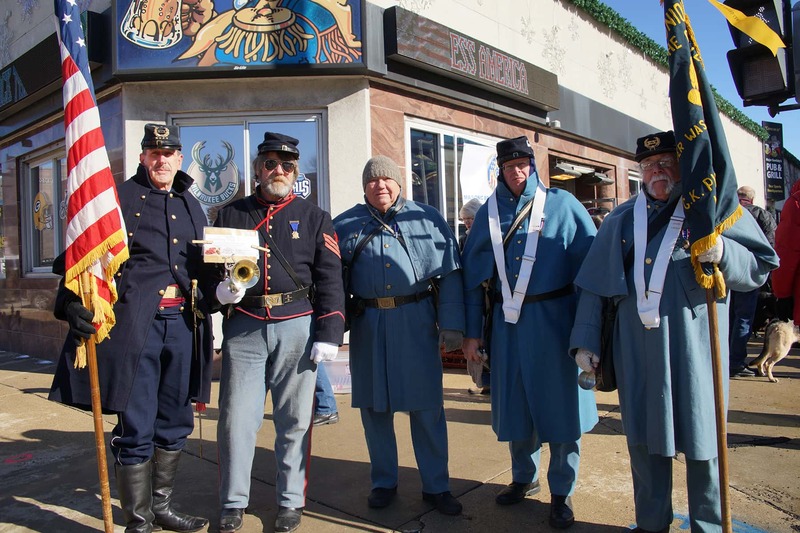 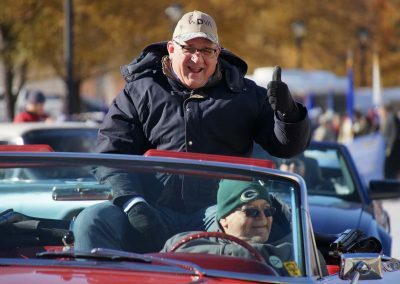 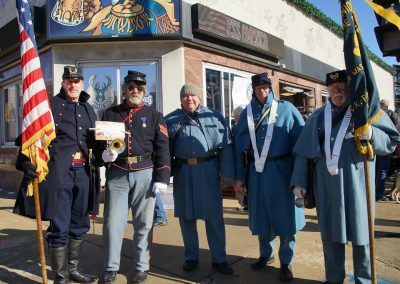 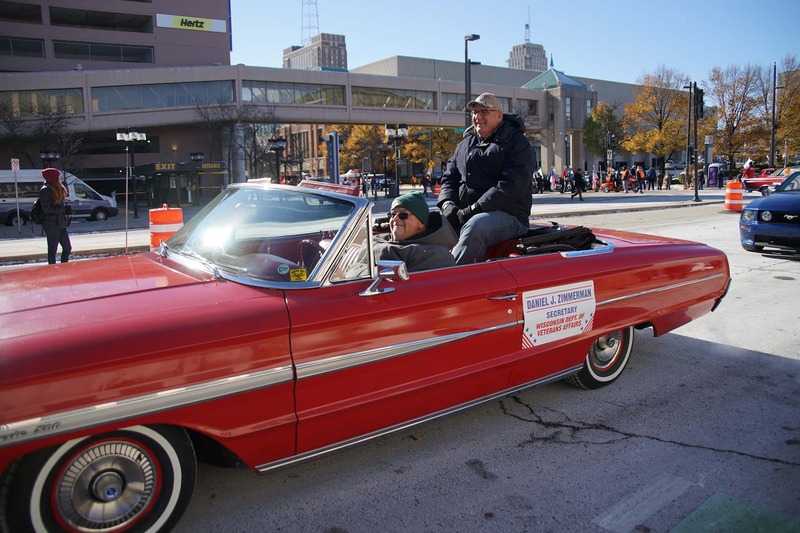 The Red Arrow Club of Milwaukee represented the Grand Marshal for the 2018 parade. 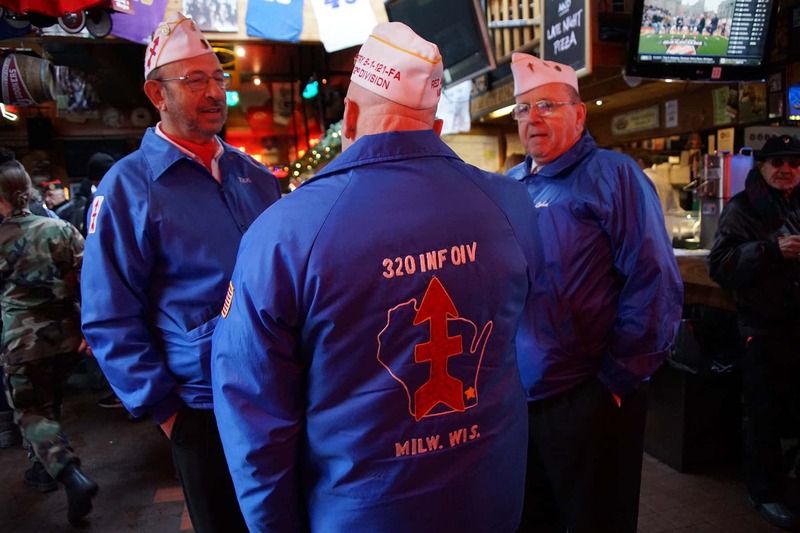 Given the “Red Arrow” nickname for its tenacity in piercing the enemy line, the 32nd Infantry Division was formed from Wisconsin soldiers. 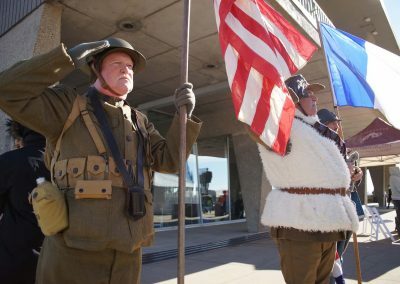 It fought primarily during World War I and World War II, with its origins rooted in the Iron Brigade from the American Civil War. 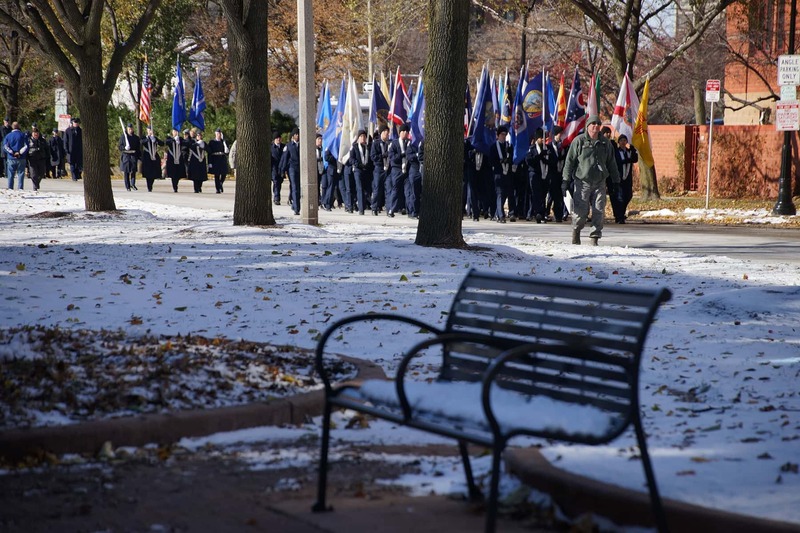 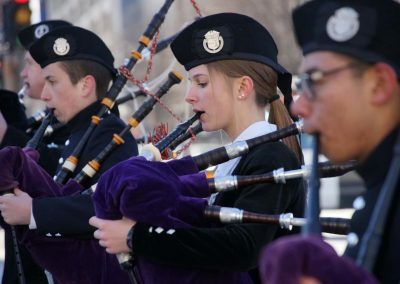 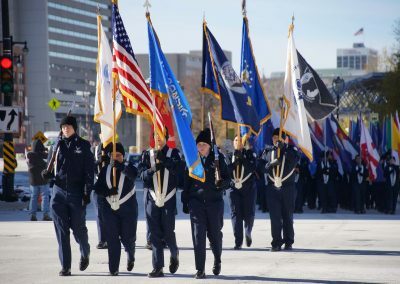 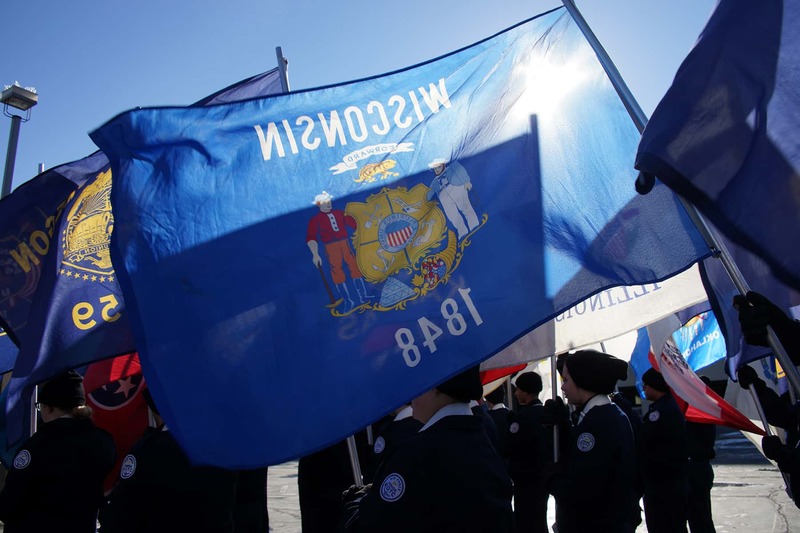 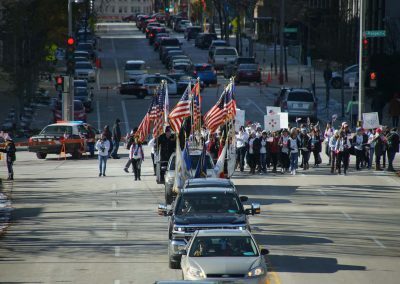 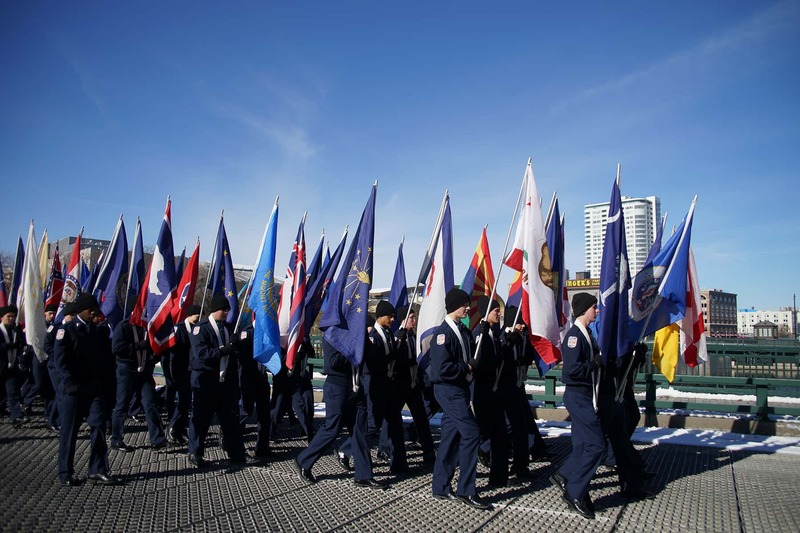 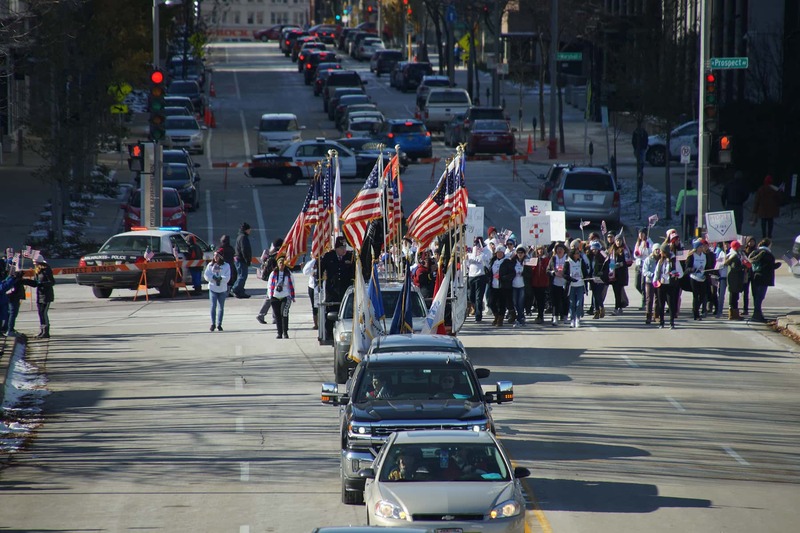 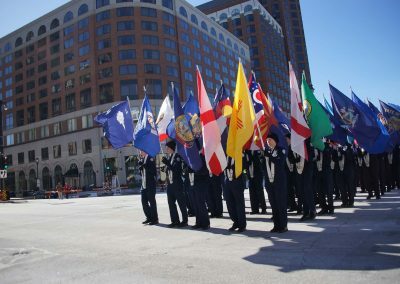 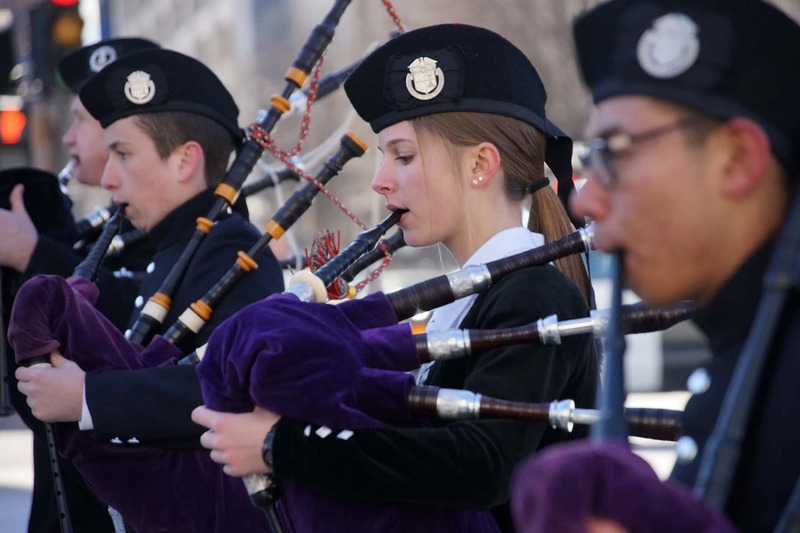 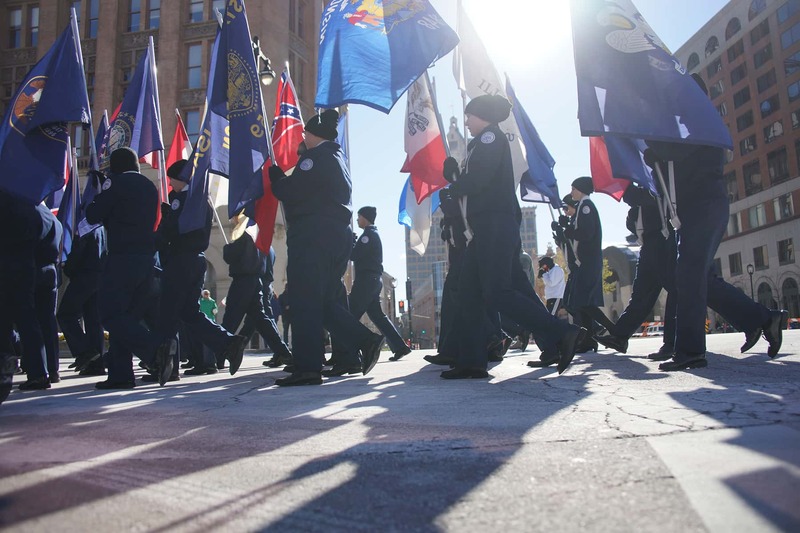 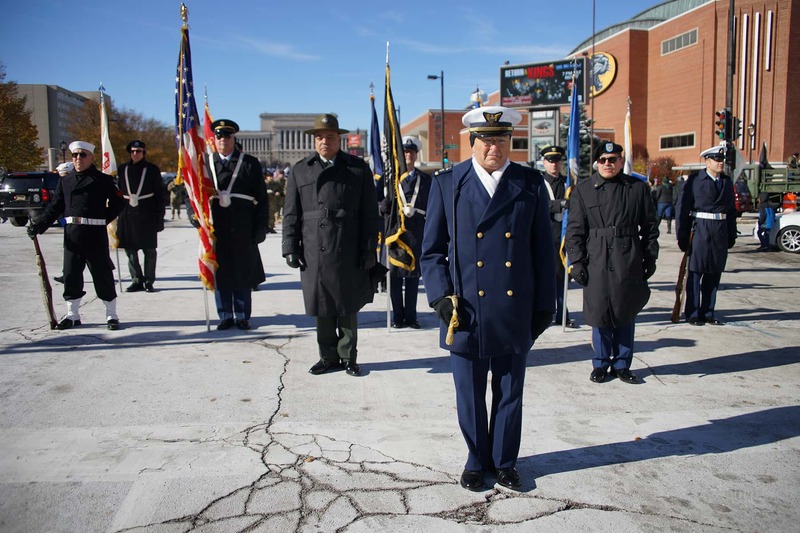 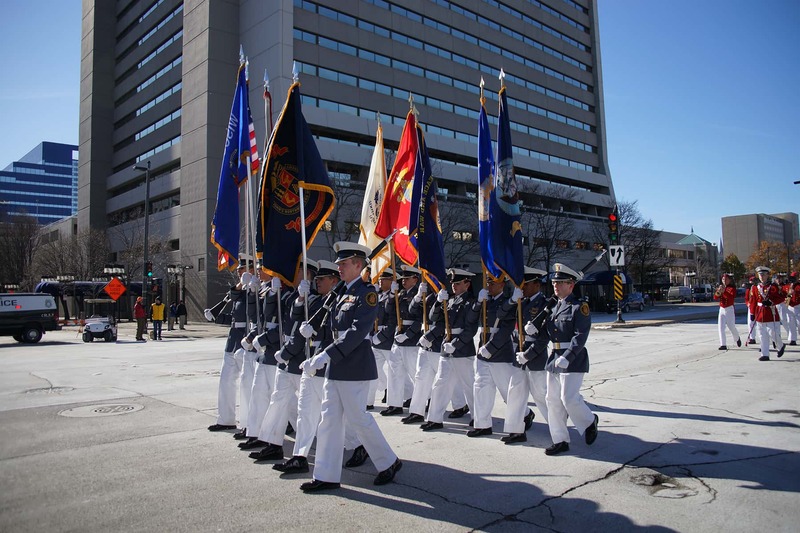 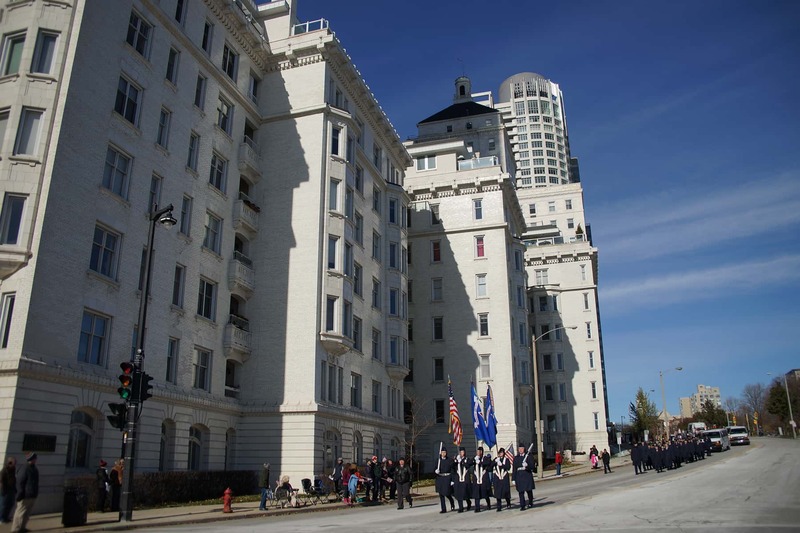 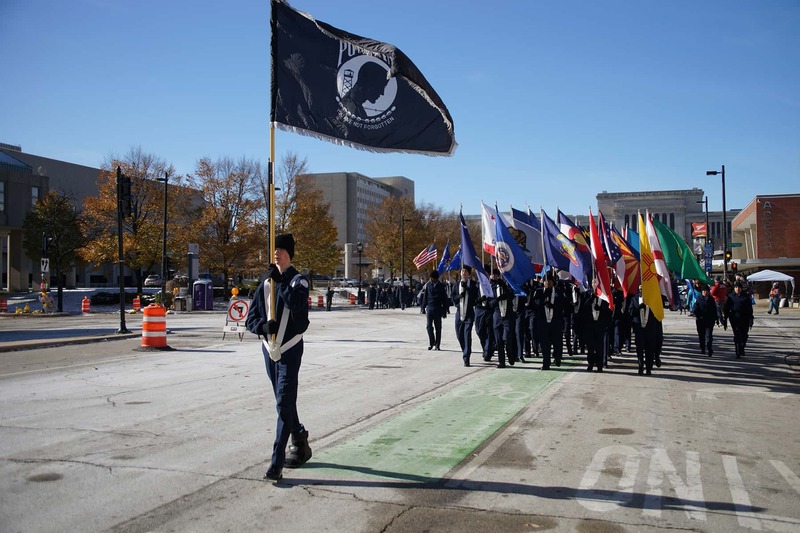 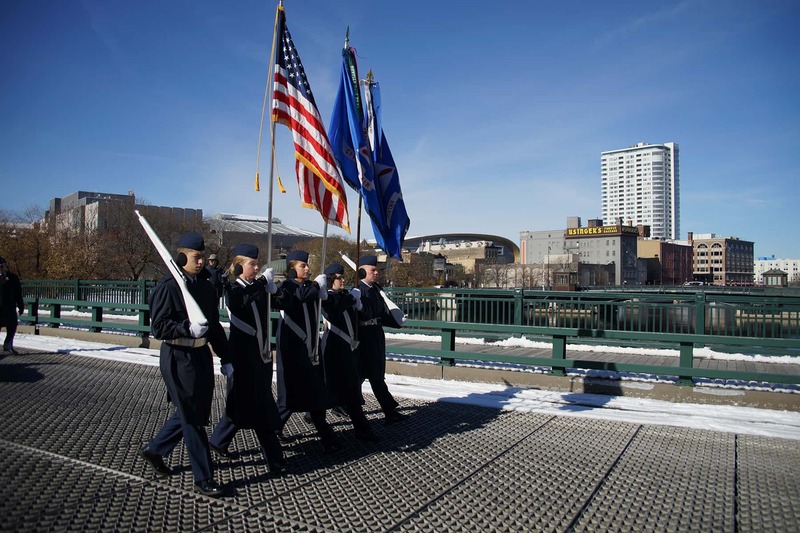 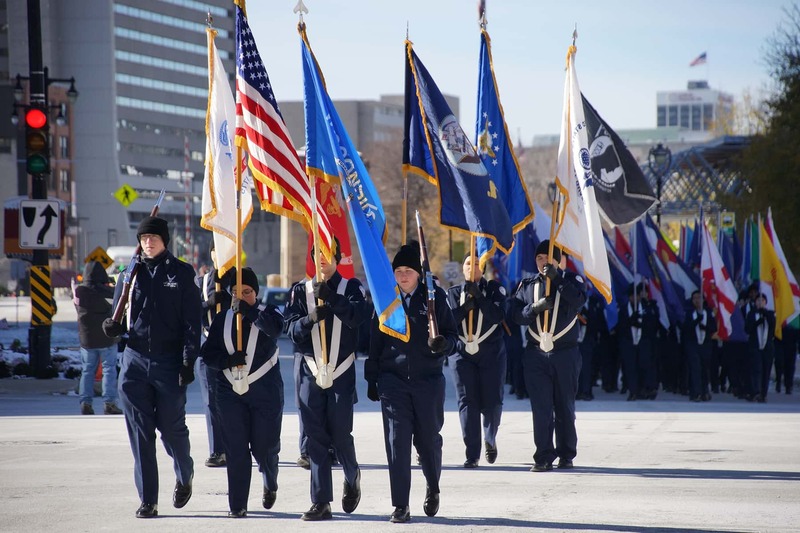 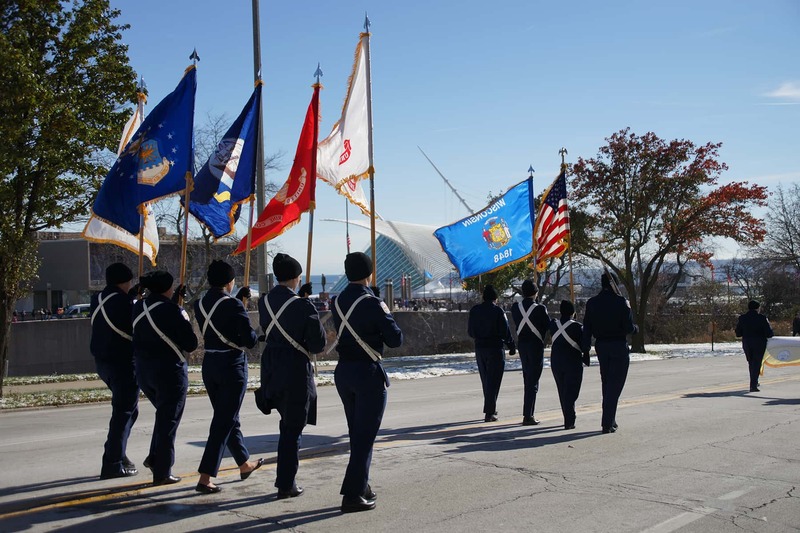 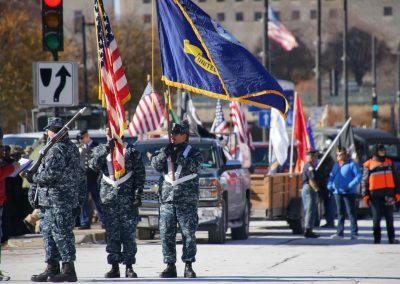 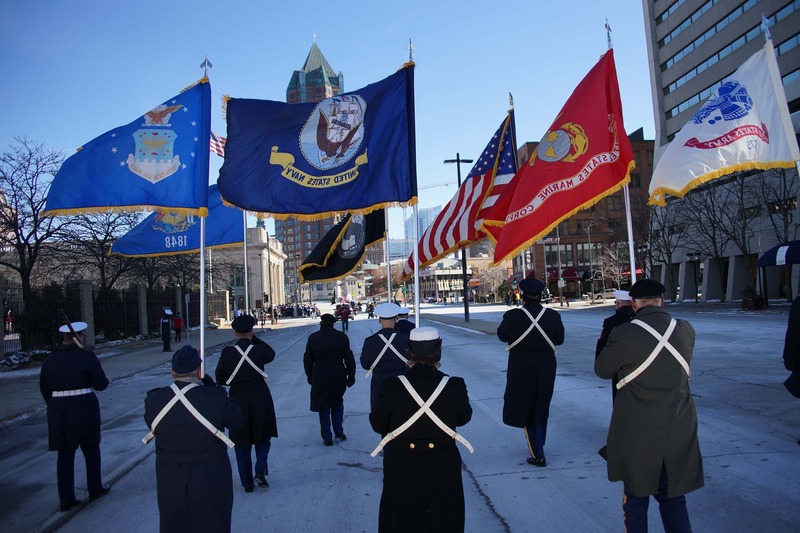 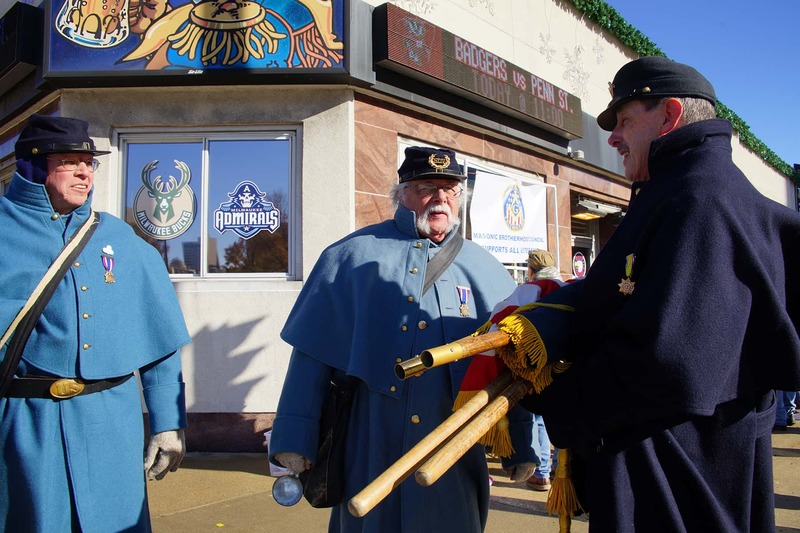 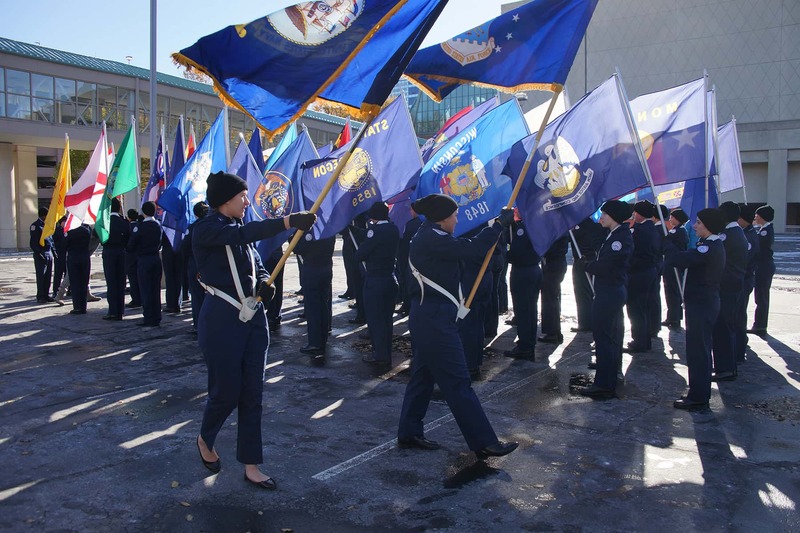 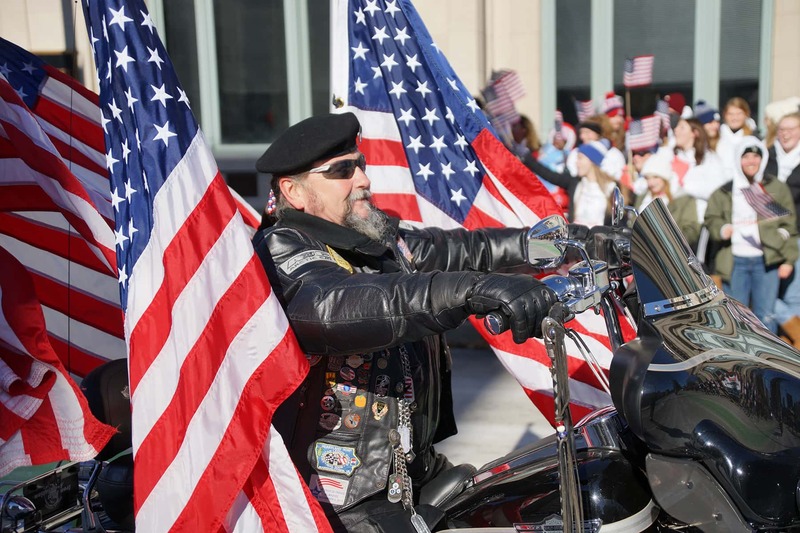 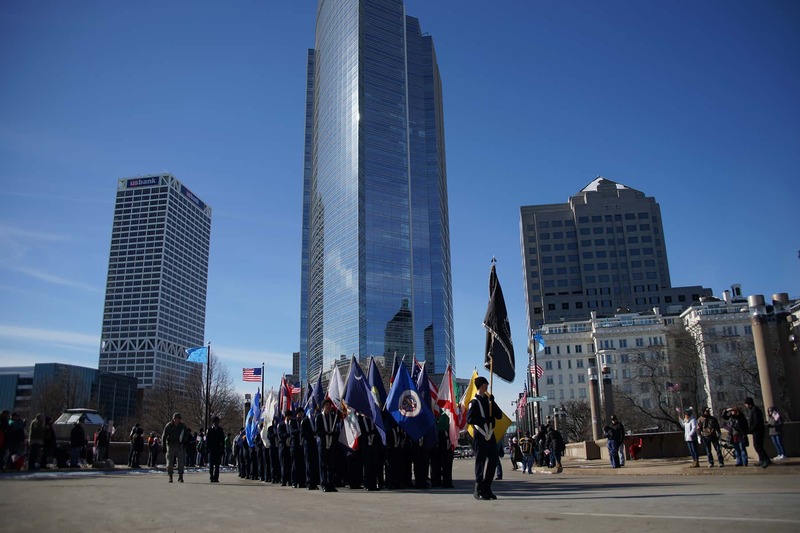 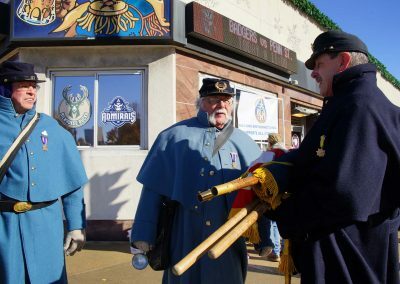 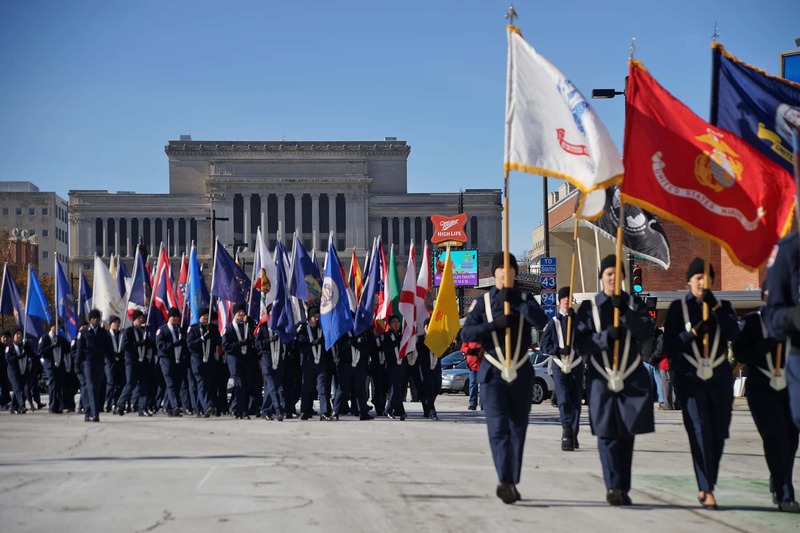 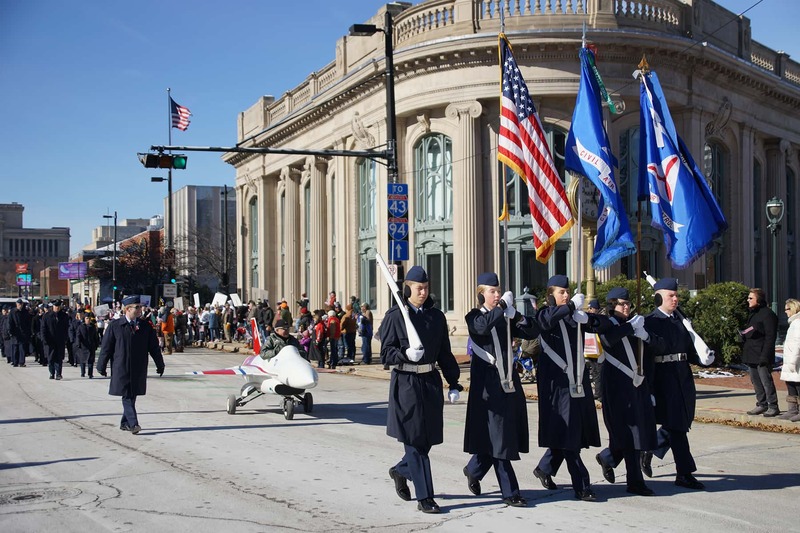 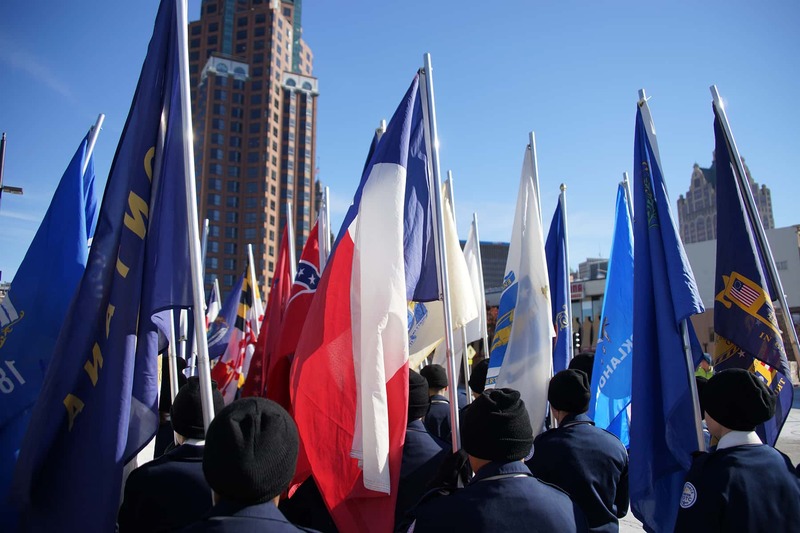 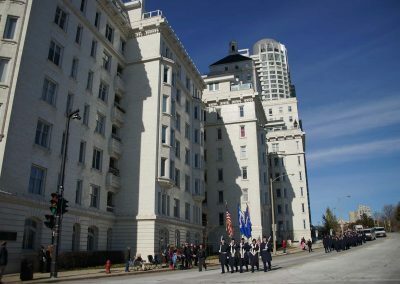 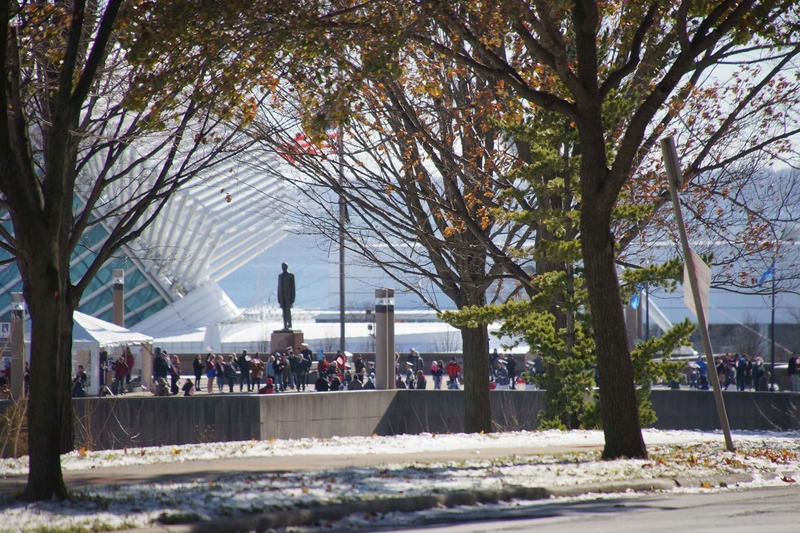 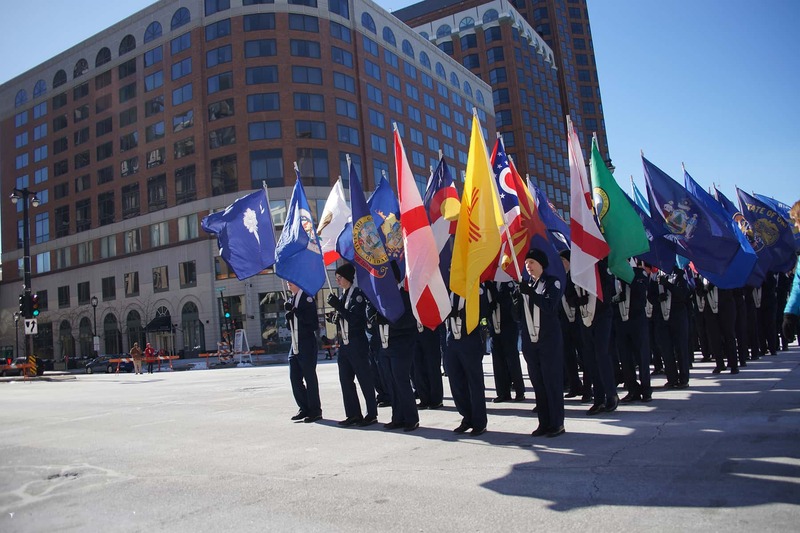 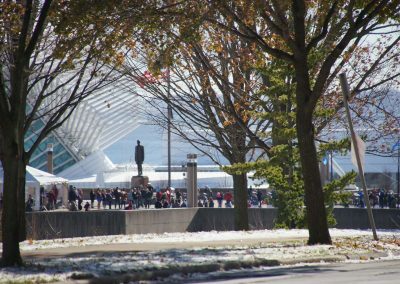 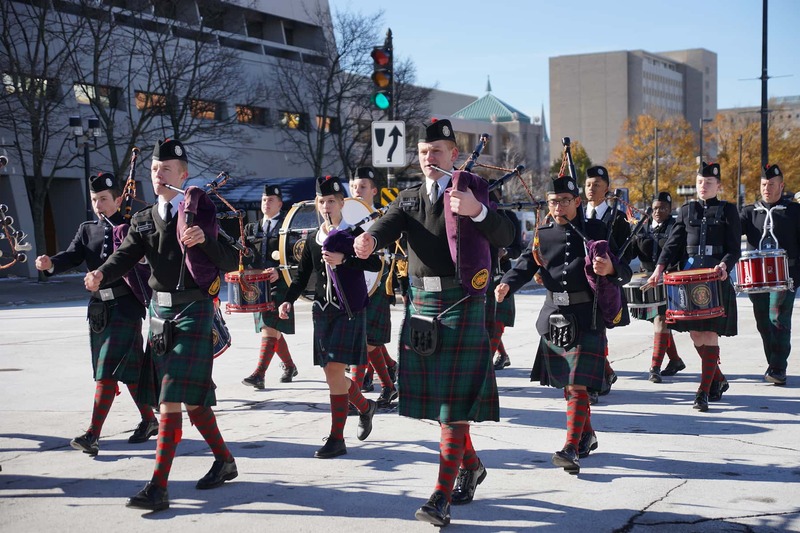 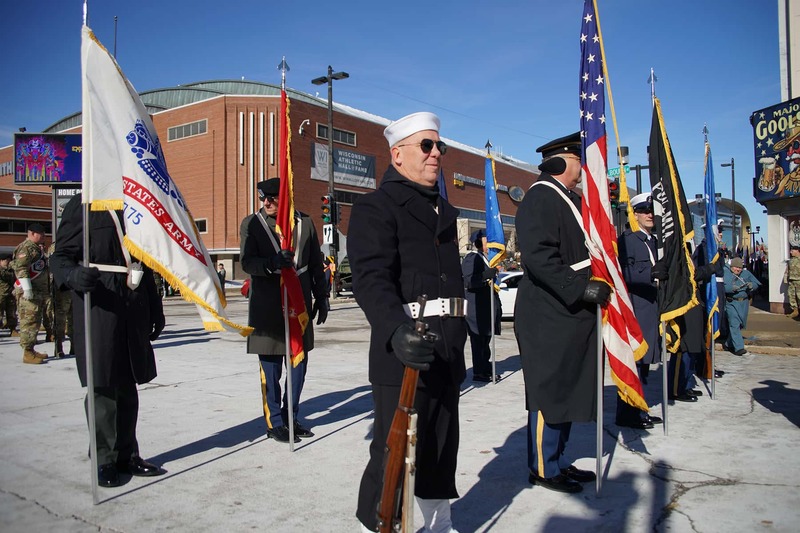 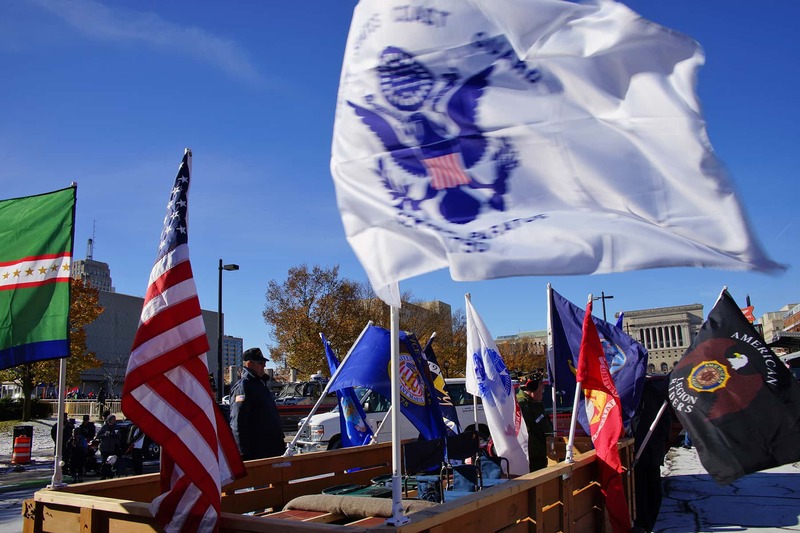 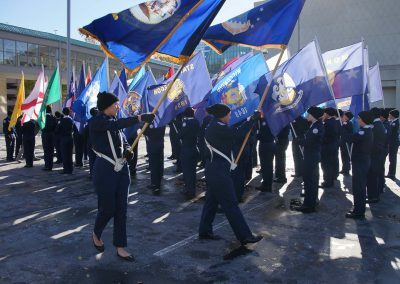 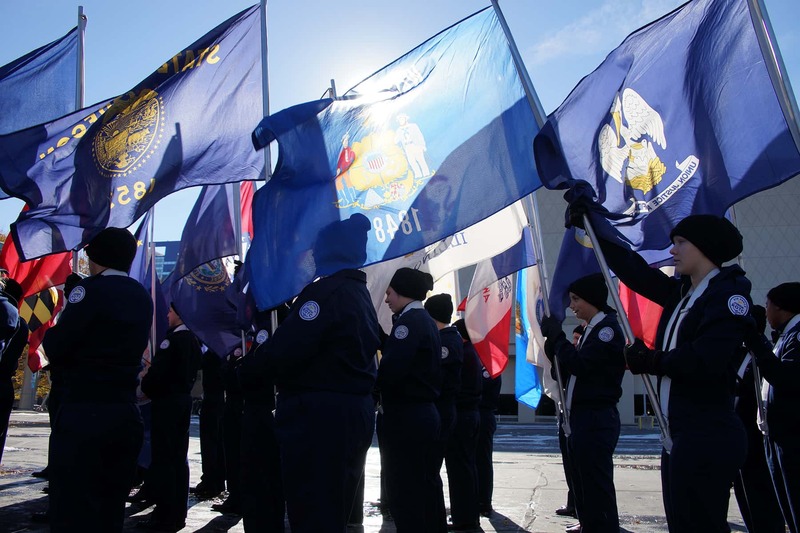 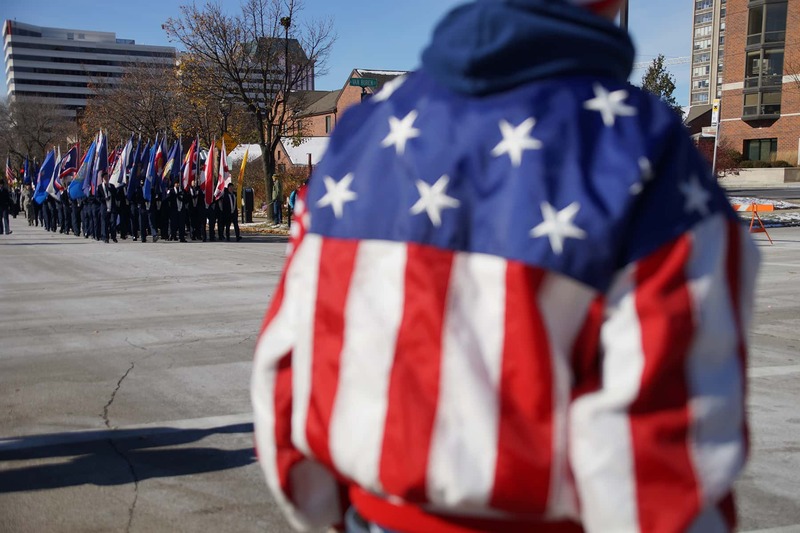 The Veterans Day of Honor and Parade in Milwaukee takes place downtown each year on the Saturday before Veterans Day. 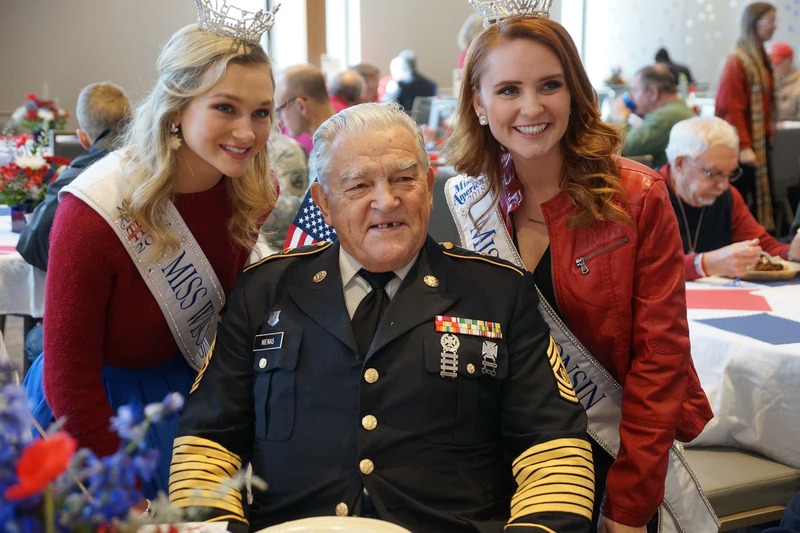 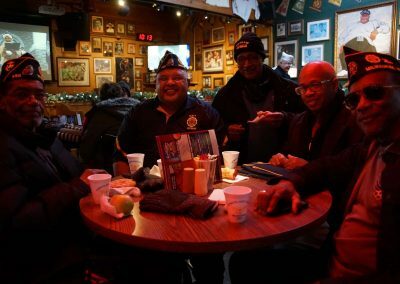 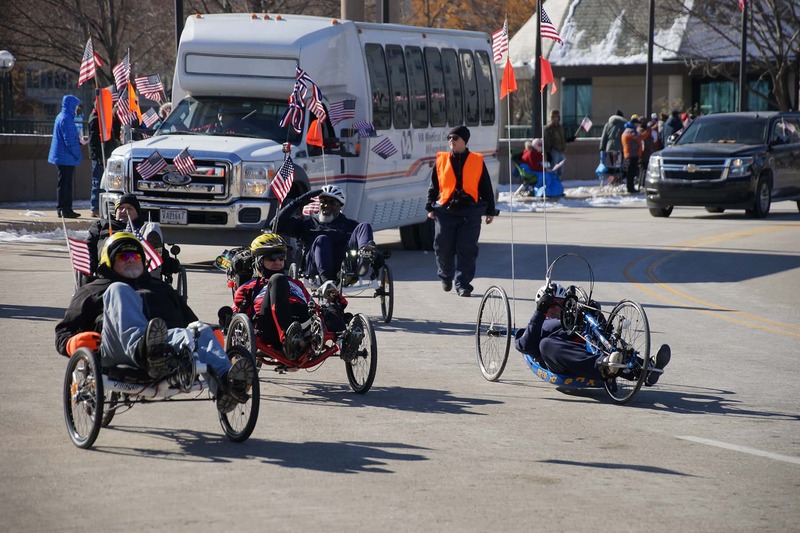 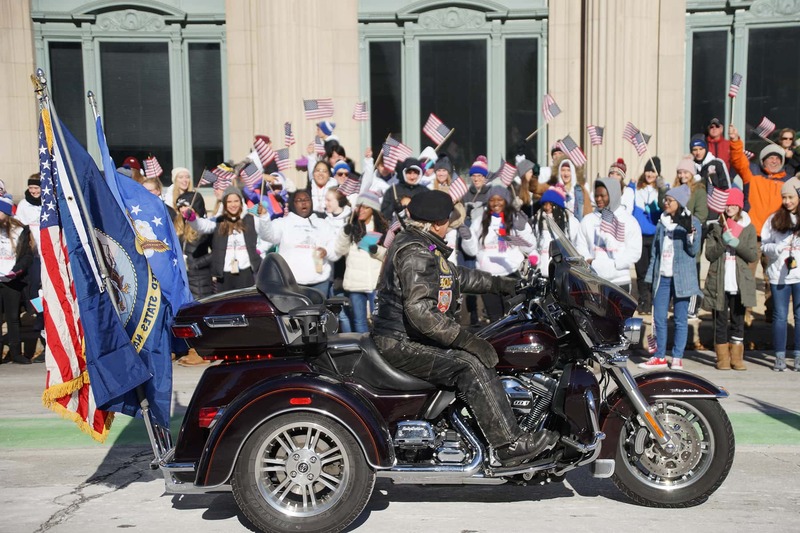 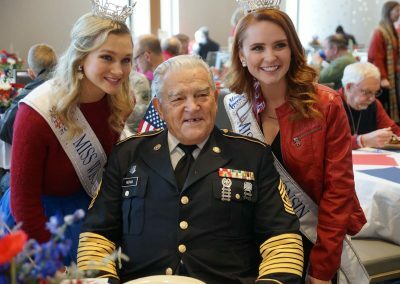 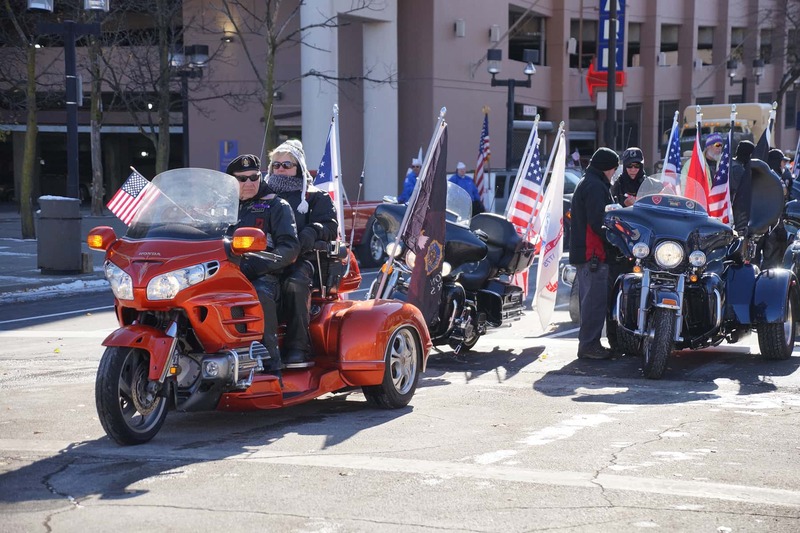 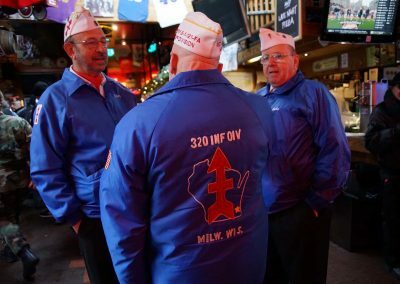 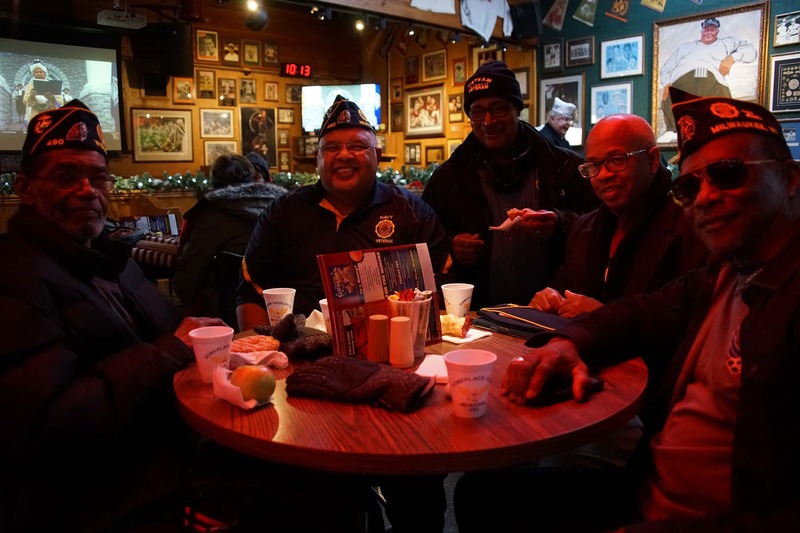 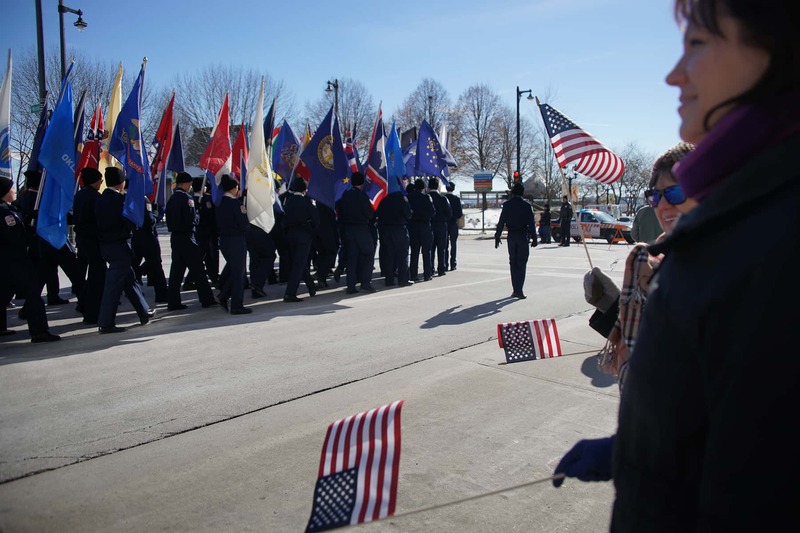 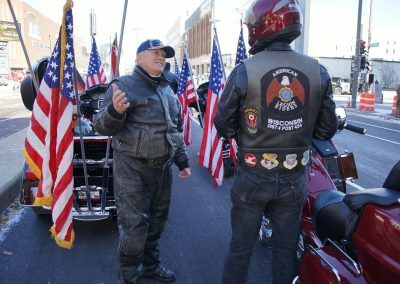 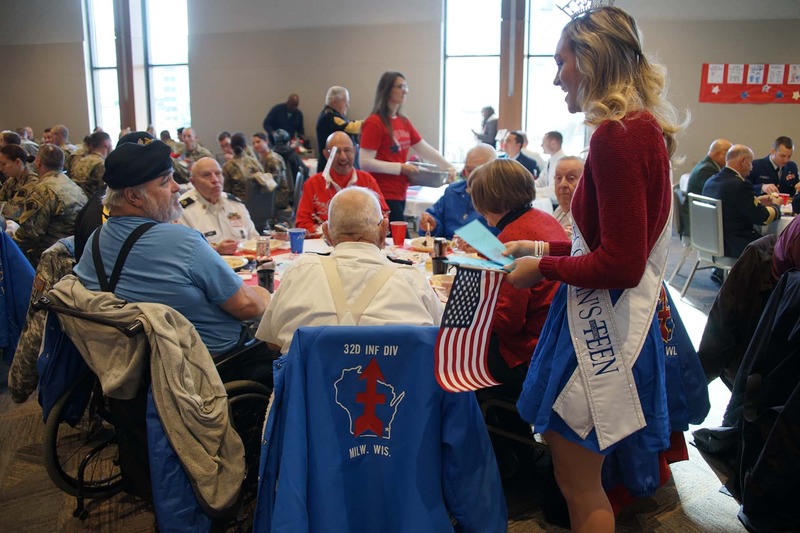 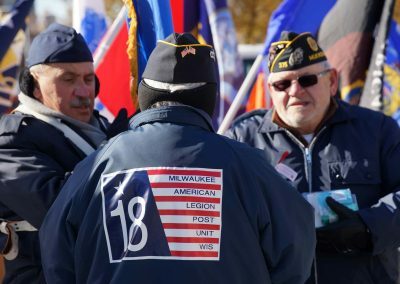 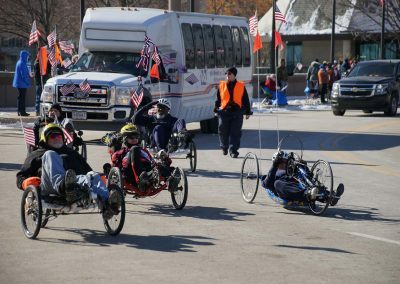 More than 1,000 veterans and members currently serving in America’s armed forces participated in this year’s event, coming from all over southeastern Wisconsin. 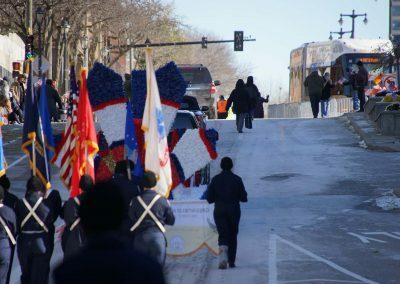 Out of respect for the Veterans Day Parade, The Hop adjusted its Streetcar service to accommodate the parade route along Kilbourn Avenue. 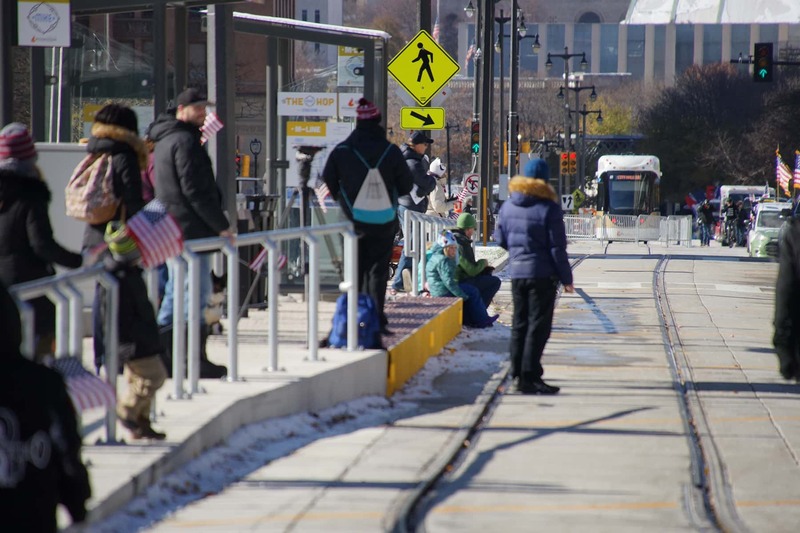 The northern portion of The Hop’s route was temporarily suspended for the duration of the event. 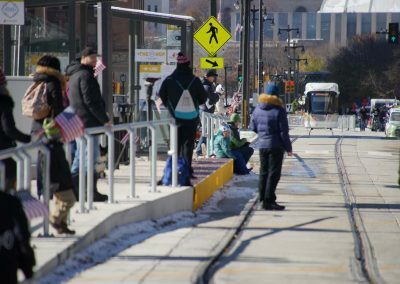 Streetcars remained in service throughout the day, but travelled in a condensed loop during the parade. 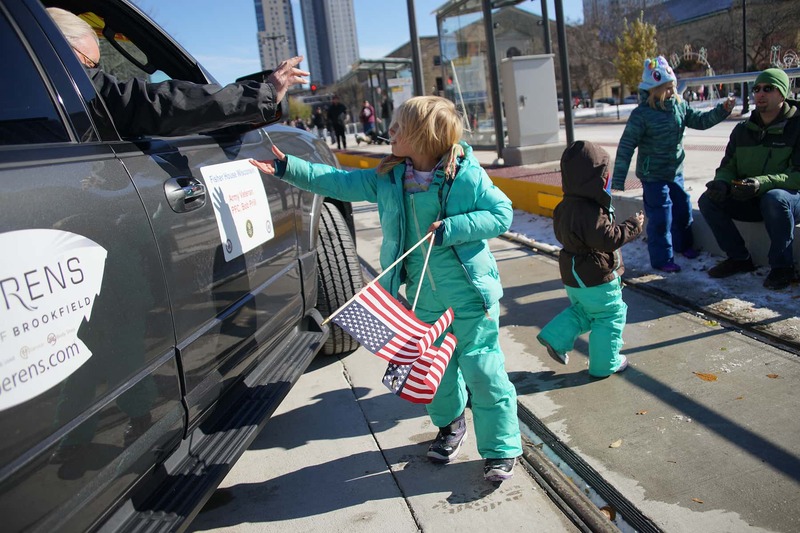 Vehicles also displayed a “Thank a Veteran” message on their external LED screens. 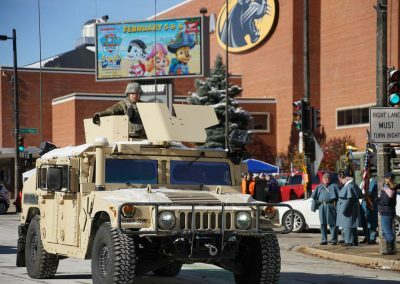 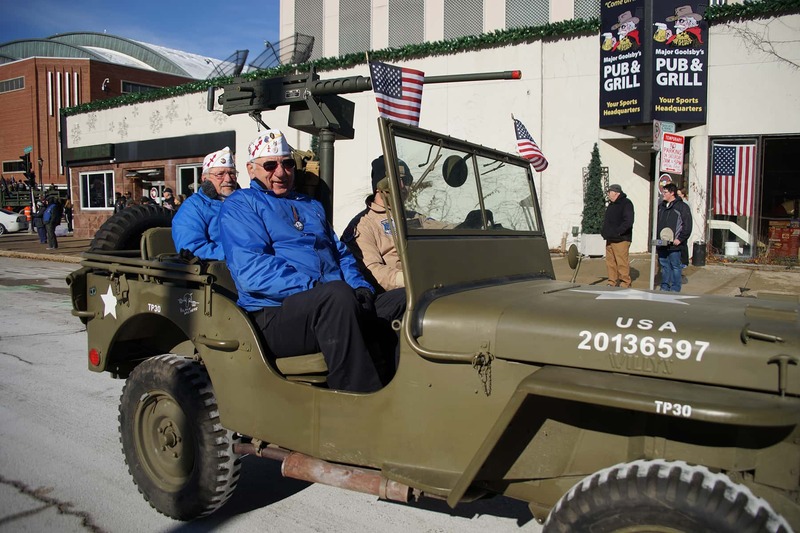 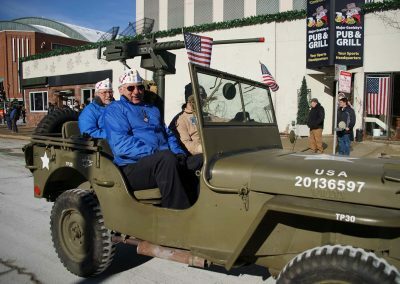 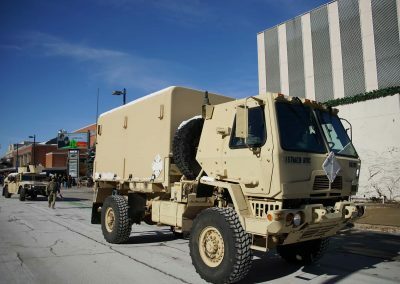 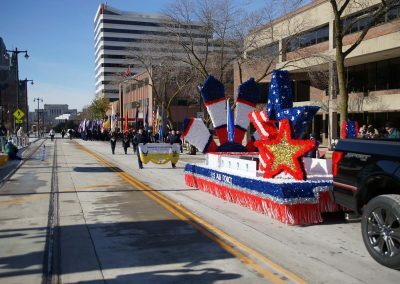 The parade included floats, marching bands, baton twirlers, vintage vehicles, and equipment used by Wisconsin military units. 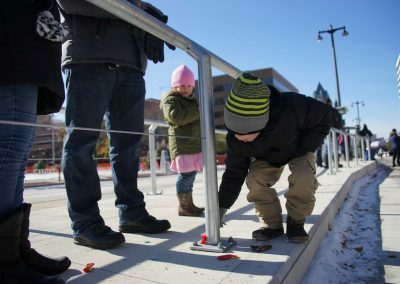 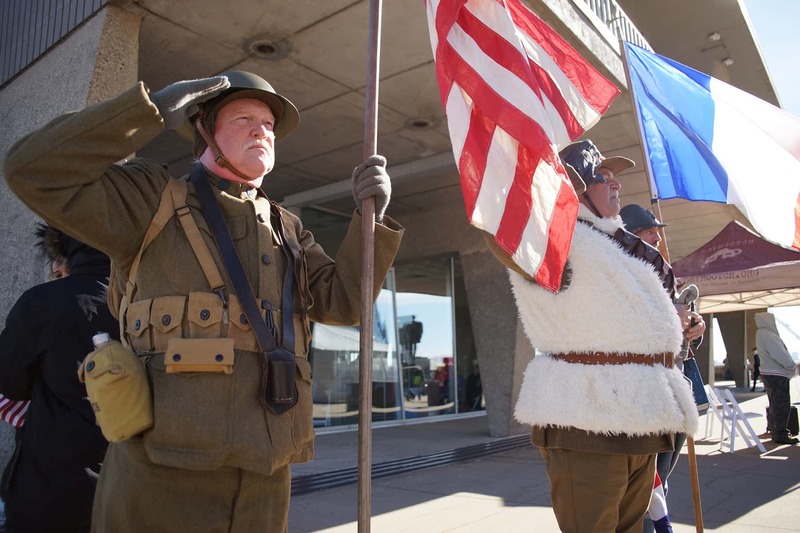 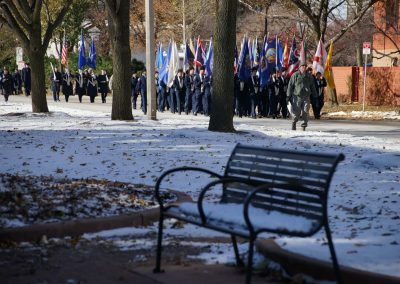 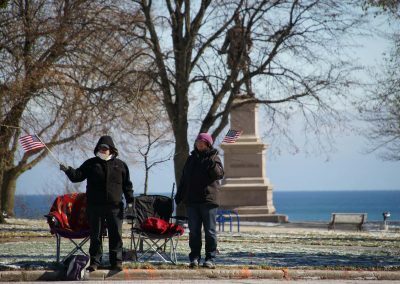 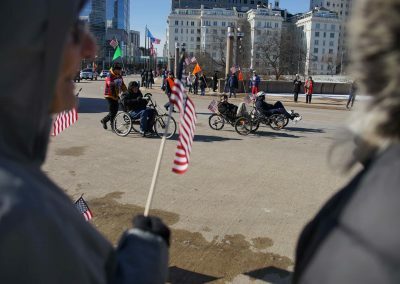 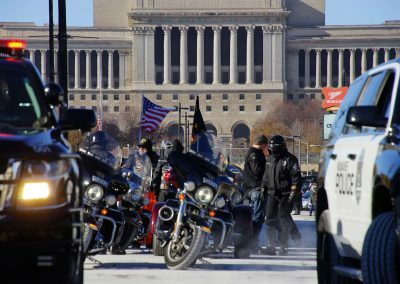 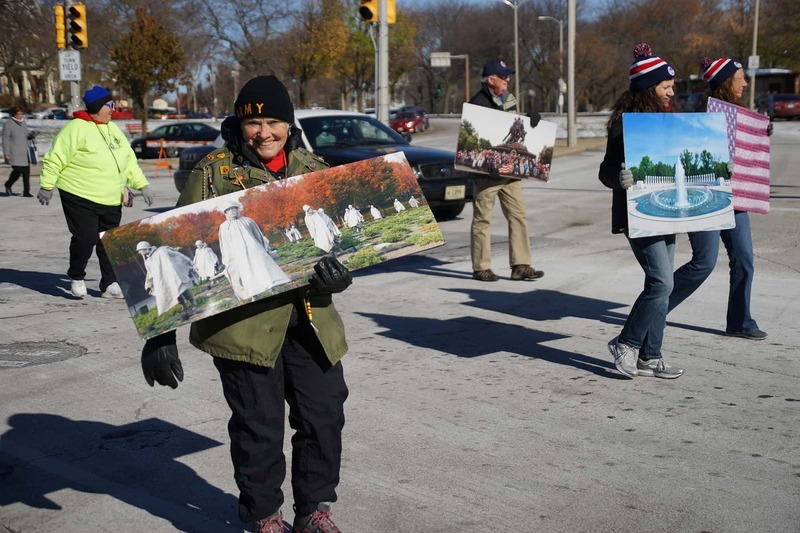 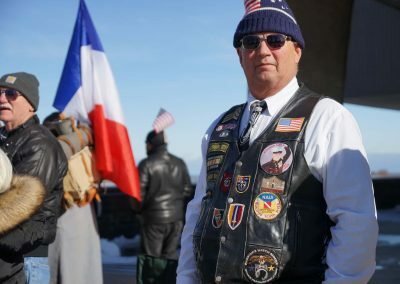 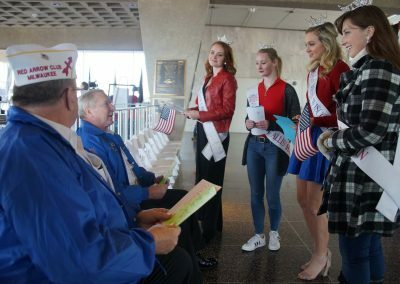 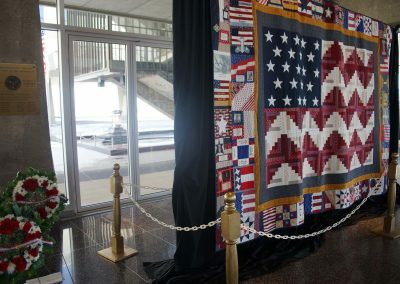 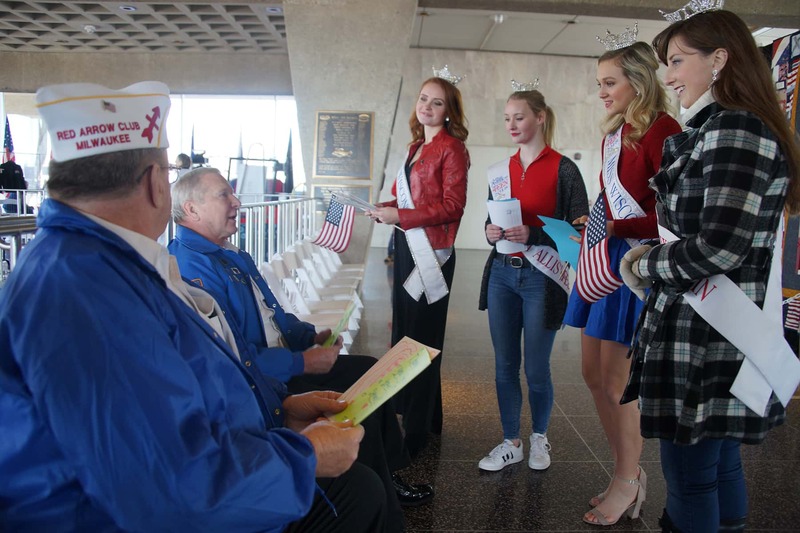 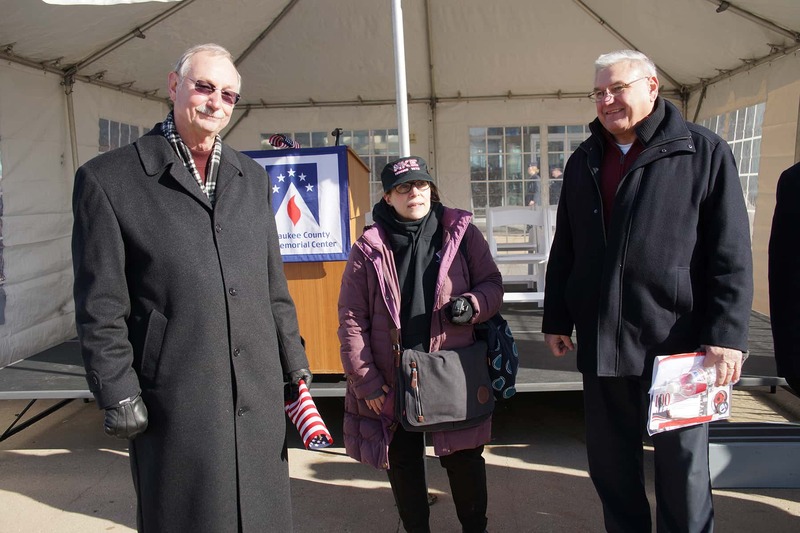 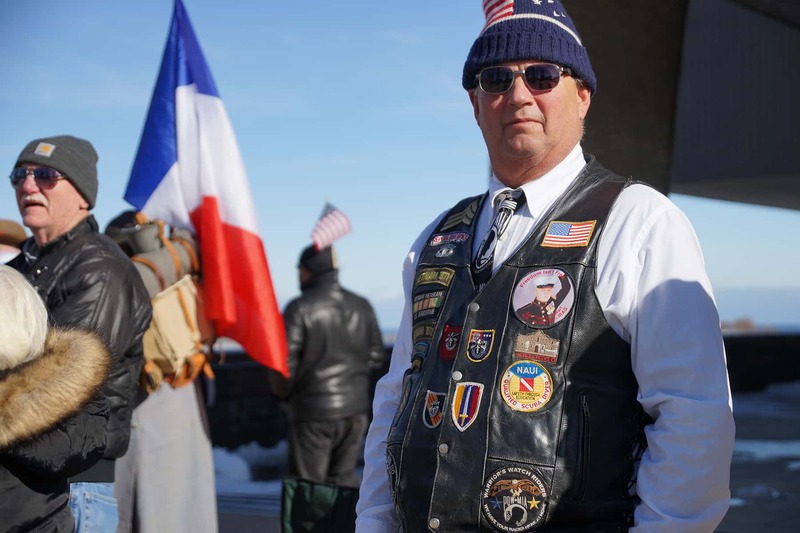 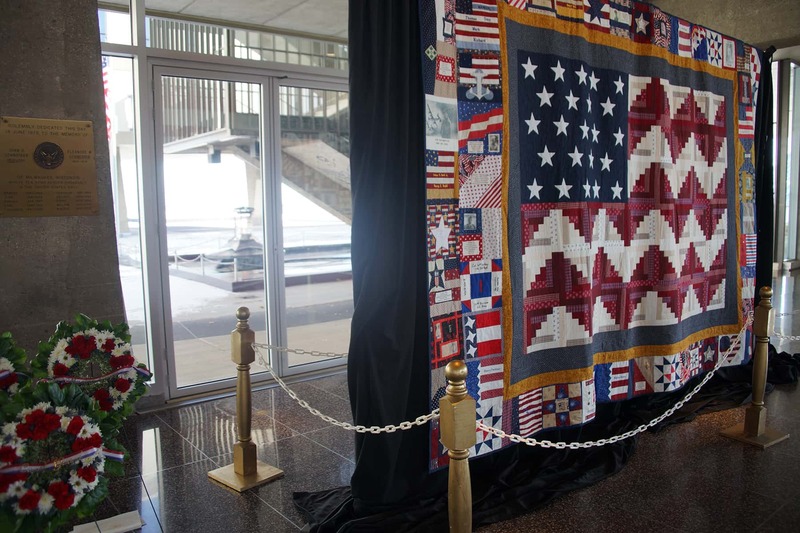 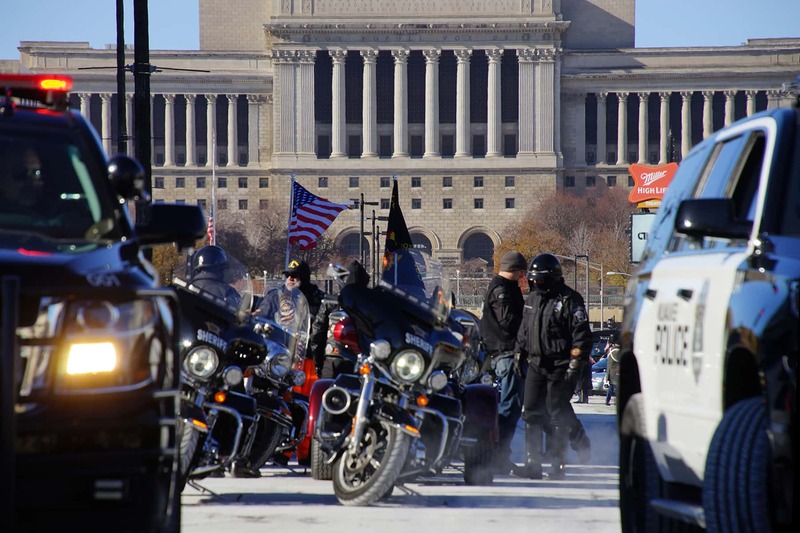 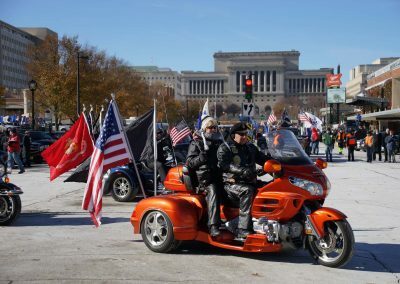 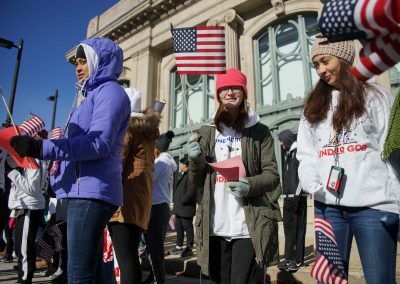 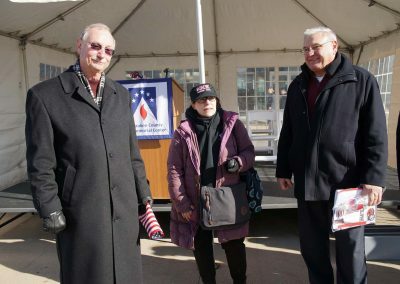 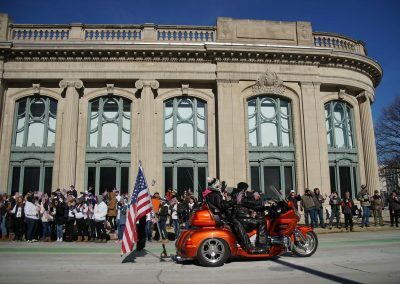 The route ended at the Milwaukee County War Memorial Center on Lincoln Memorial Drive, where people also took part in a Memorial Service at the Reflecting Pool to honor those lost in service to our country. 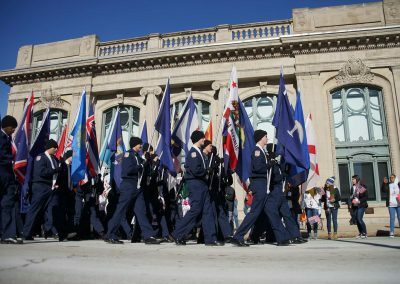 In 2014, the parade lost some significant sponsors and would have been cancelled if not for a generous $20,000 donation from TransCanada. 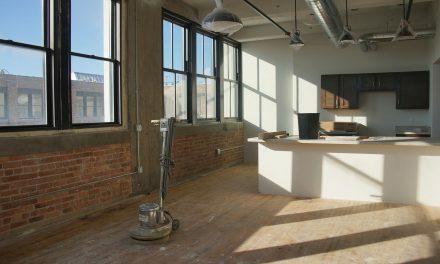 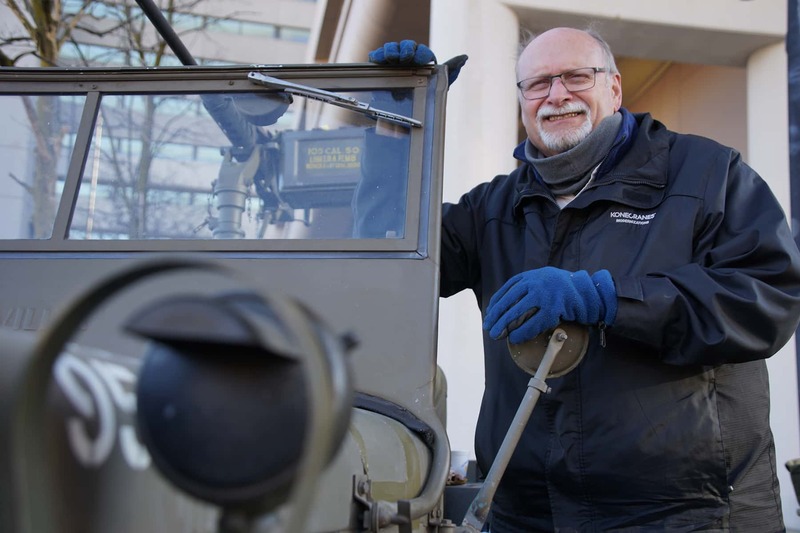 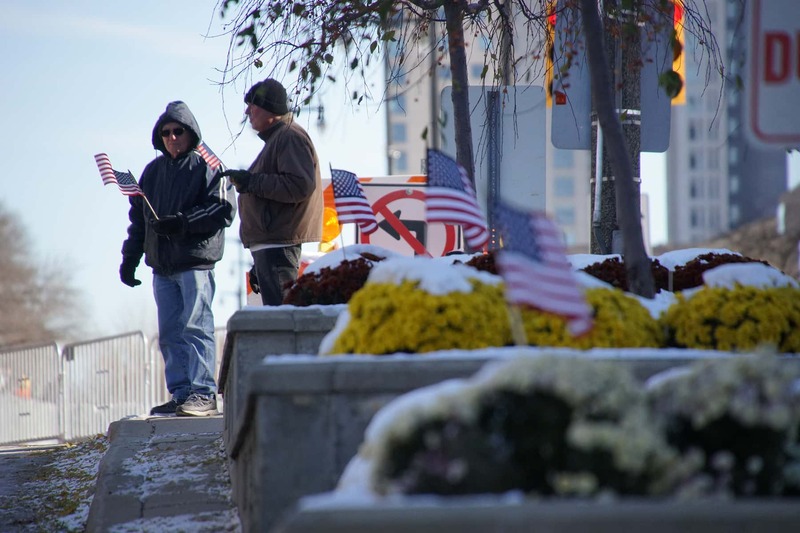 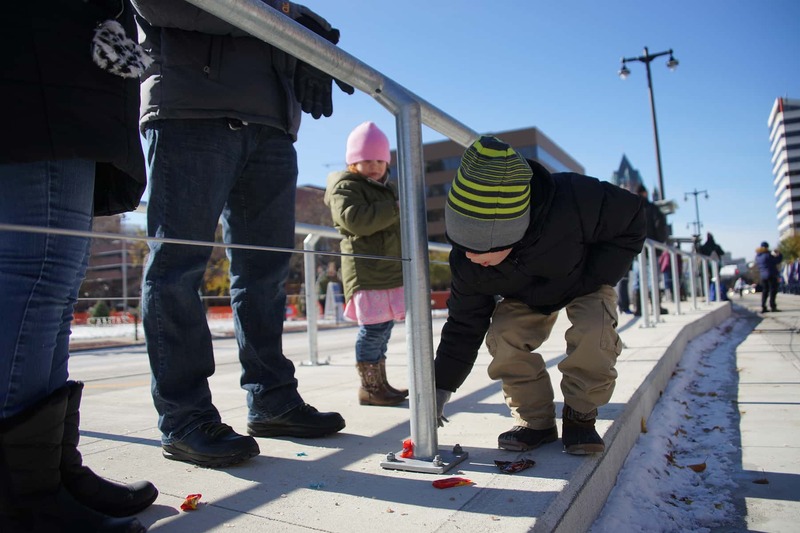 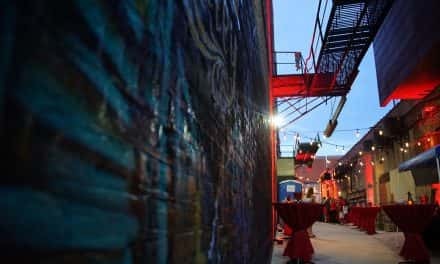 The Canadian company honored Milwaukee veterans when other Milwaukee companies would not. 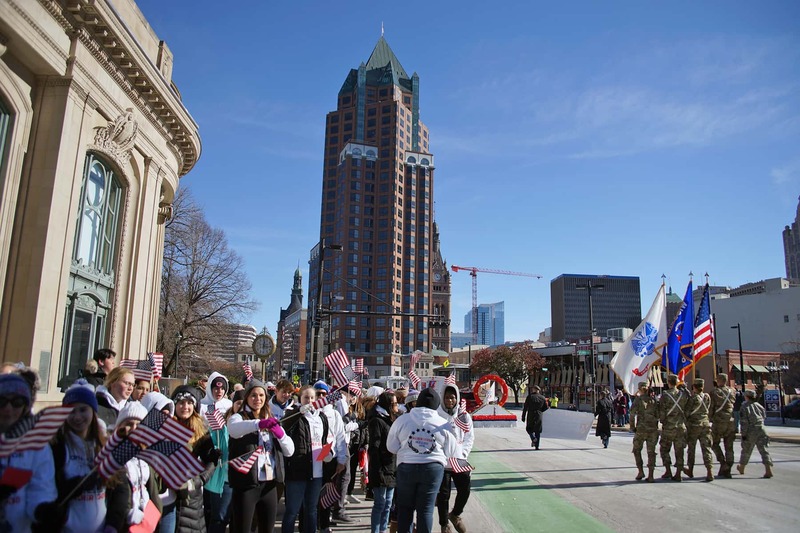 While Milwaukee corporations continue to line-up for press conferences to show off their support for the city, with over-sized donation checks featuring their logo, it is the Canadian company that continues to fund the parade where these economic institutions do not. 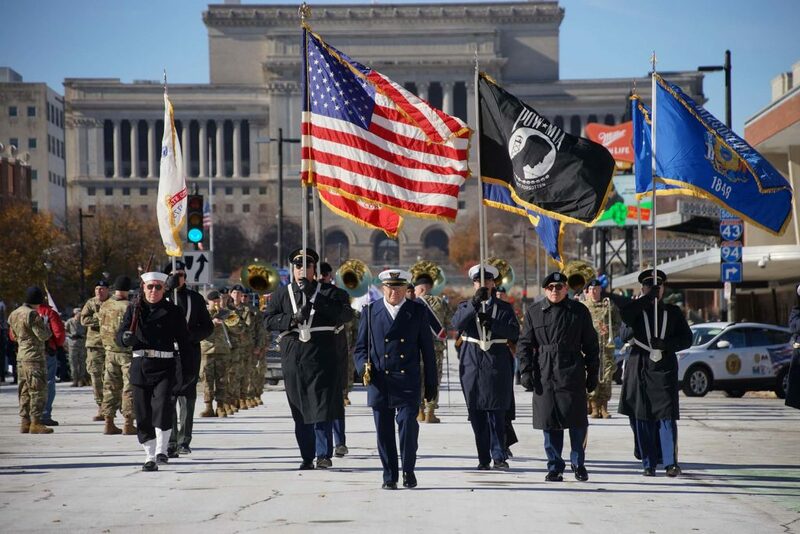 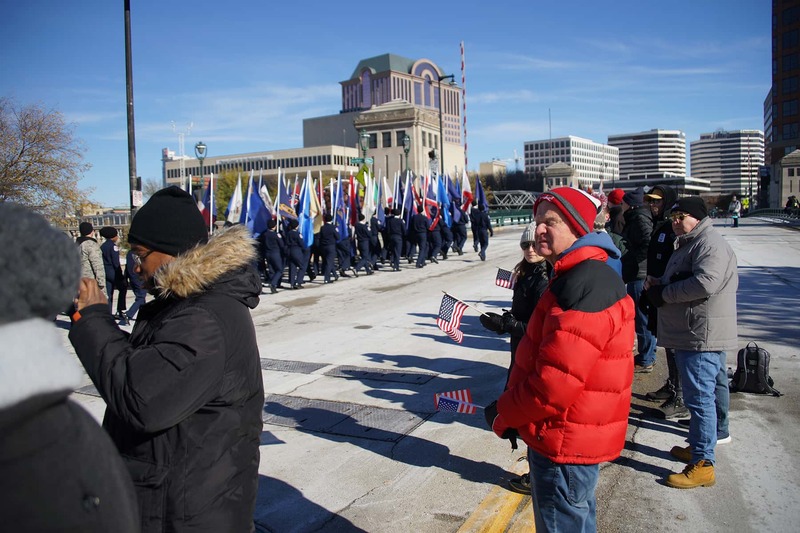 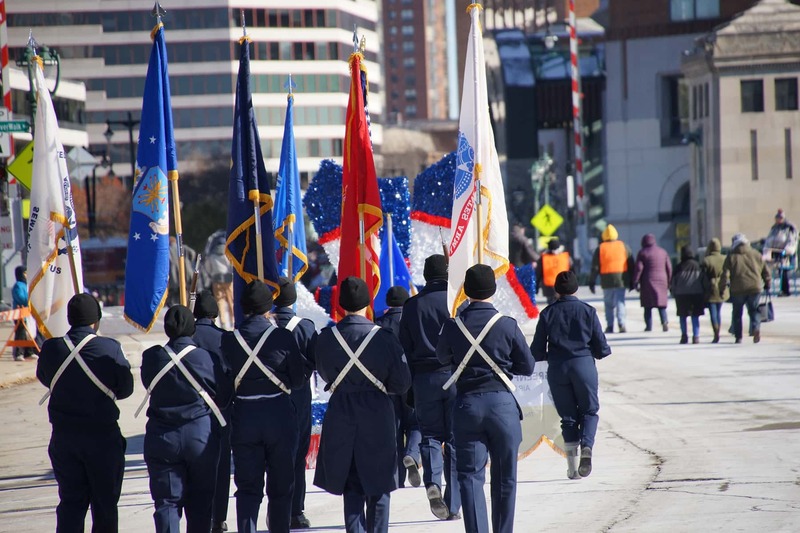 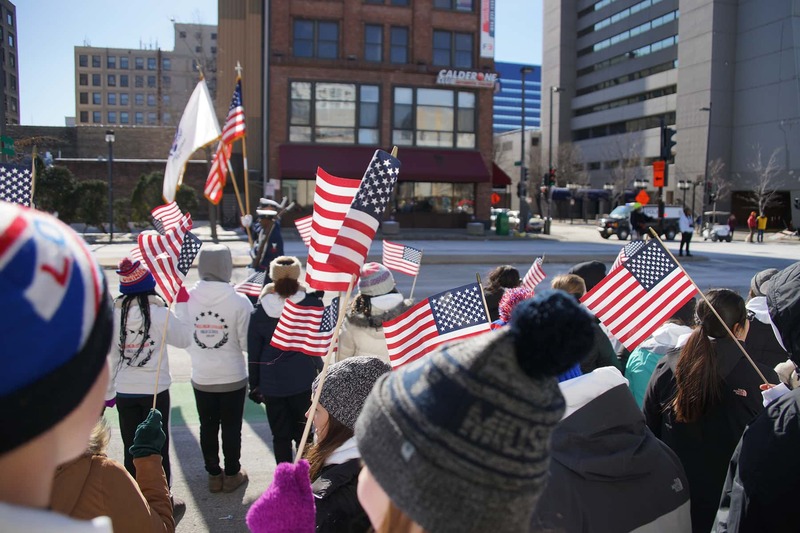 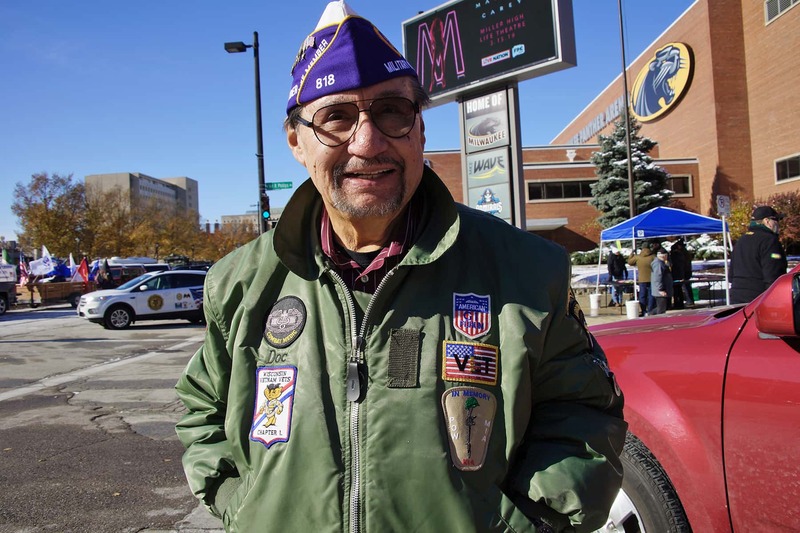 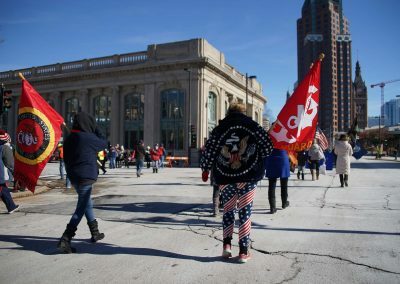 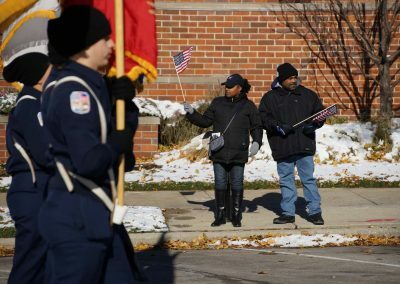 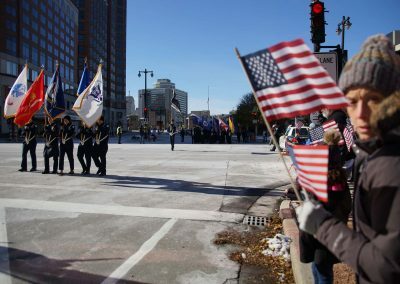 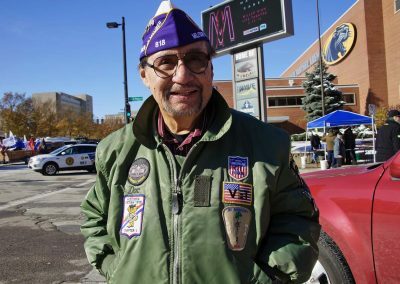 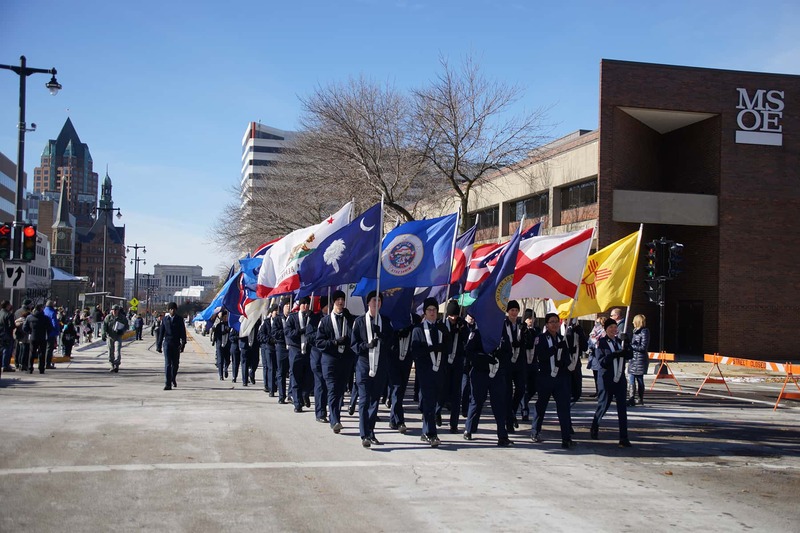 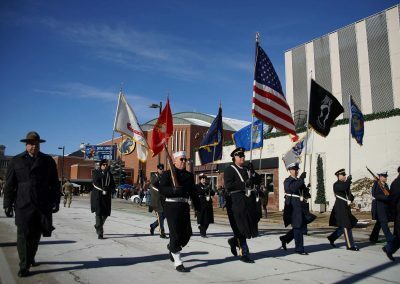 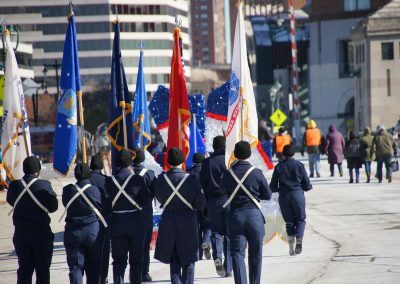 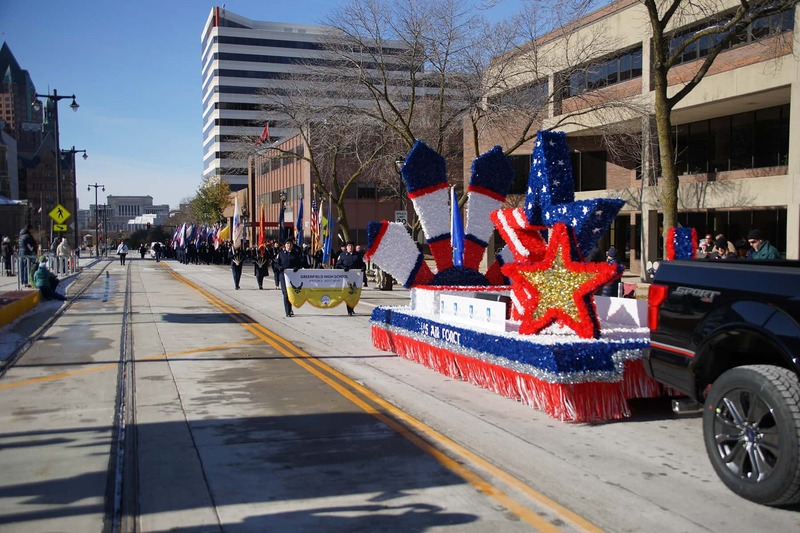 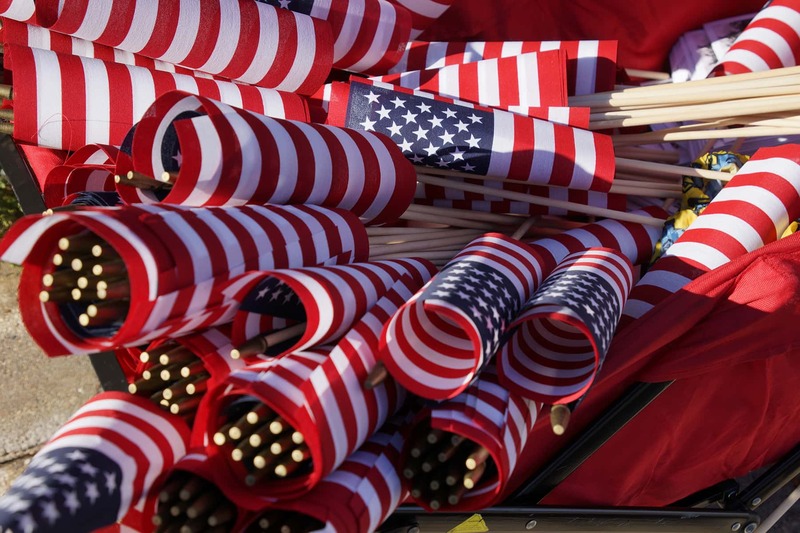 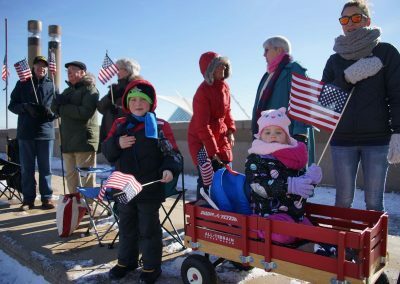 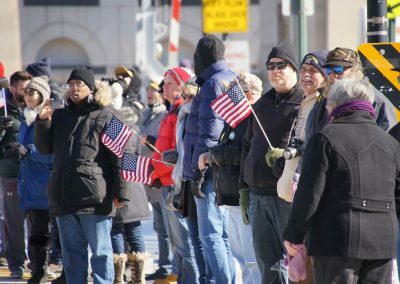 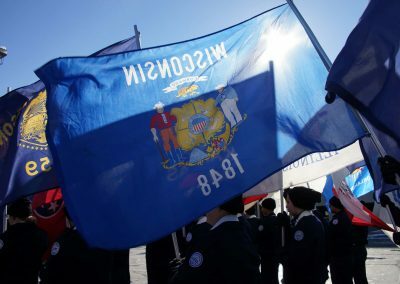 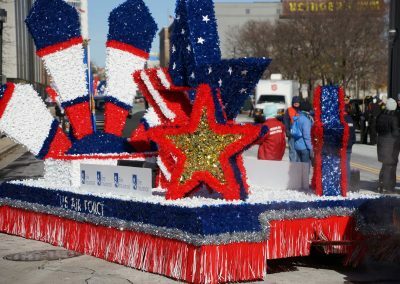 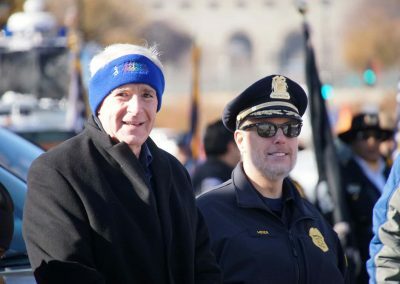 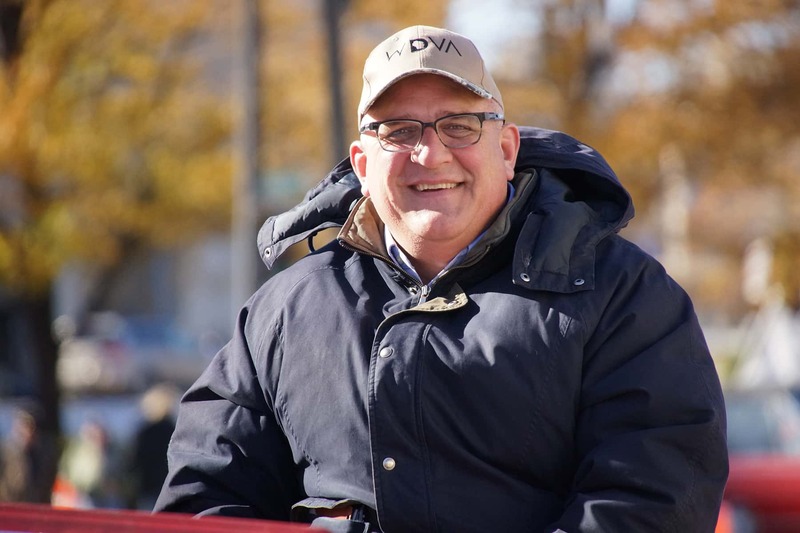 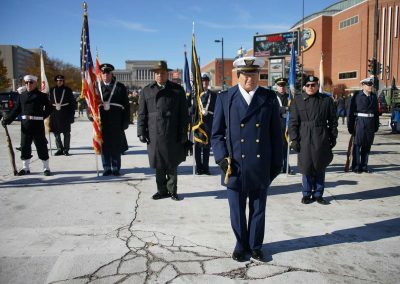 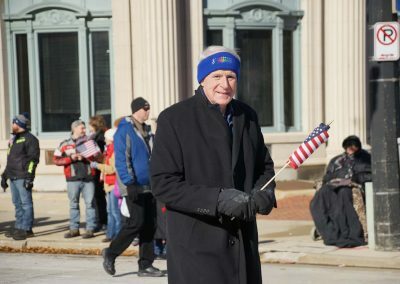 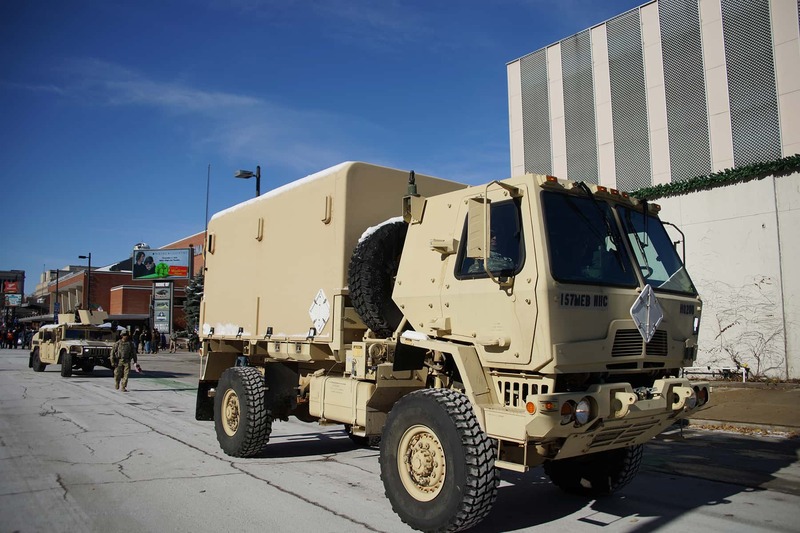 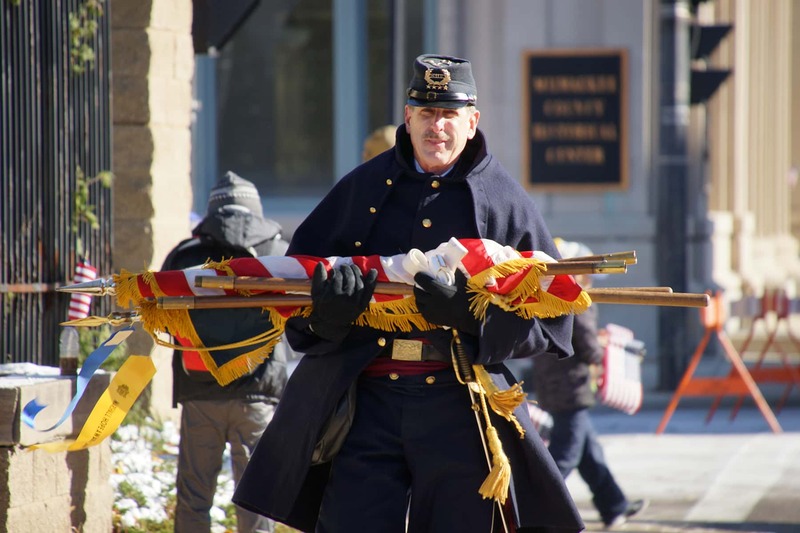 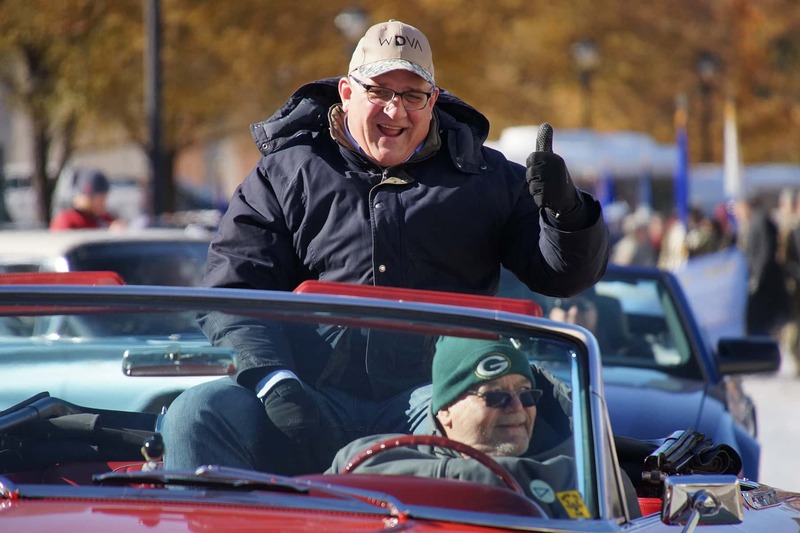 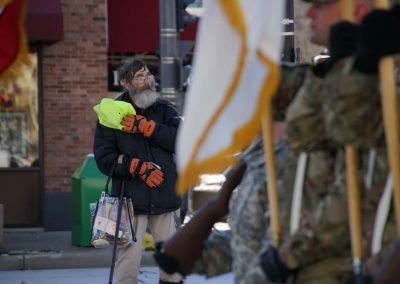 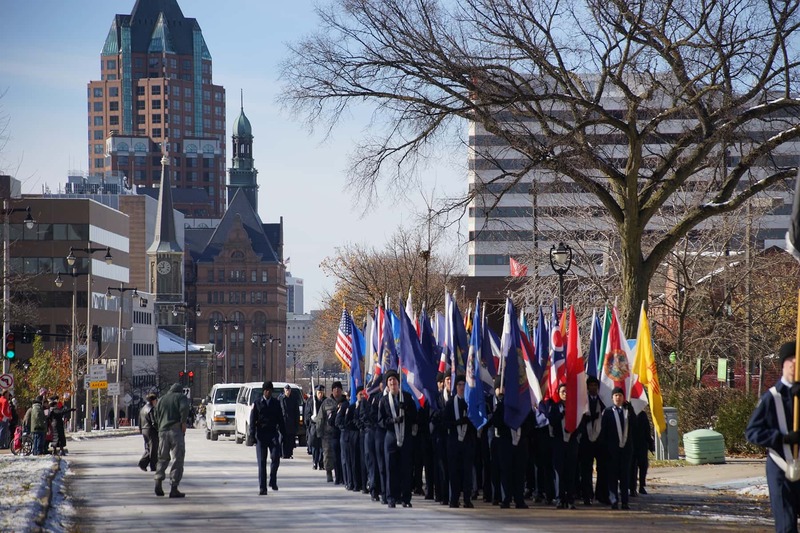 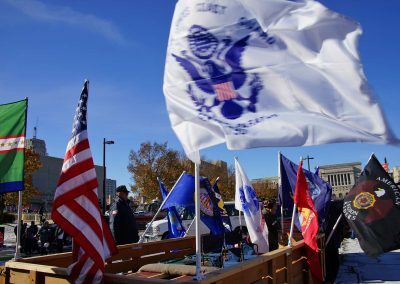 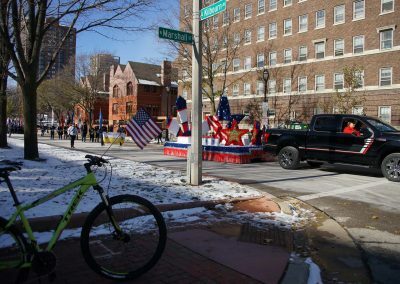 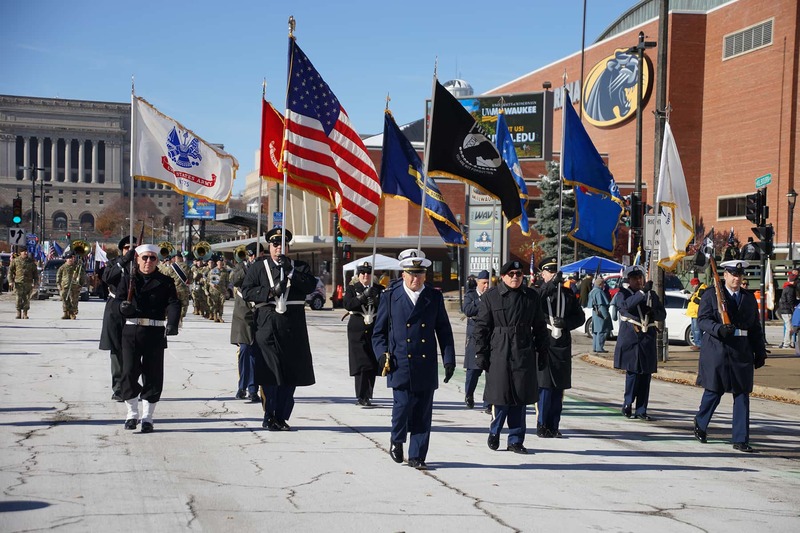 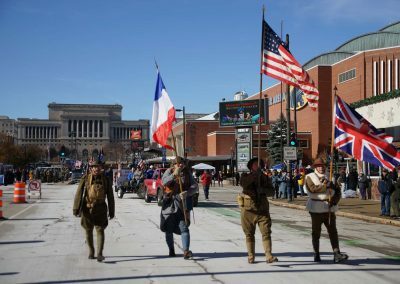 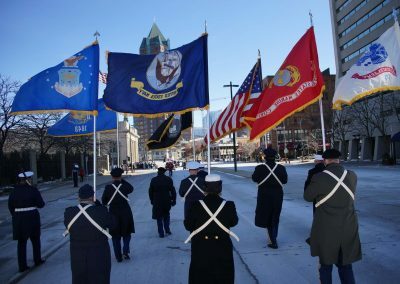 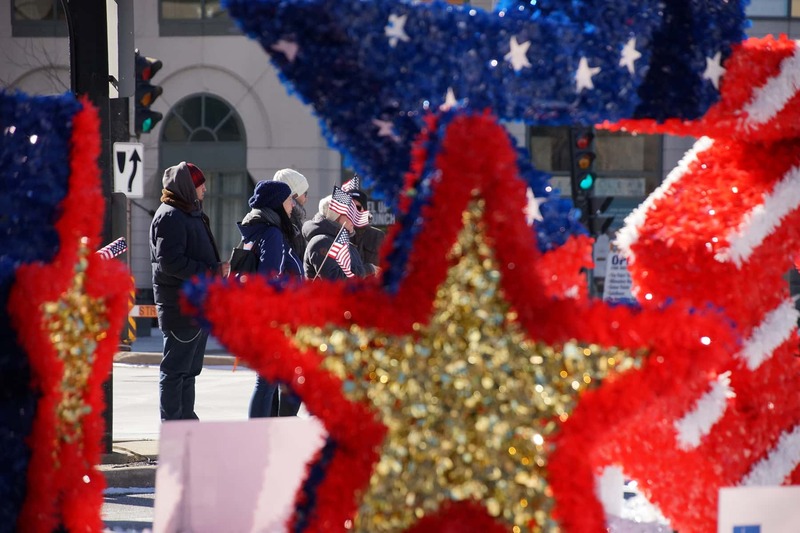 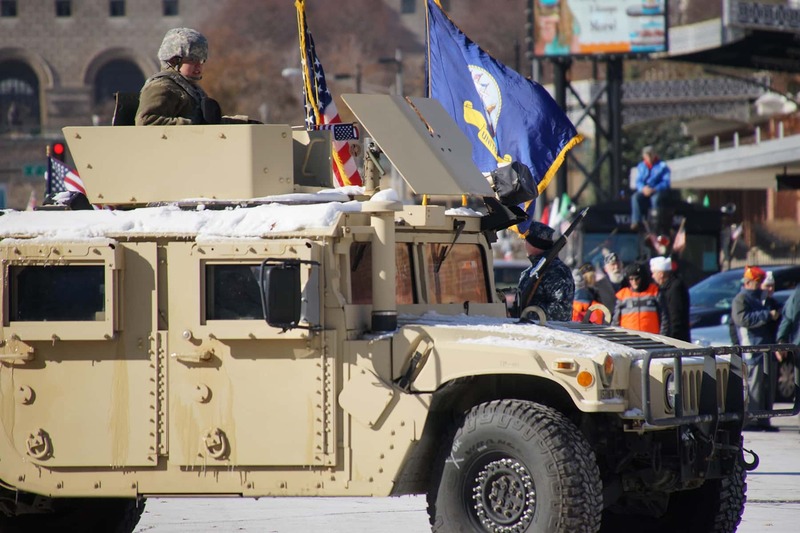 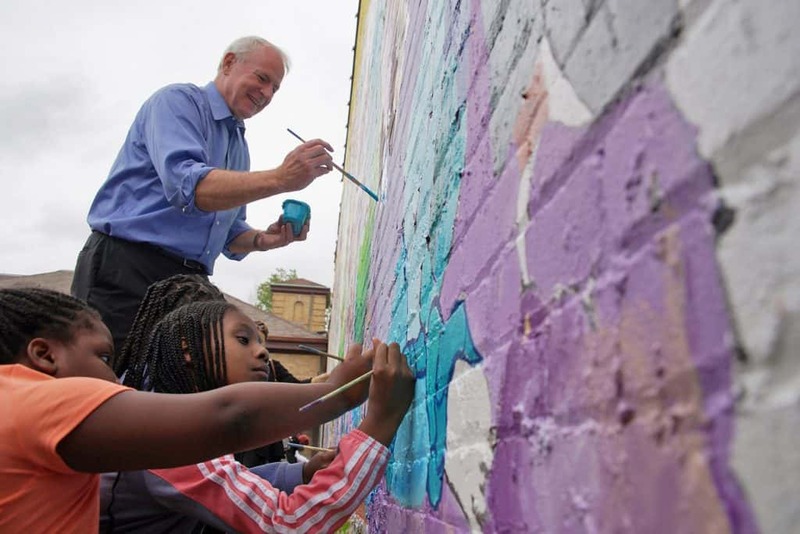 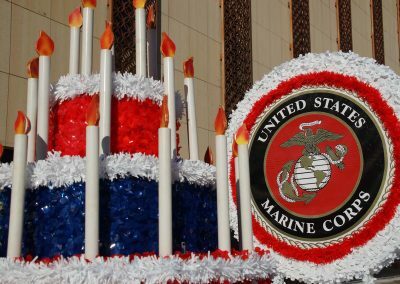 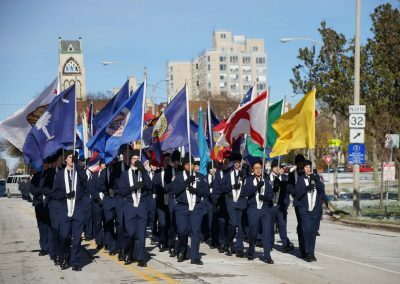 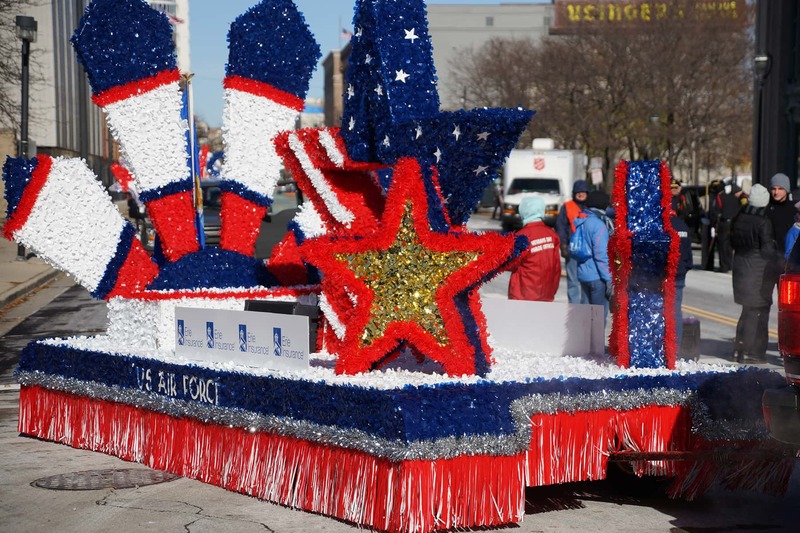 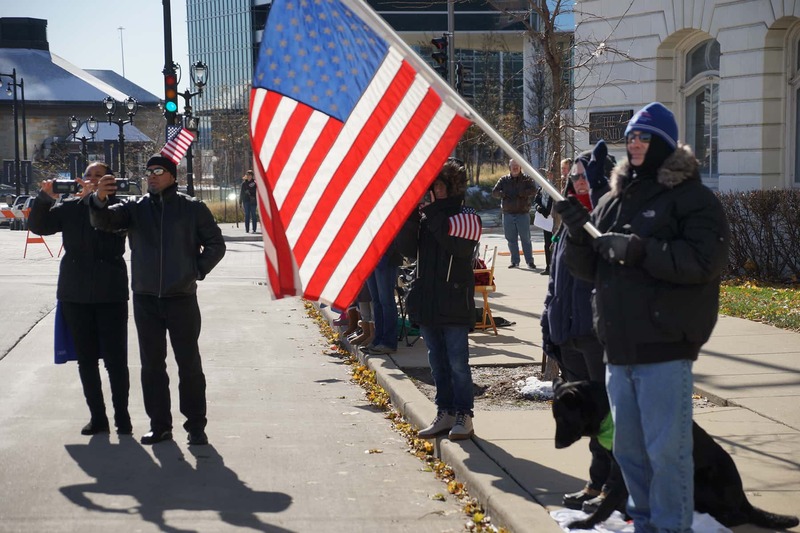 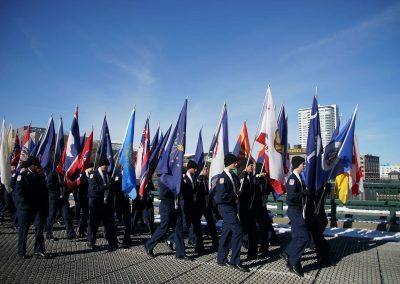 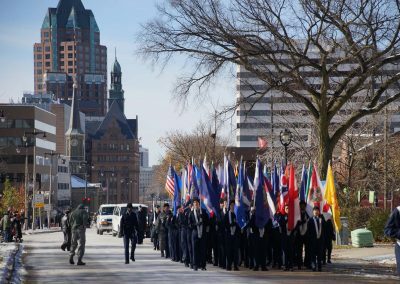 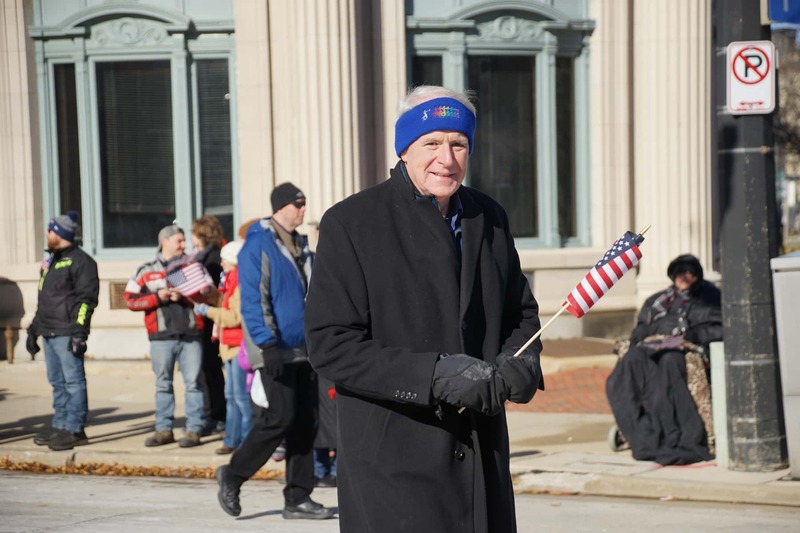 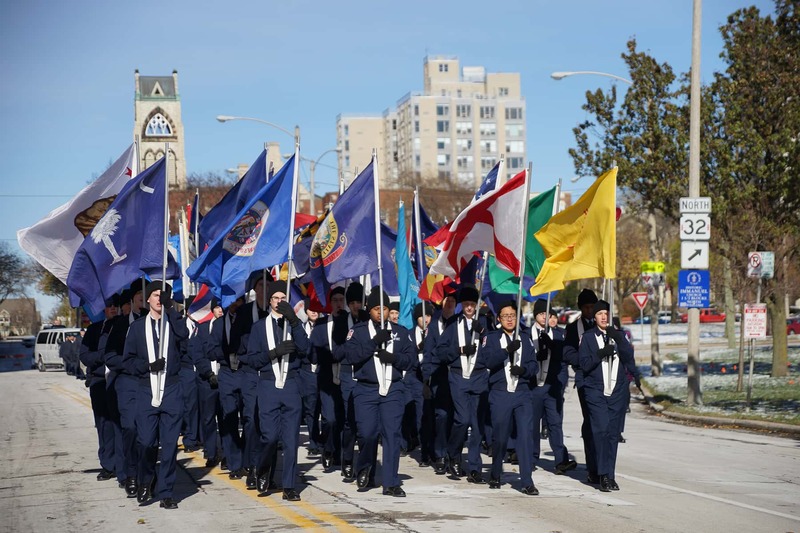 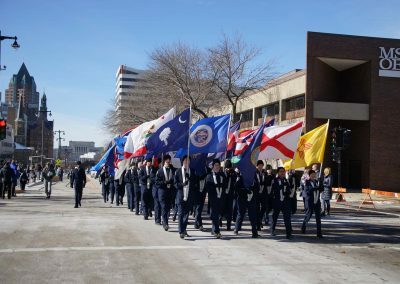 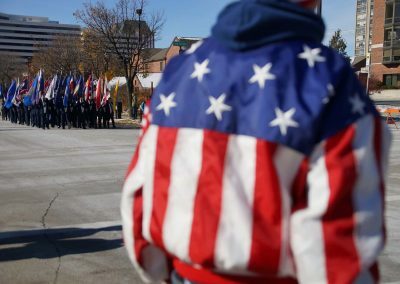 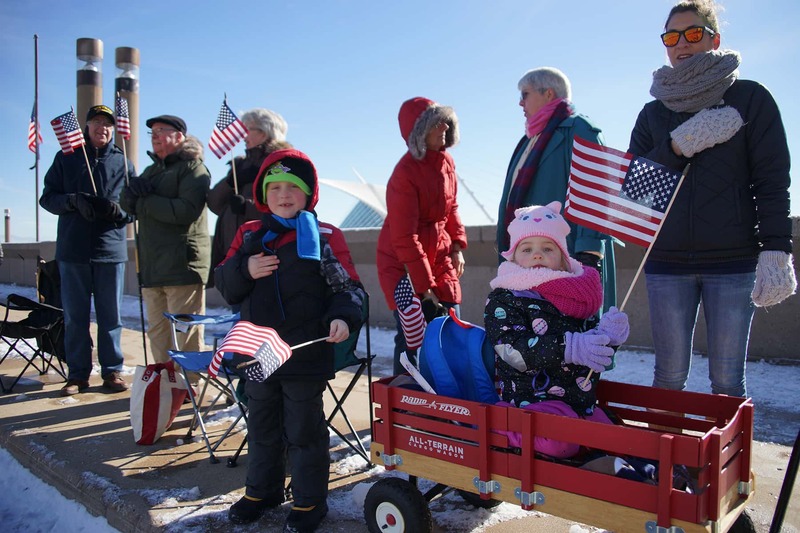 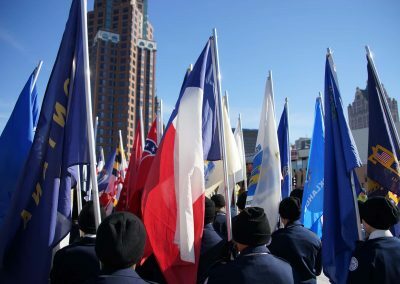 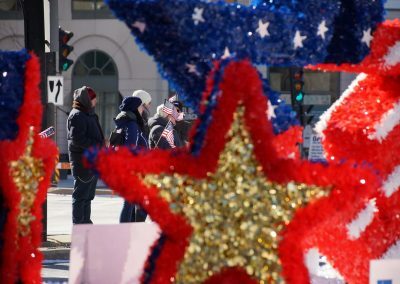 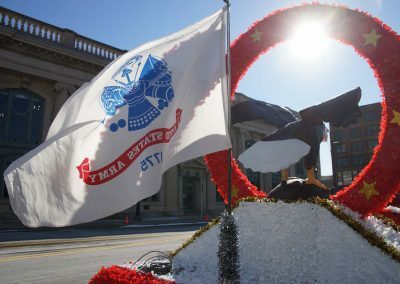 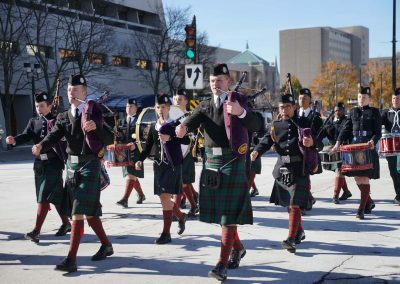 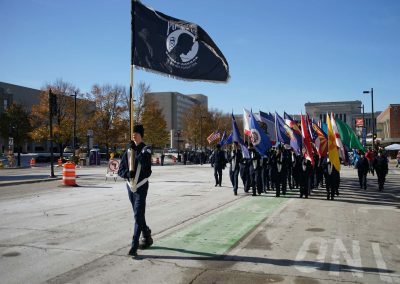 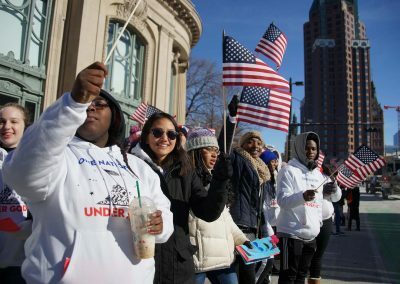 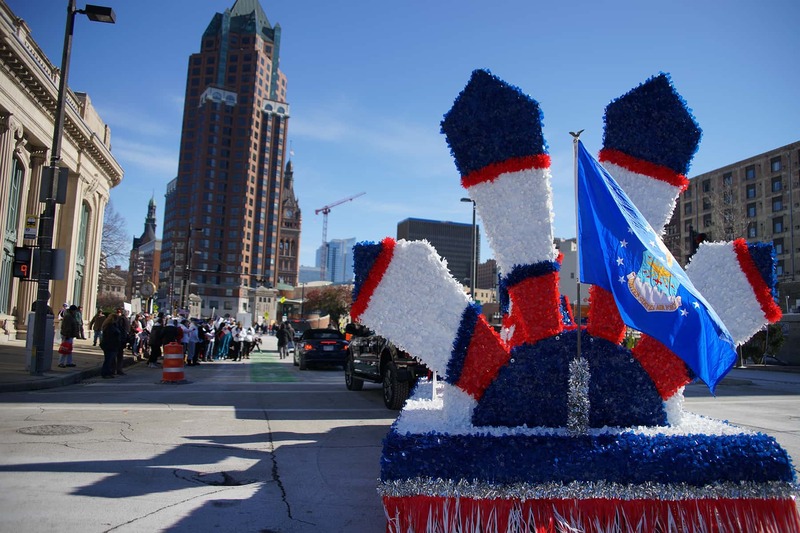 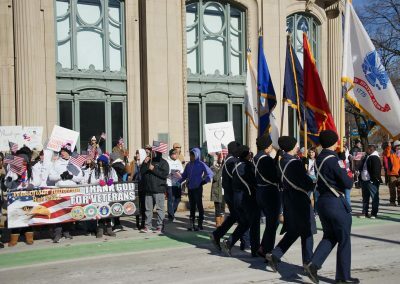 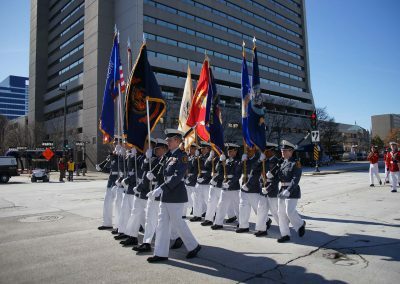 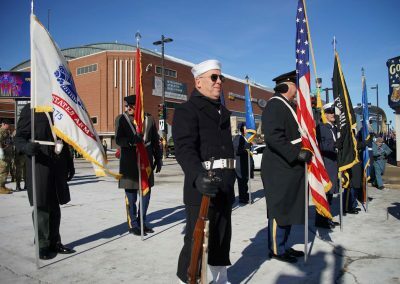 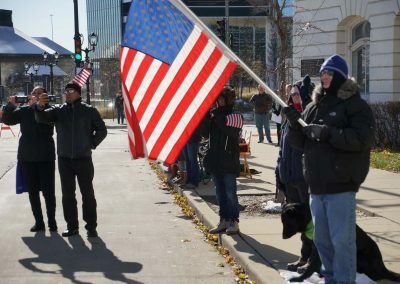 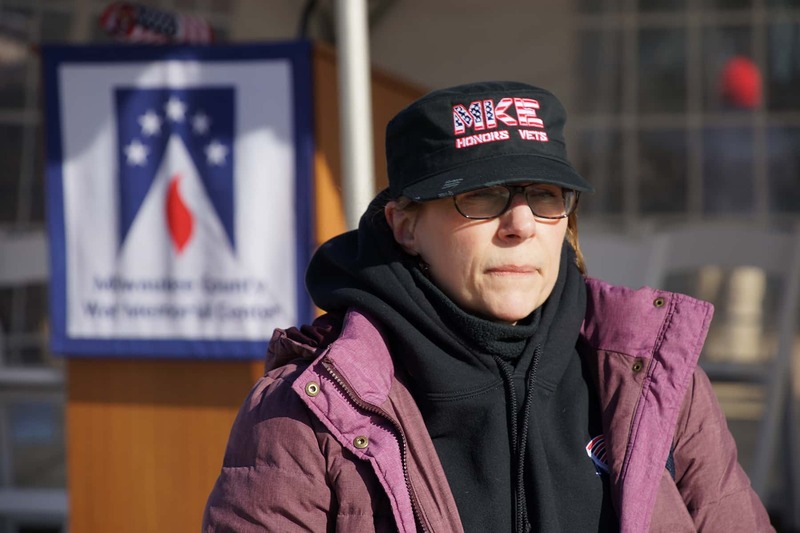 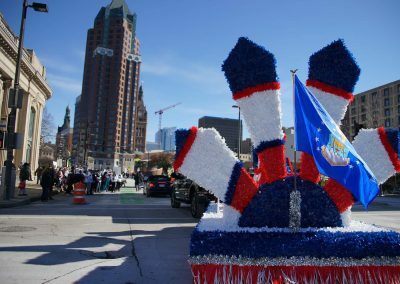 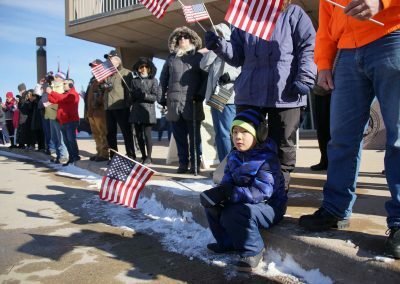 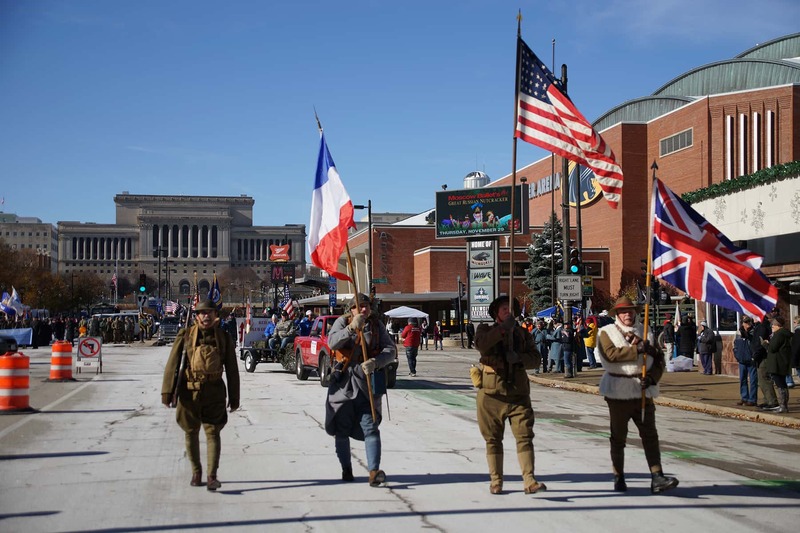 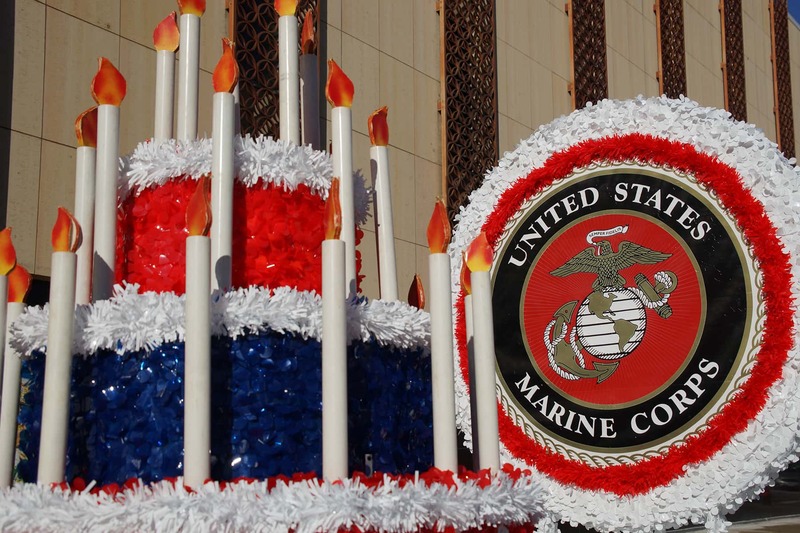 According to parade organizers, Milwaukee enterprises have not contributed to the annual parade, which honors hometown veterans, because they do not get enough media exposure to make a financial contribution worthwhile. 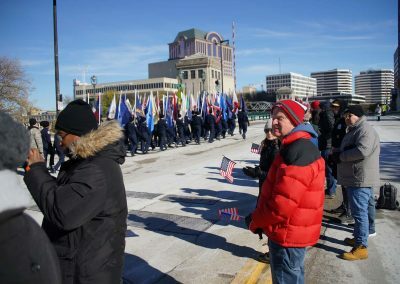 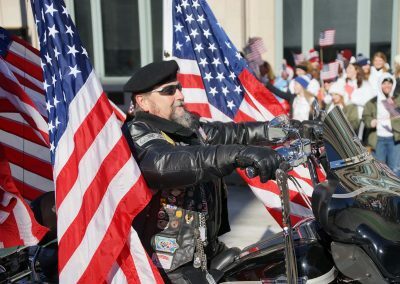 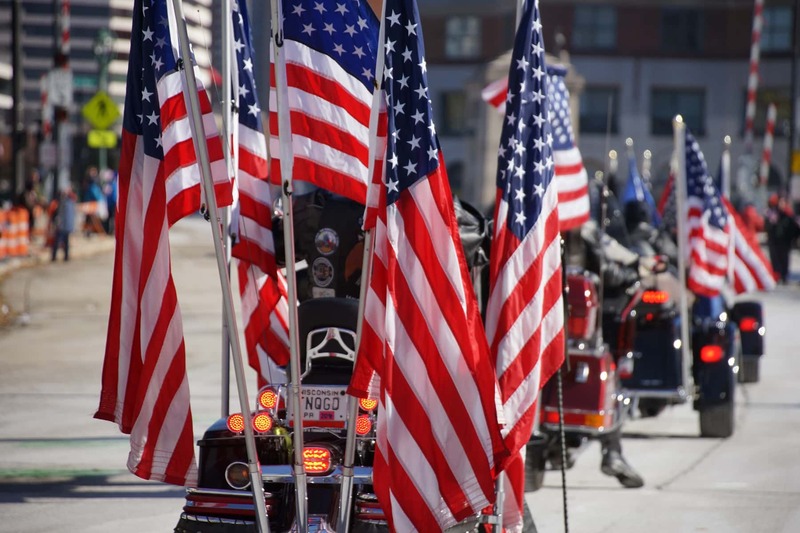 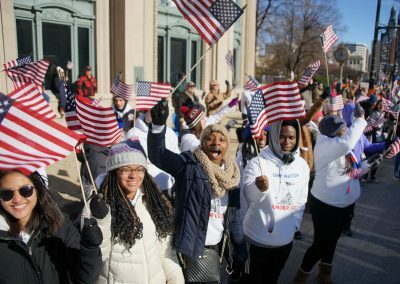 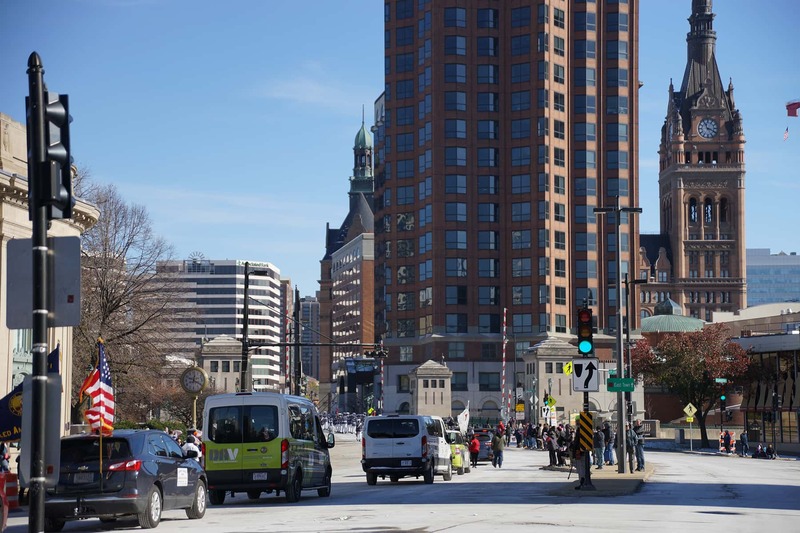 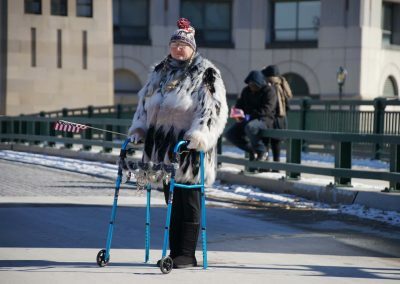 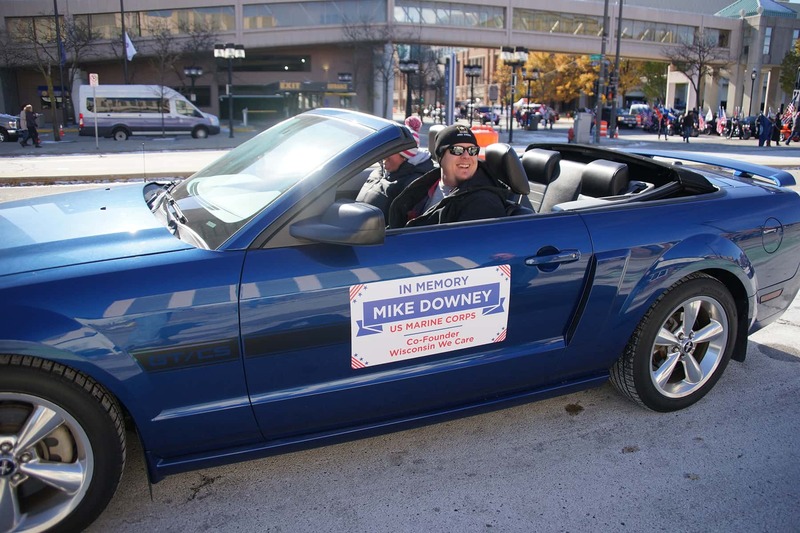 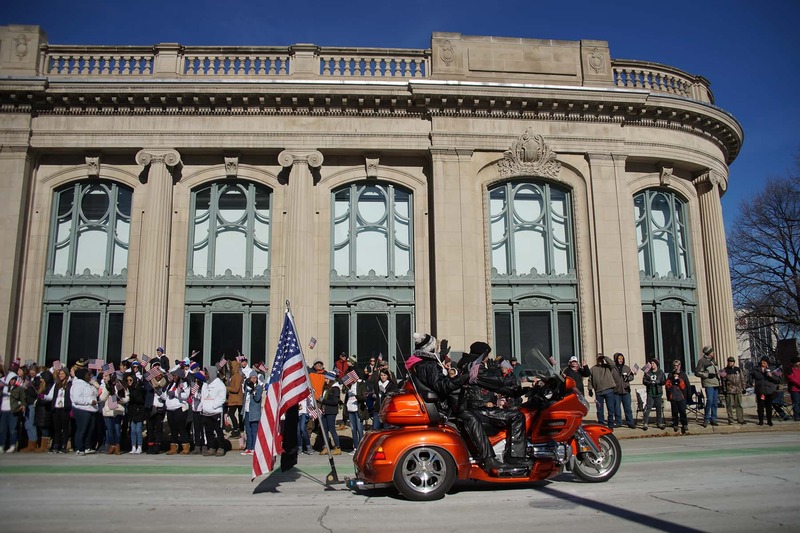 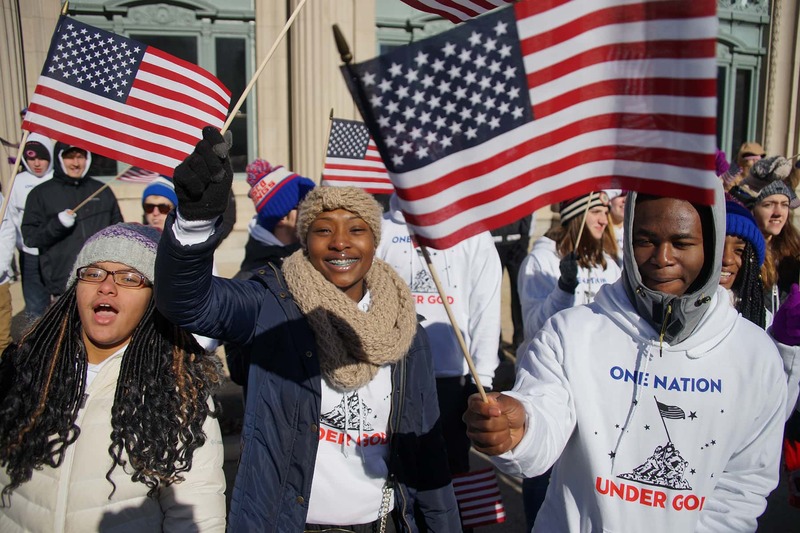 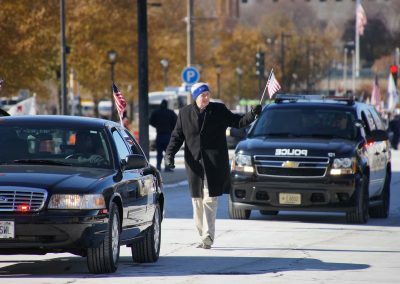 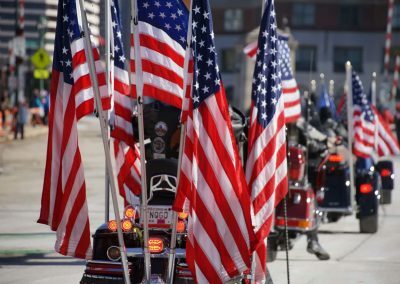 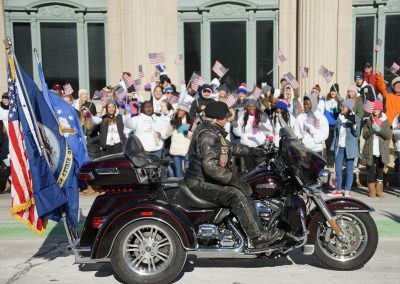 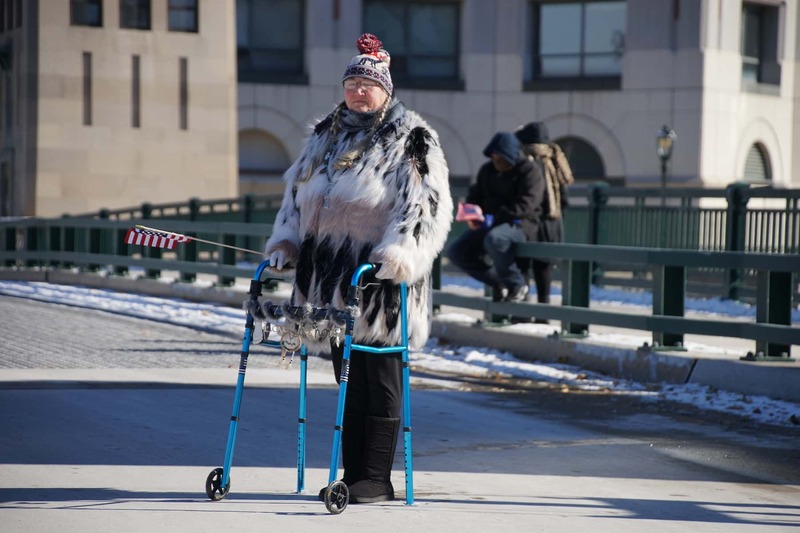 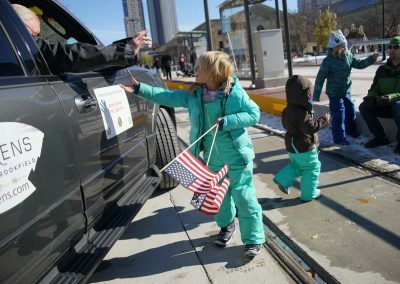 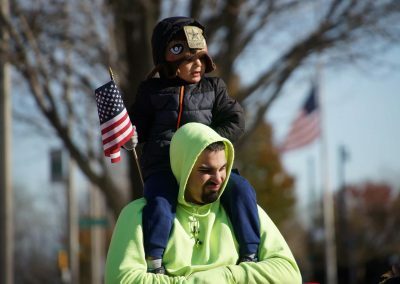 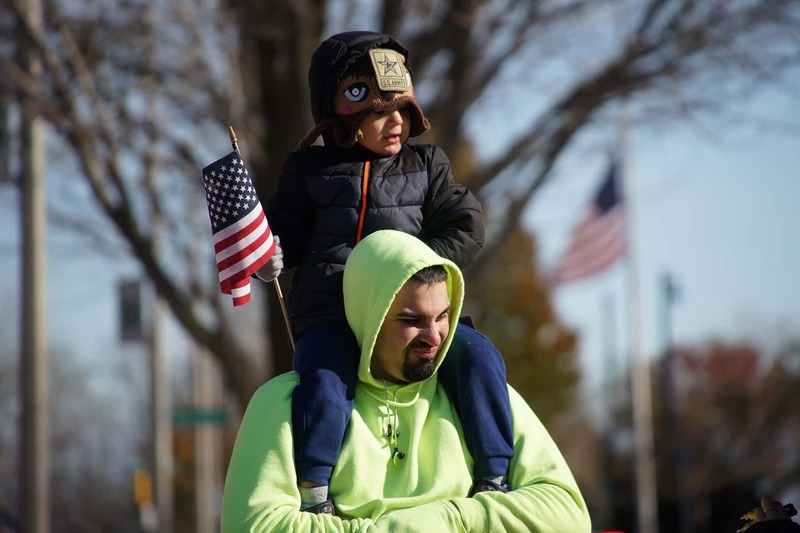 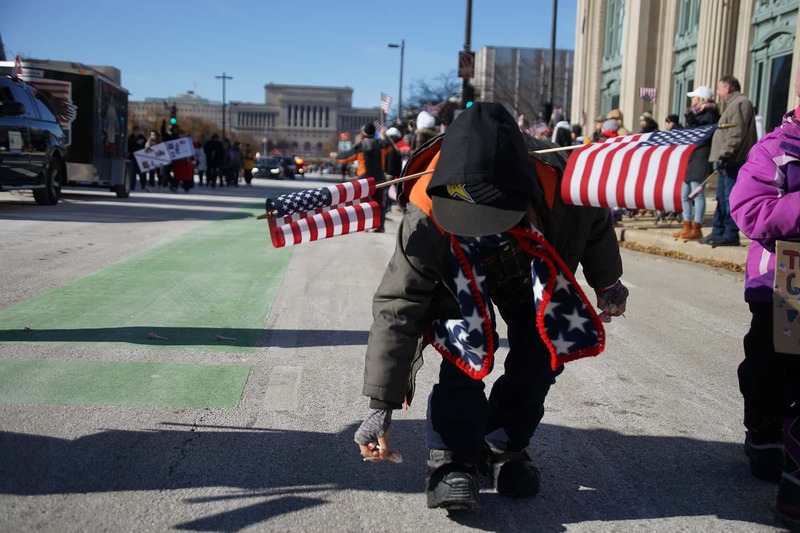 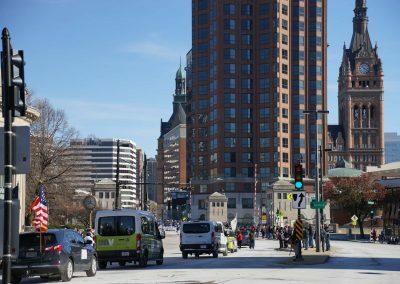 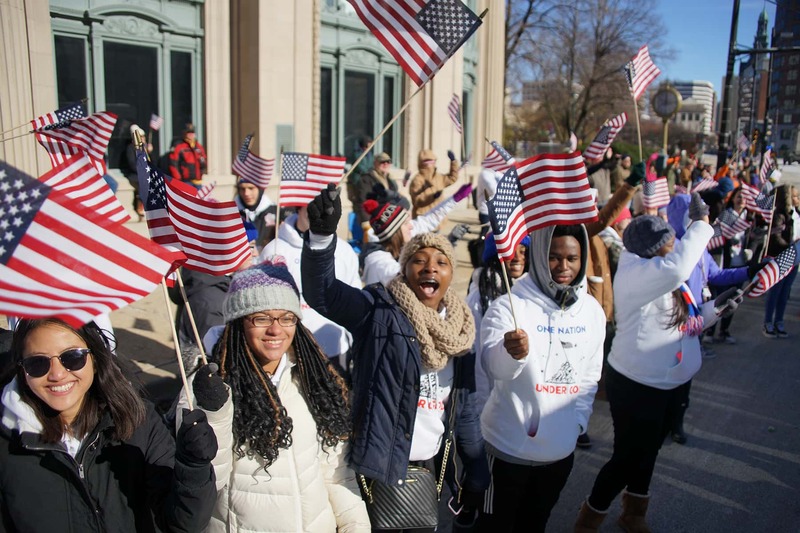 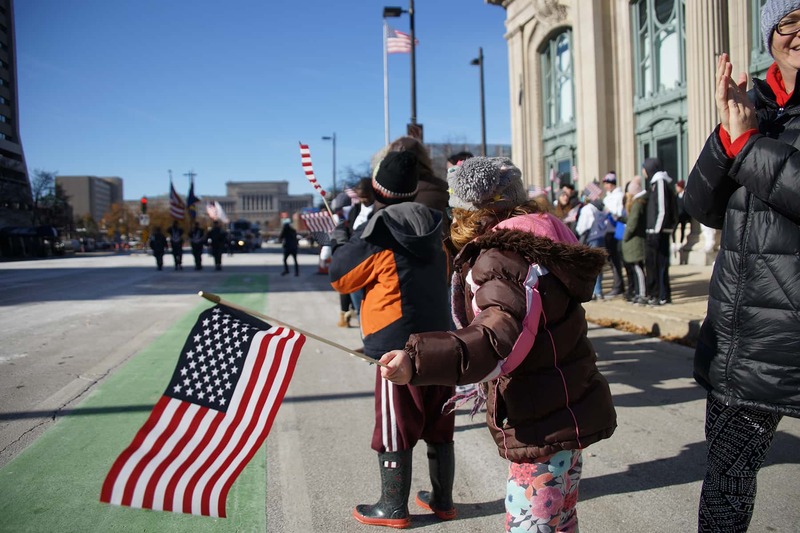 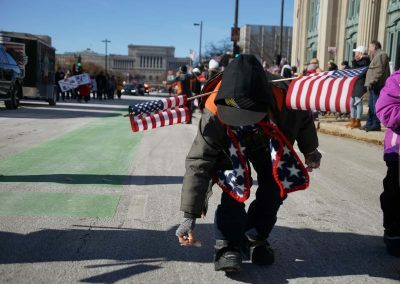 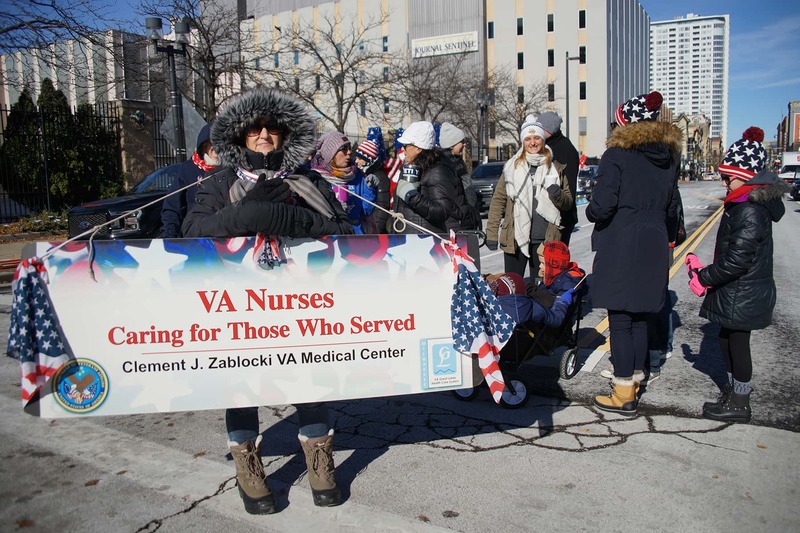 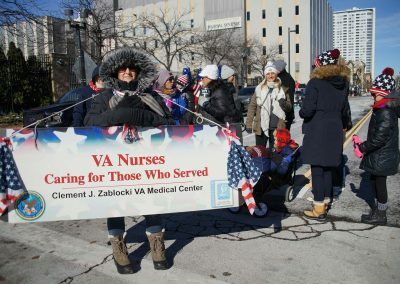 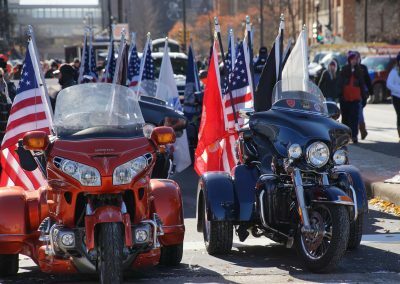 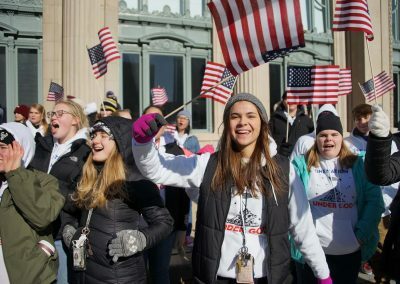 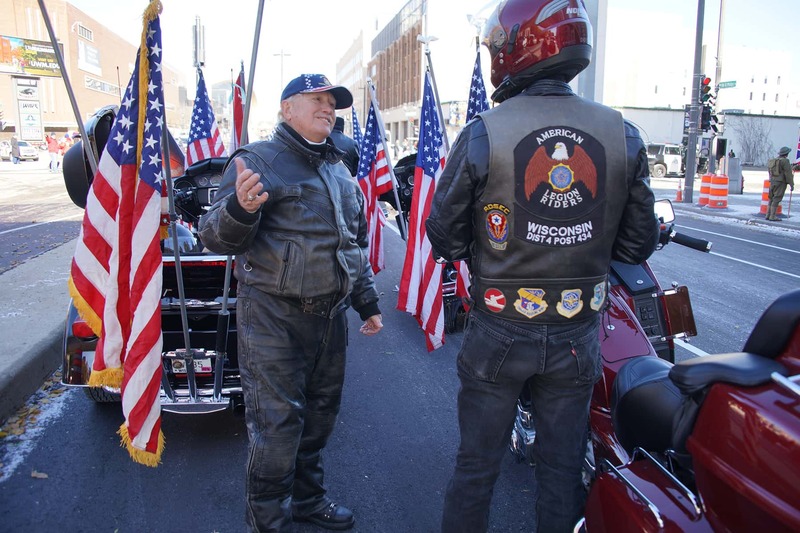 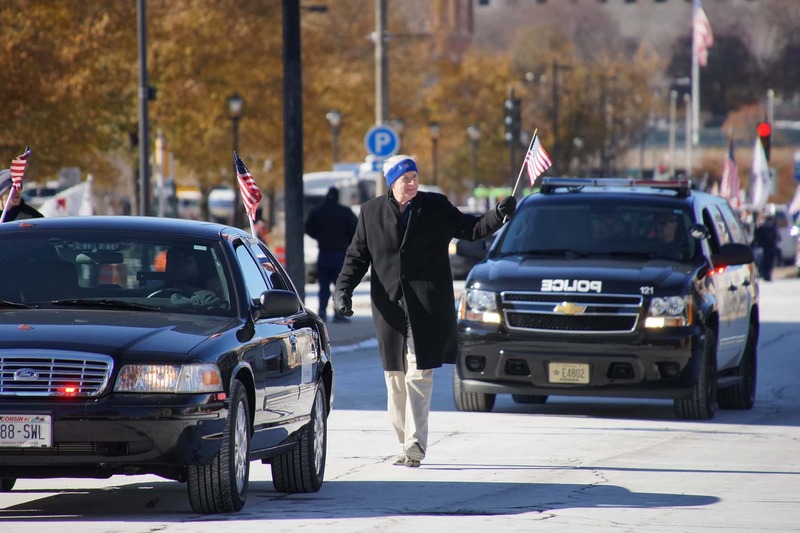 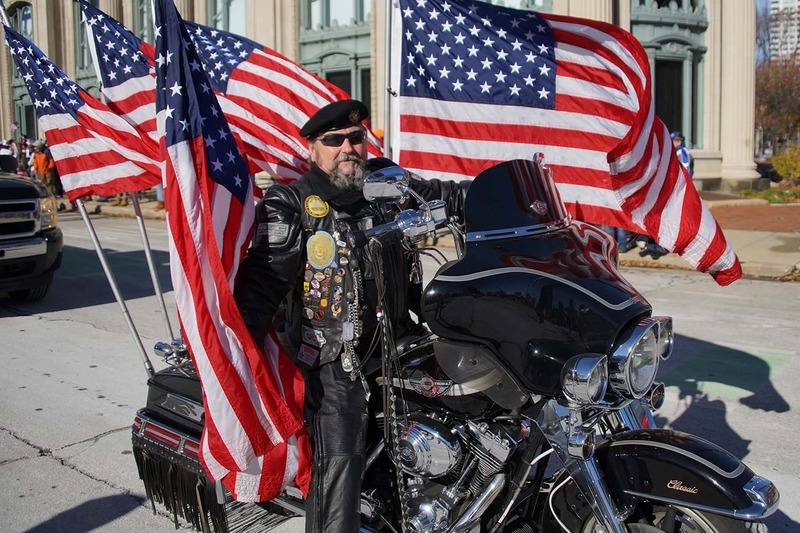 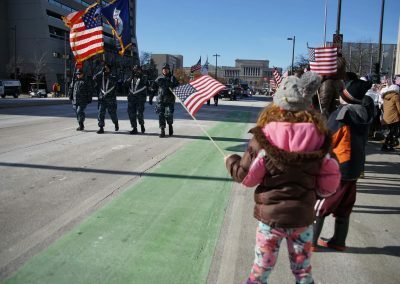 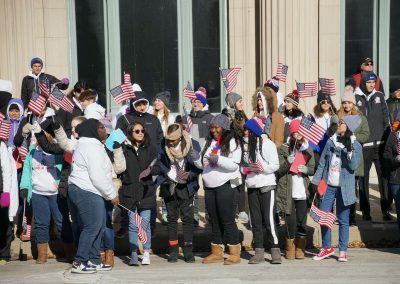 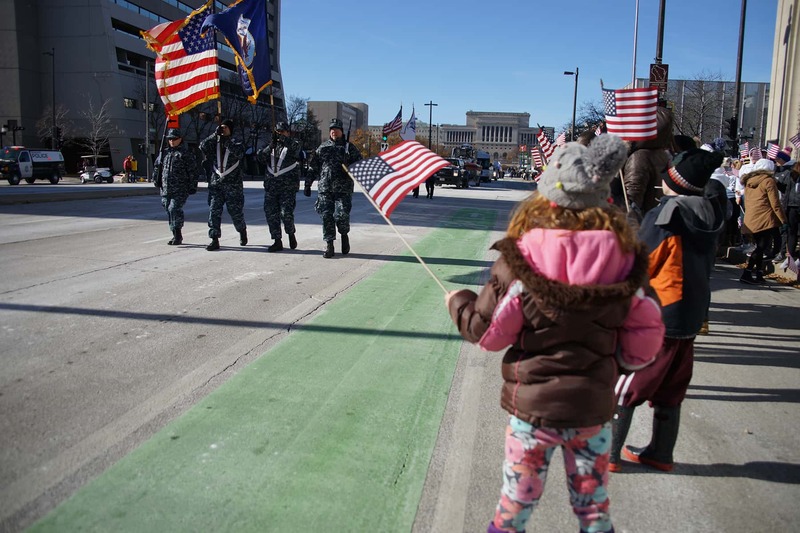 These images were taken along the length of the parade route and highlight the public appreciation that was on display for Milwaukee’s hometown heroes. 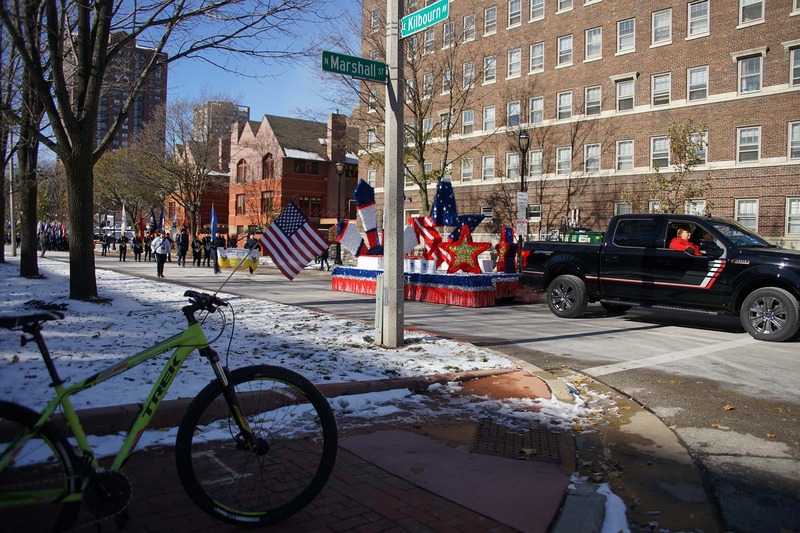 No local media reported this year about public attendance at the parade, only the participants. 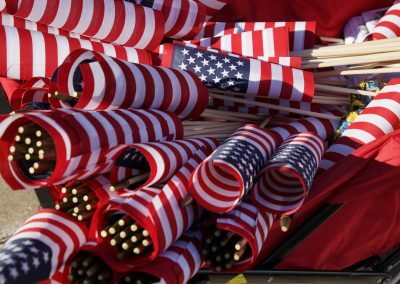 In 2017, there was an ongoing protest by NFL players during the National Anthem, which generated a great deal of online controversy. 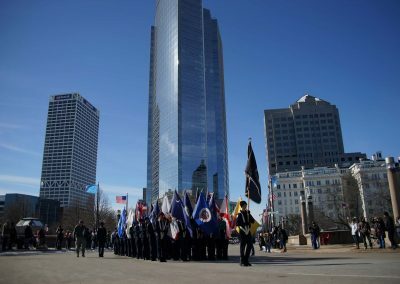 Many in Milwaukee felt that the actions by athletes were a dishonor to veterans. 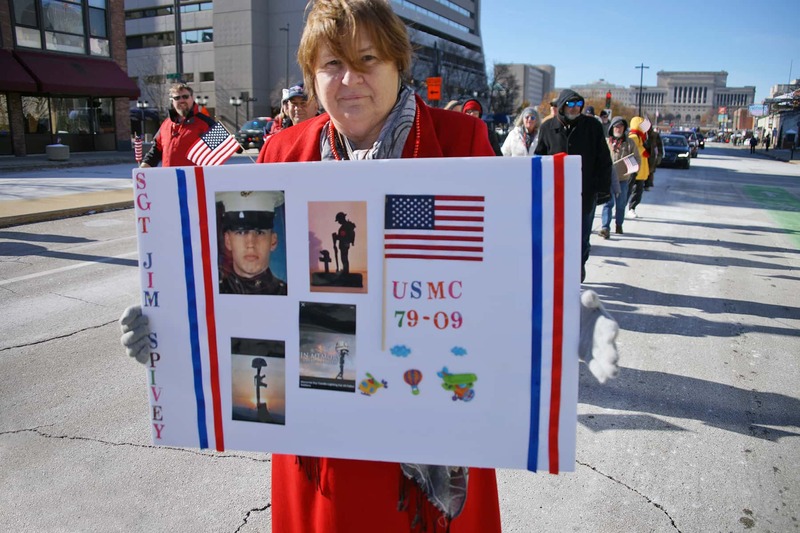 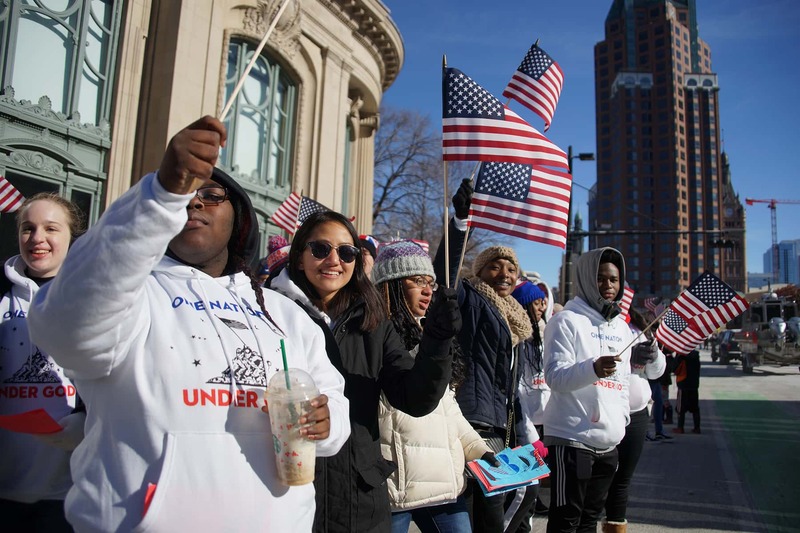 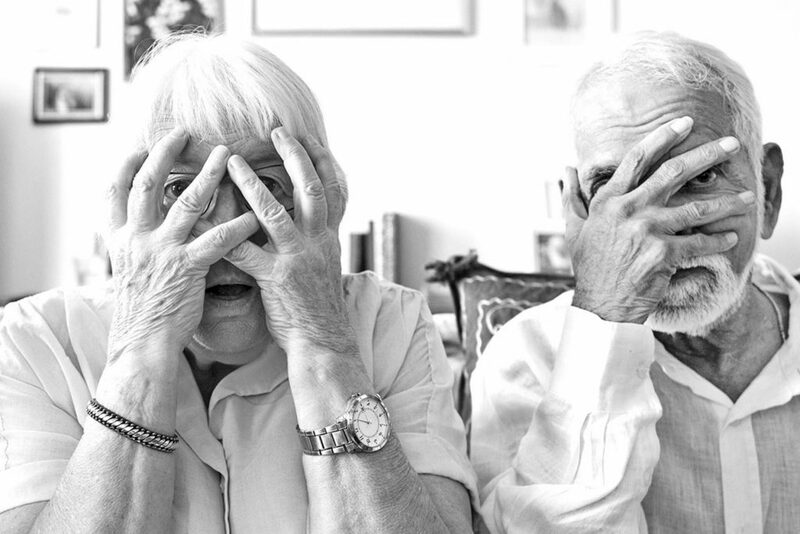 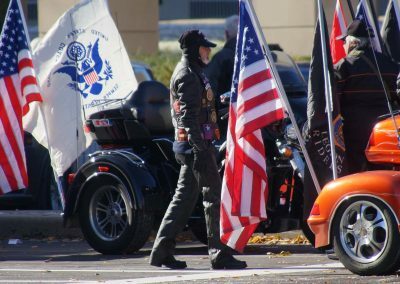 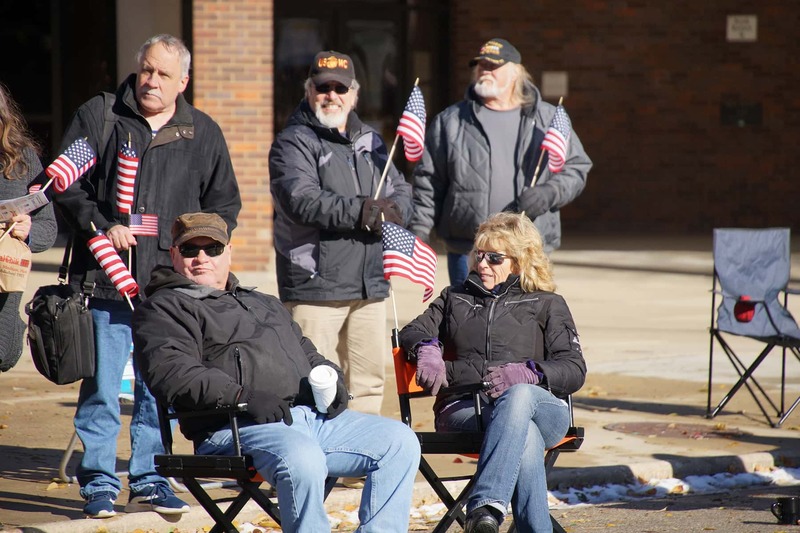 However, for all the time those individuals had to vent their opinions on Facebook and Twitter, they made no time again to attend this year’s Veterans Day Parade. 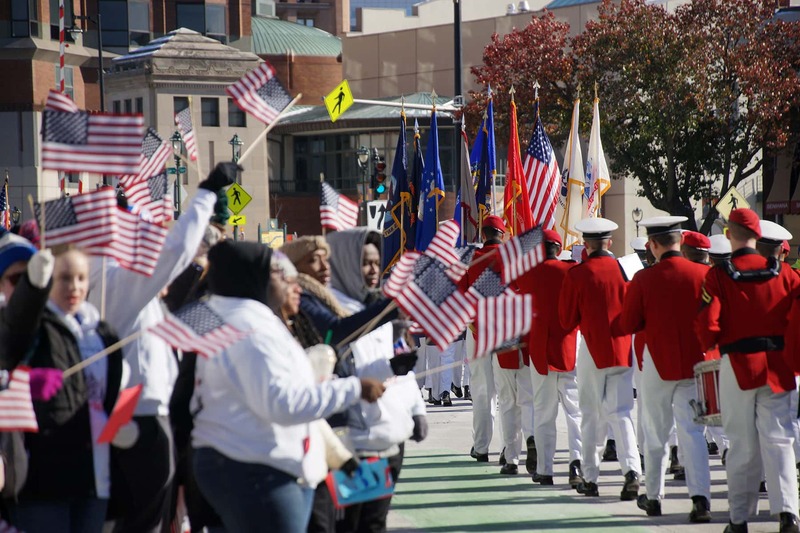 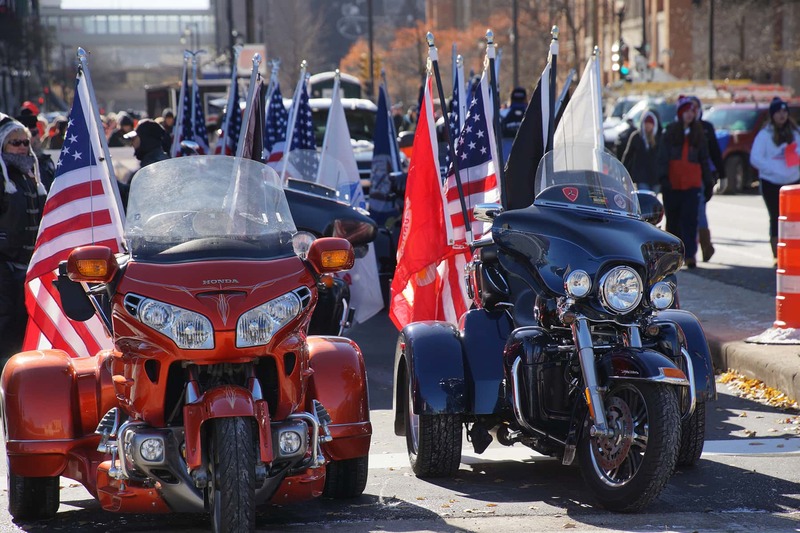 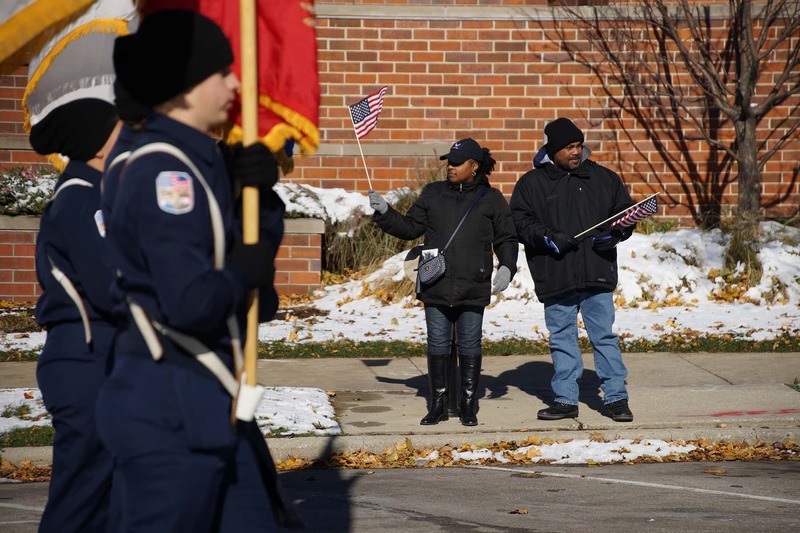 As the name suggests, the Veterans Day Parade honors Veterans. 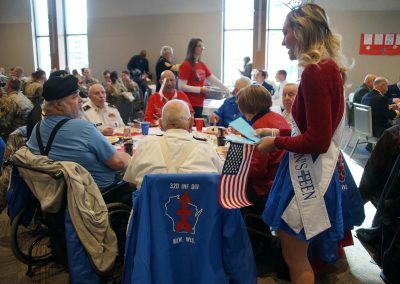 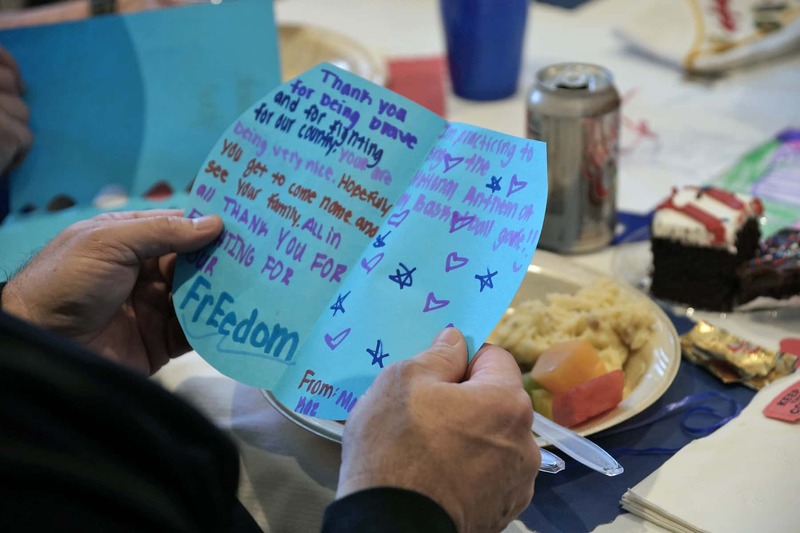 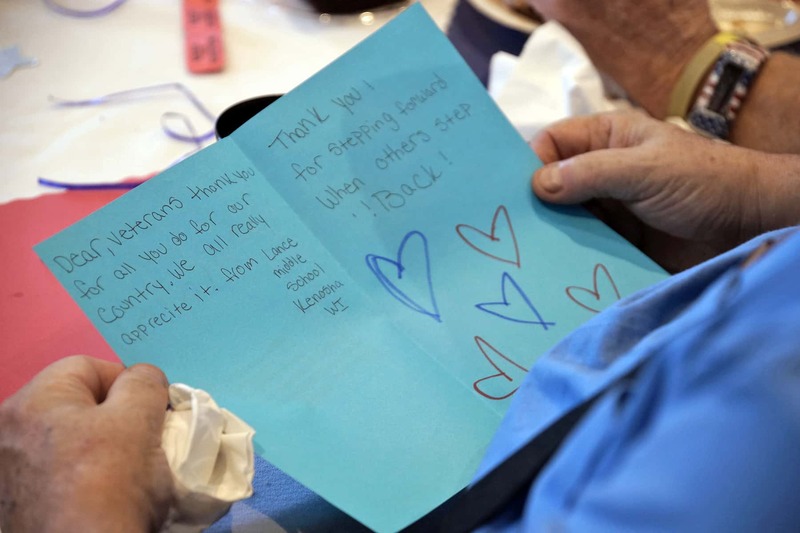 It is an opportunity specifically designed to celebrate veterans, and communities across the region failed these heroes with their absence on November 10. 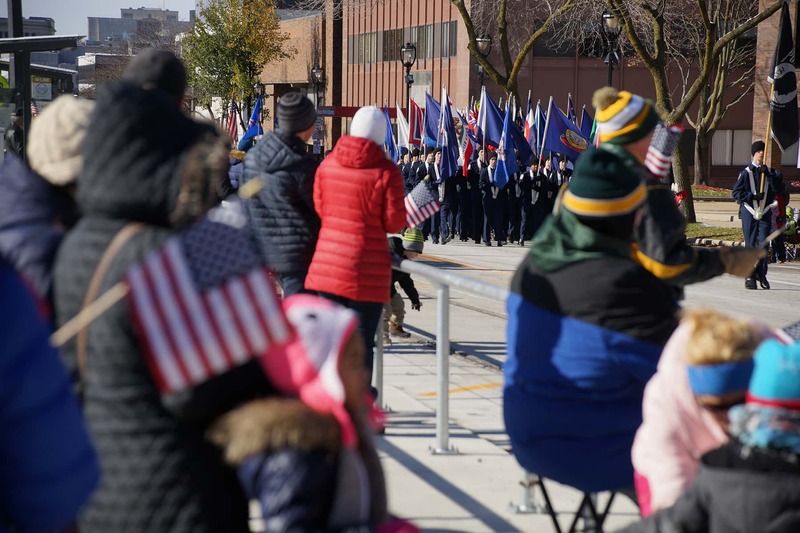 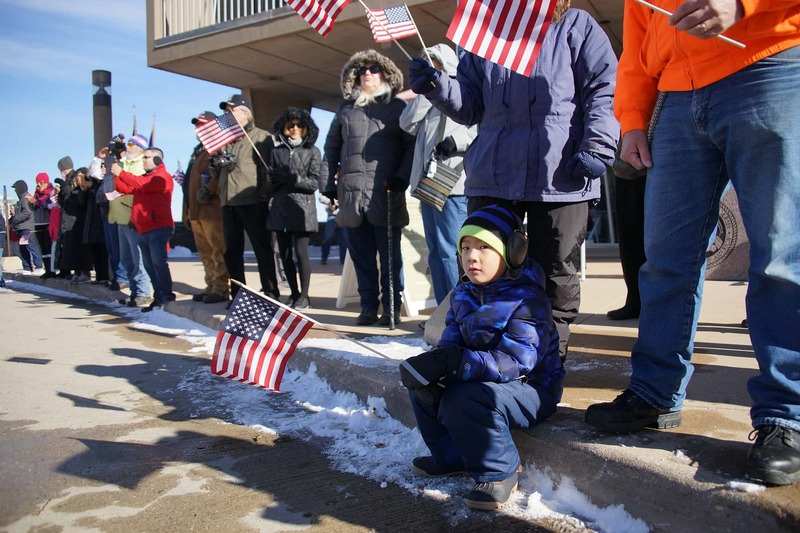 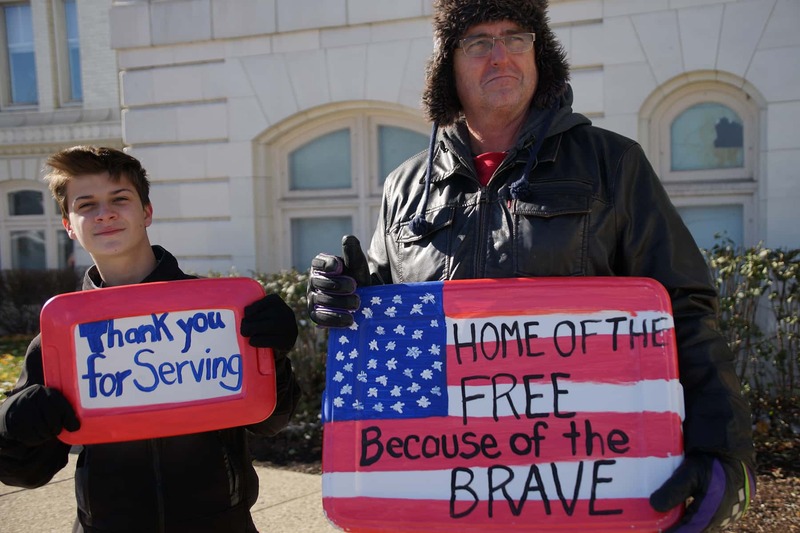 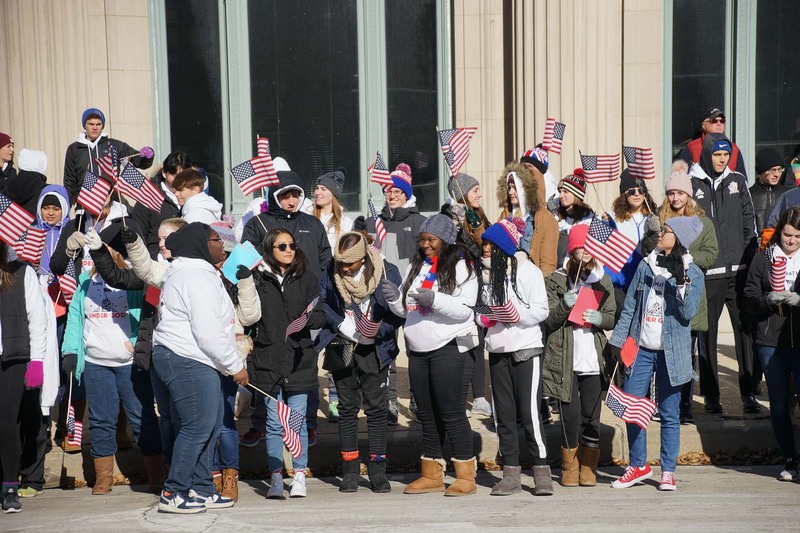 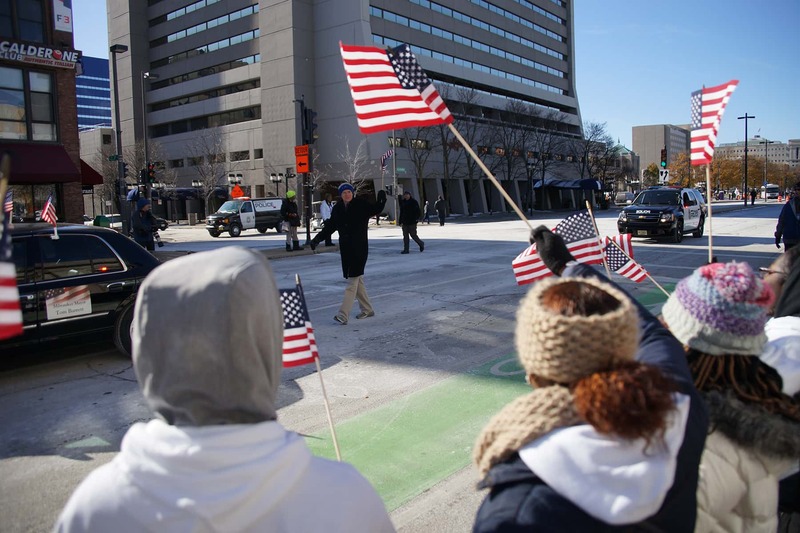 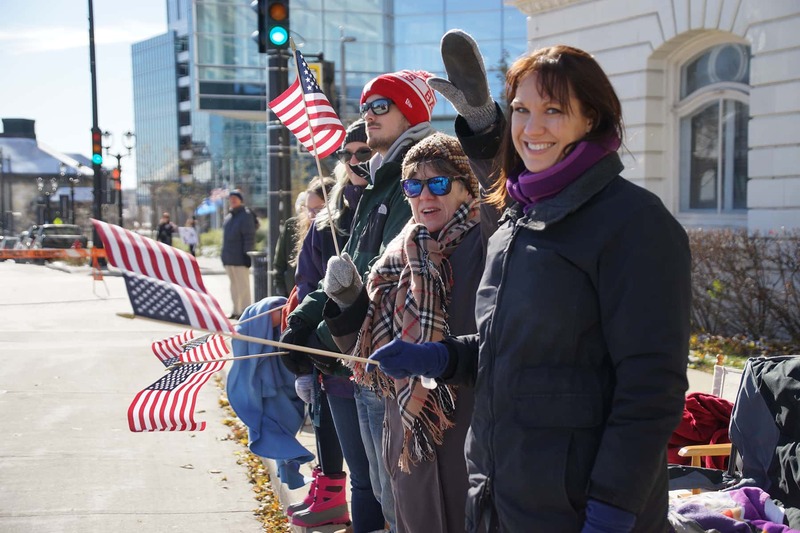 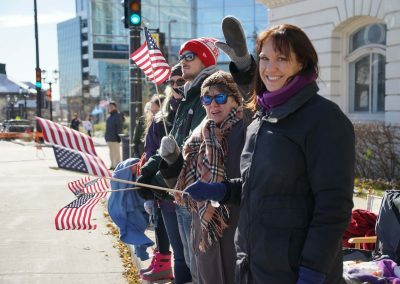 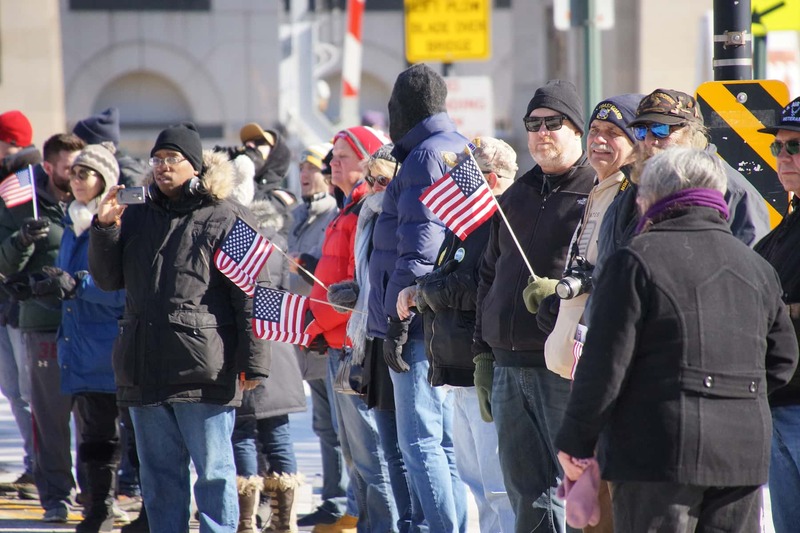 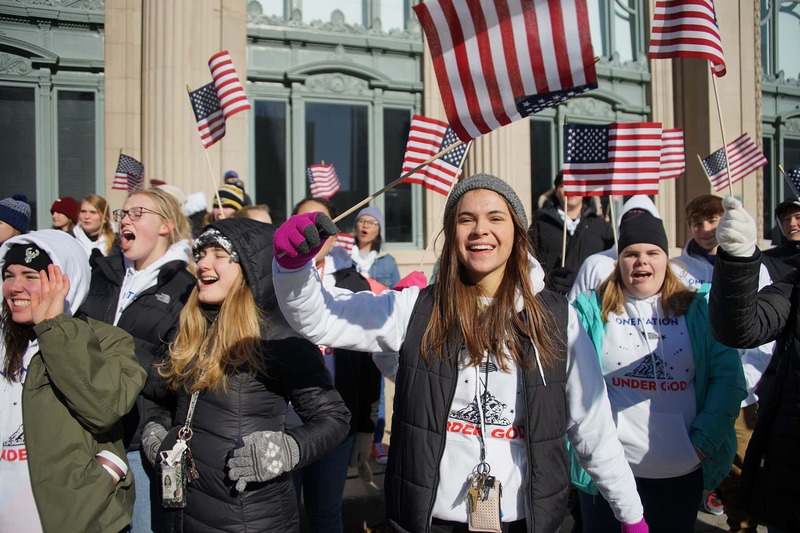 There was a great deal of pride and thankfulness from the spectators who did show up and stood along the parade route, cheering on veterans in appreciation for their service to the nation. 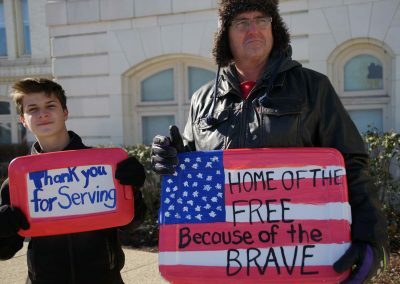 Those voices, however, were far too few. 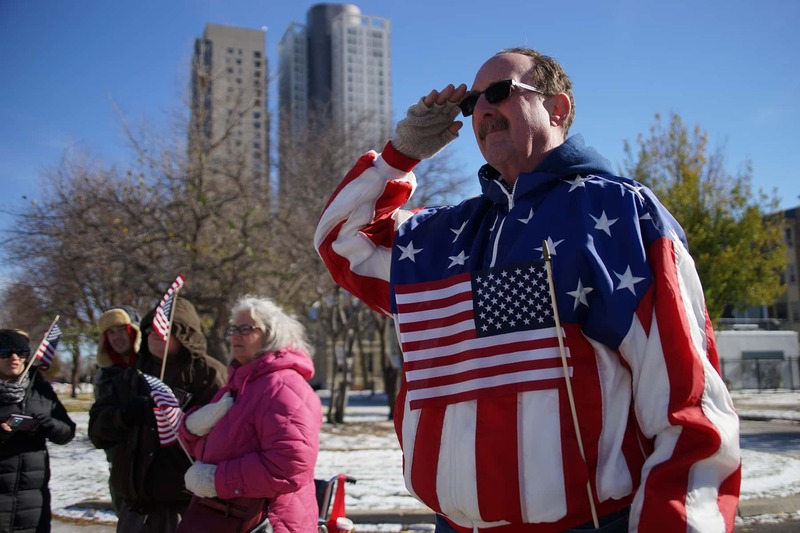 Standing at a sports event is a lazy expression of patriotism, and should not even qualify to be called that. 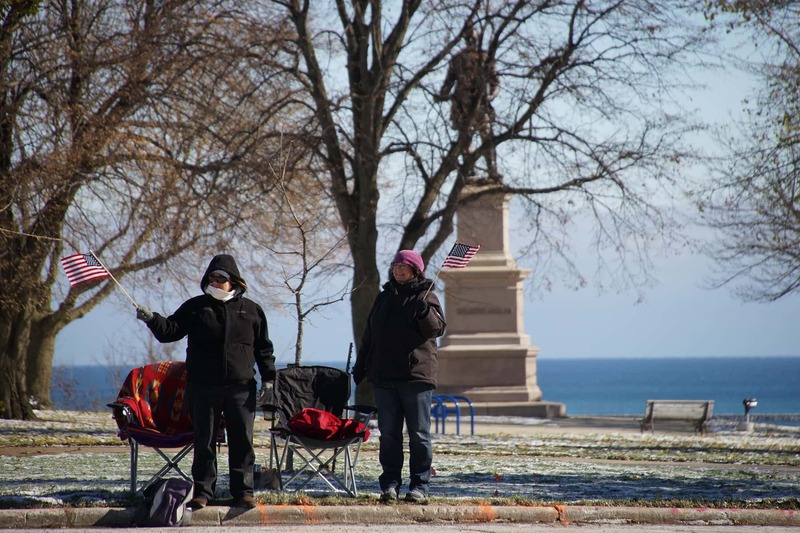 People are there for an athletic game, where they had to purchase a ticket. 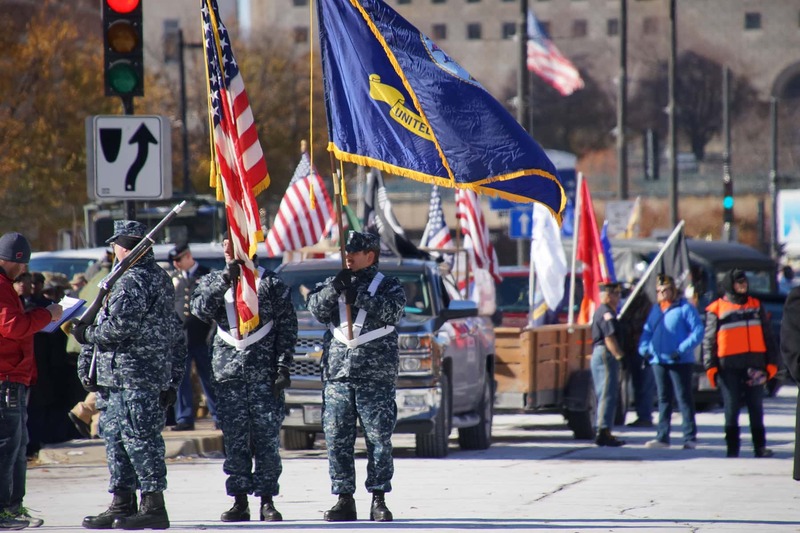 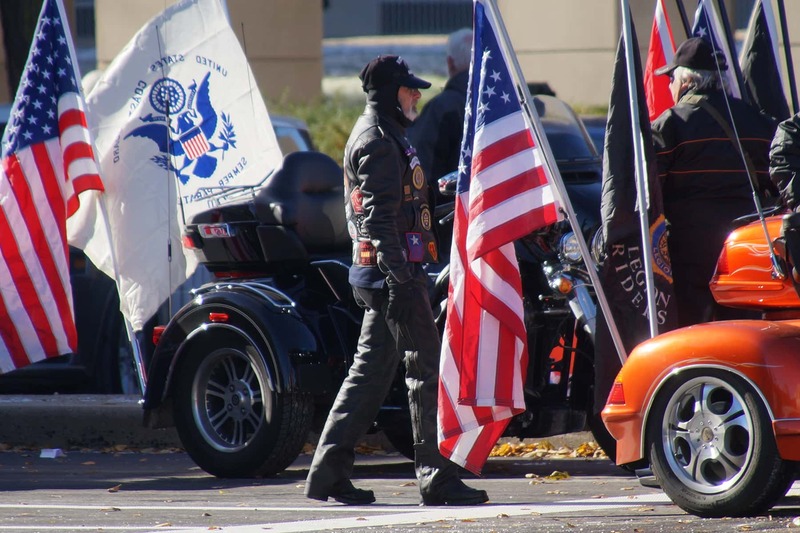 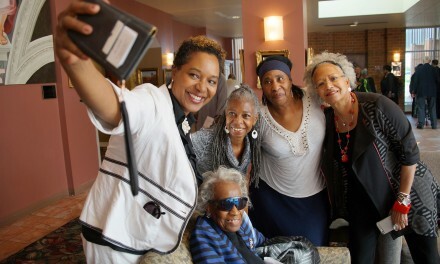 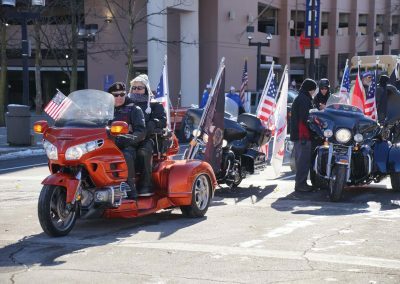 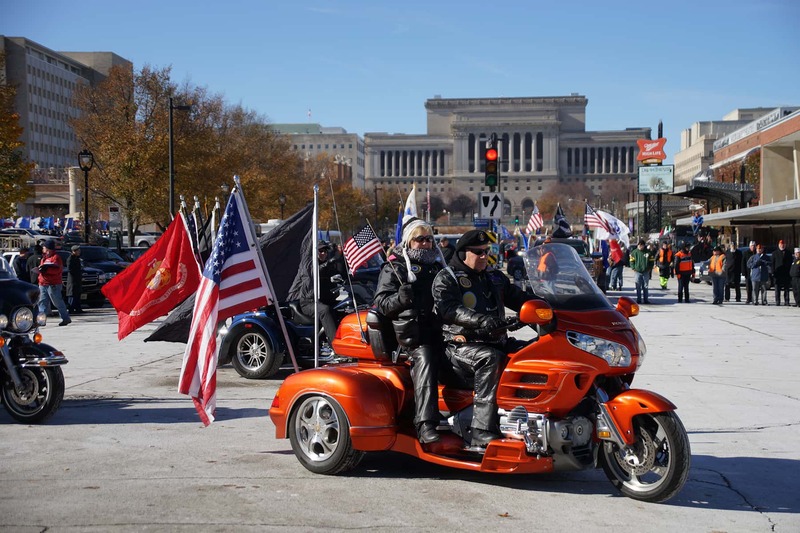 Showing up for a free parade that honors veterans, it is all about honoring the veterans. 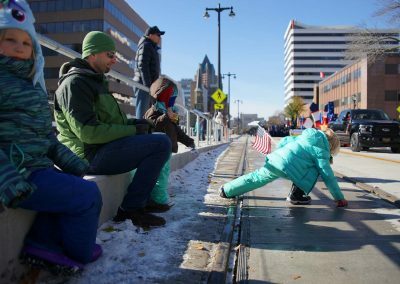 The merest amount of effort is required. 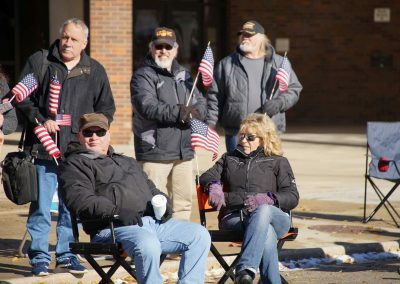 People just need to show up as an expression of support for these hometown heroes.